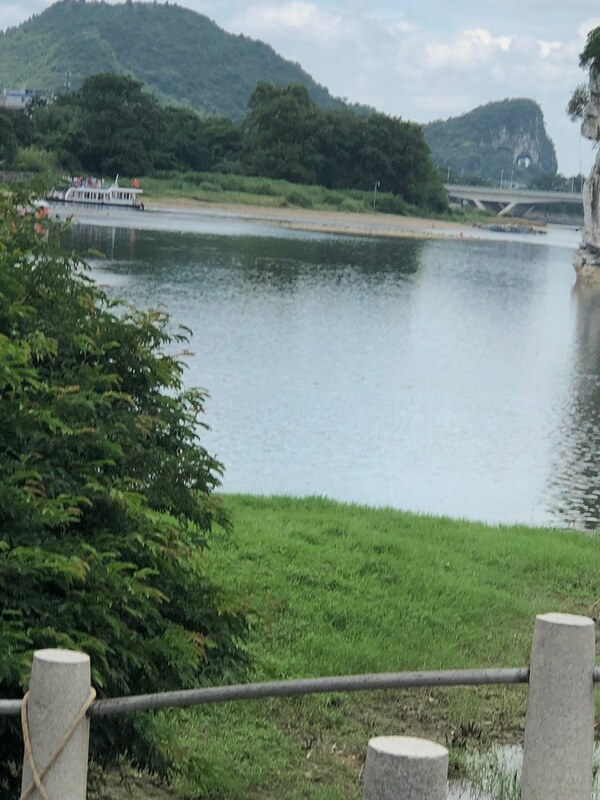 Discussion in 'UK Trip Reports Board' started by dolphingirl47, Aug 12, 2018. We were awake before the alarm went off and I checked out the view. It was absolutely stunning, and I am glad I paid a little extra for a view. We got up and ready and then headed downstairs. Breakfast is officially served from 7:00, which was when we were due to be collected. They set up a little early and we were able to grab some fruit and cake for an early breakfast. I even managed to score a couple of plain steamed buns and some sausages. Once we had our quick breakfast, we headed for the lobby. Our driver was waiting for us. We walked to the car and we were on our way. We got to see some very interesting side streets. 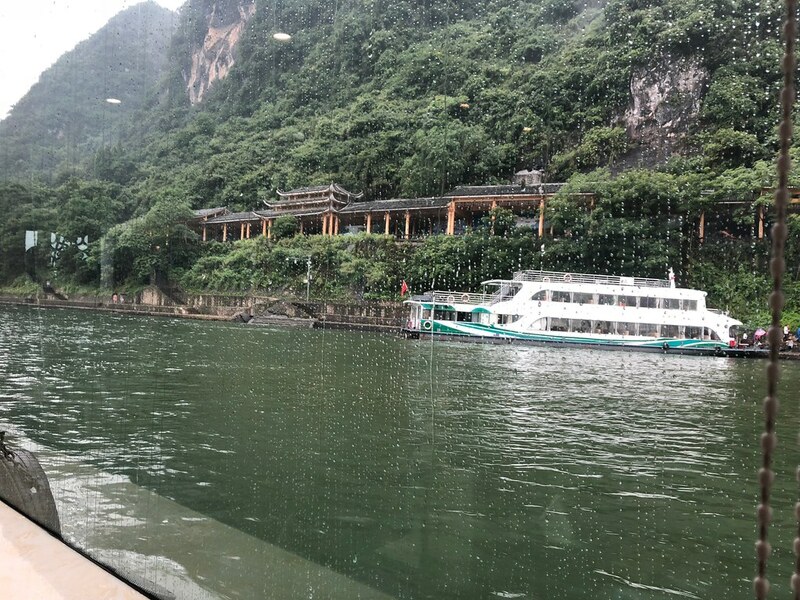 We also got treated to rush hour Guilin-style. The town is absolutely packed with scooters. However, there was no sound whatsoever. It turns out that all the scooters and even most of the cars are electric. I was absolutely fascinated by this. We got a god overview of the town on the way as well. We pulled up to the hotel and our driver made a call. He then handed the phone to Graham. 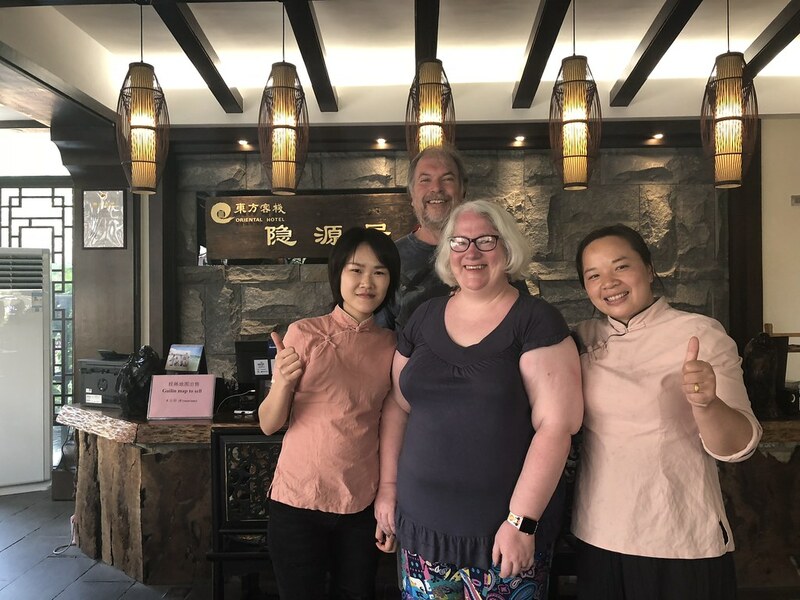 It was our tour guide who advised that she was running behind schedule and that we should wait for her in the hotel lobby. She advised that she would be with us in about 45 minutes. The hotel was gorgeous, but I still preferred our hotel. After a while, we were joined by another group of people who were staying at this hotel. In the end, Jenny turned up about an hour after we arrived. We could have had a proper breakfast after all. The bus was waiting for on the other side of the road. Getting across during morning rush hour was a little scary, but we managed. We picked up people from two further hotels and then we headed to the port. 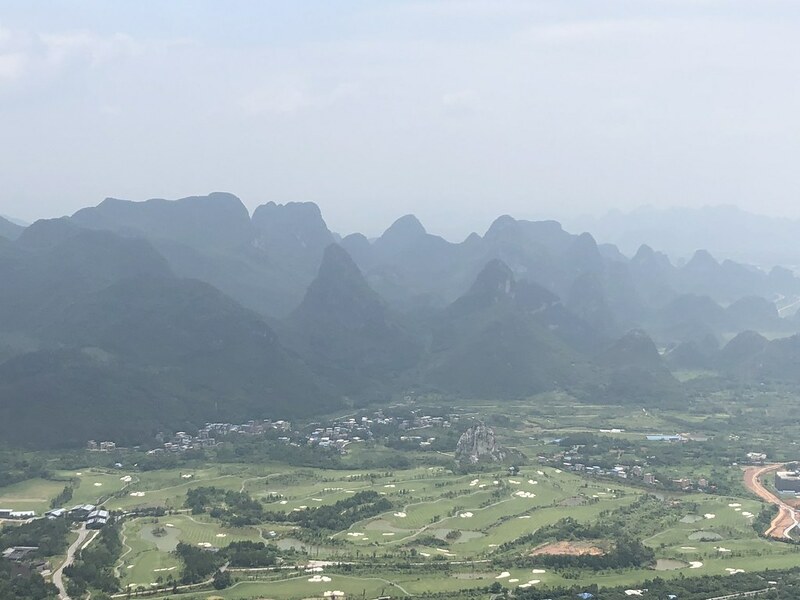 We got a good idea just how big Guilin is on the way. 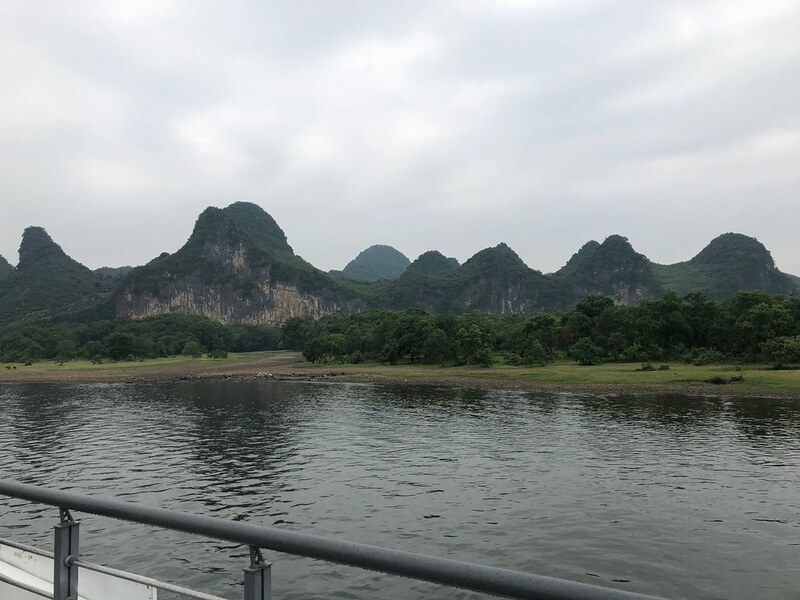 Jenny told us a bit about Guilin and the surrounding area and also about what to expect of the day. We arrived at the port shortly afterwards. We had our passports checked and went through security. Then we headed for our boat. Port is overstating things a little. Apart from the building where we went through security, there were a couple of moorings with 4 to 5 boats moored abreast. We head to go across two other boats to get to ours. Once we were on board, we went to find a table. We were initially sent upstairs and then were sent downstairs again. 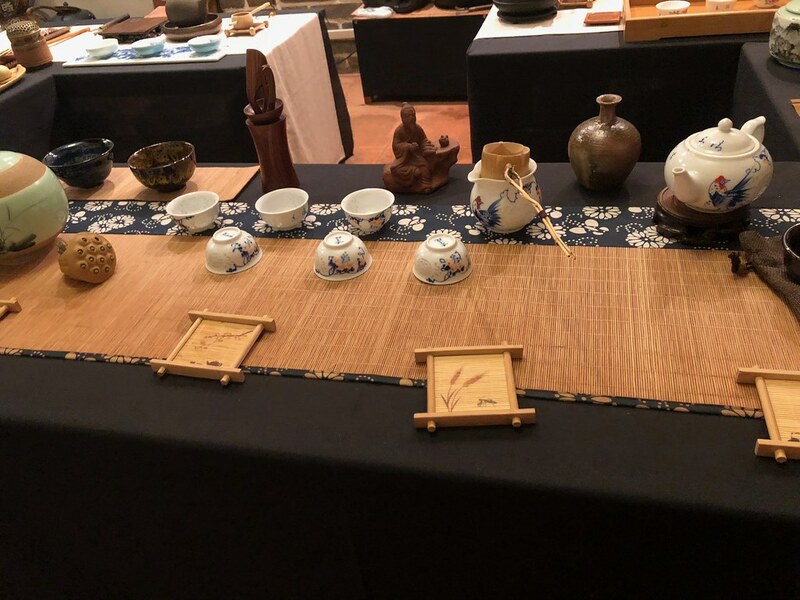 There was a tea pot and traditional tea cups on each table and as soon as everybody had settled down, hot water was brought around. Unfortunately, the tea came in the form of tea bags, but the tea still hit the spot. Then came the time for the upsell. 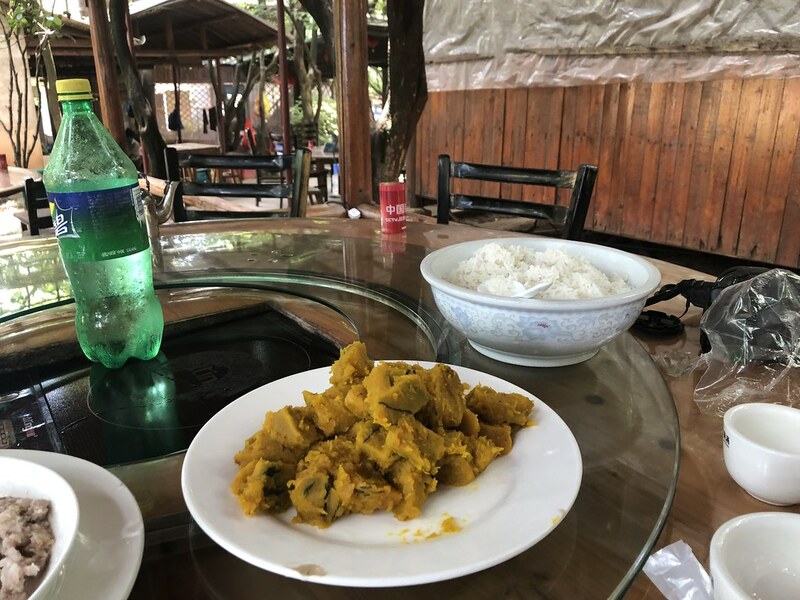 A buffet lunch was included, but you could purchase fresh fish or seafood from the river to supplement lunch. We passed. We did however purchase an excursion for the trip back, which took in two local villages. 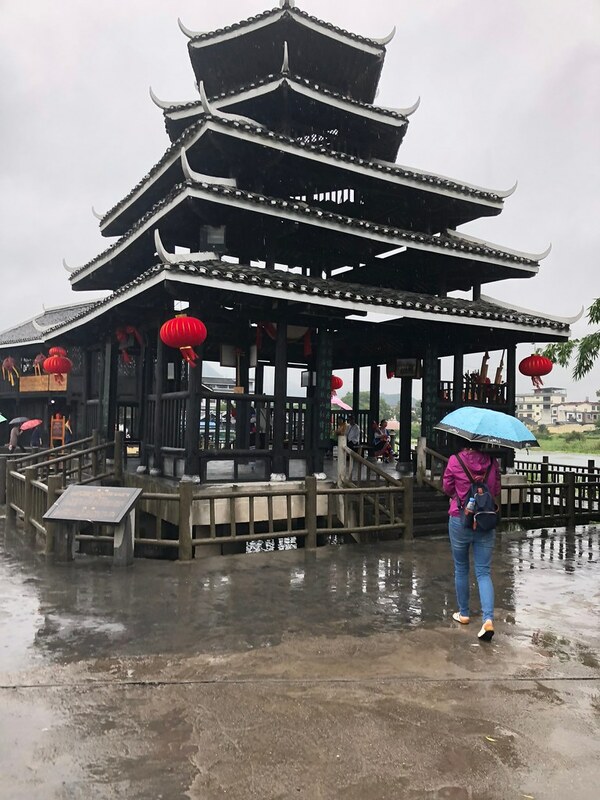 The return transfer was included, and we could have gone straight back to Guilin after the river cruise, but the excursion sounded interesting and at 150 Yuan for both of us, it was a bit of a bargain. 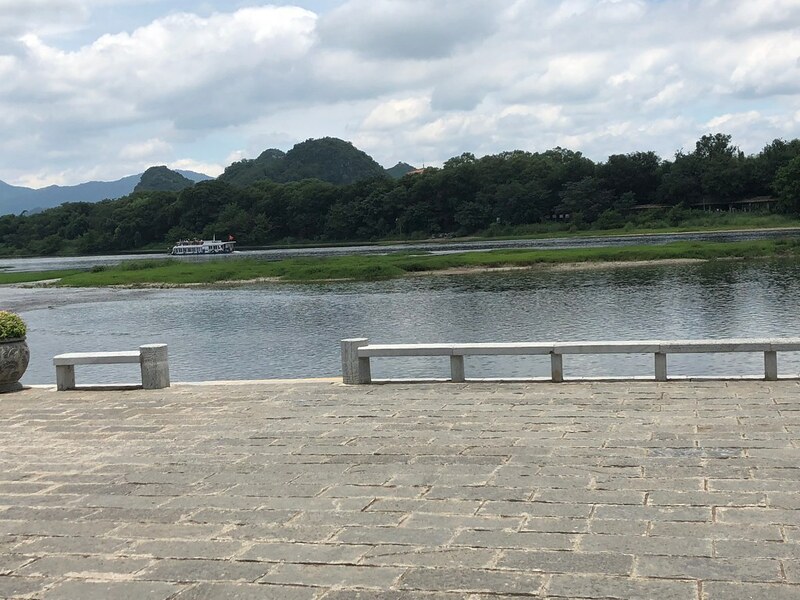 While Jenny told us about the excursion, she also pointed out various highlights along the river on a map that was on the table and gave us a rough timeline. Soon we were on our way. Initially the area was quite urban even though there did not seem a lot around when we drove up to the port. It did not take long until we reached more rural parts though. 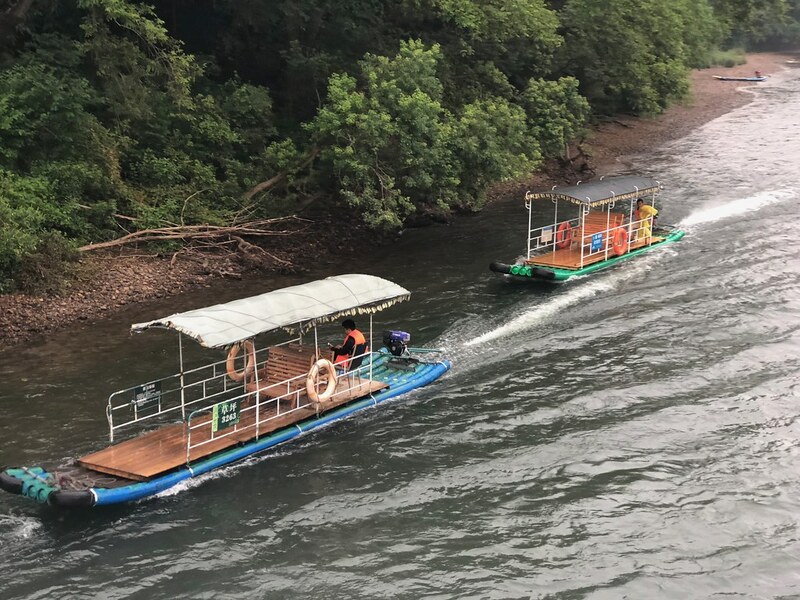 The urban landscape was replaced by greenery and the pleasure boats by bamboo rafts. 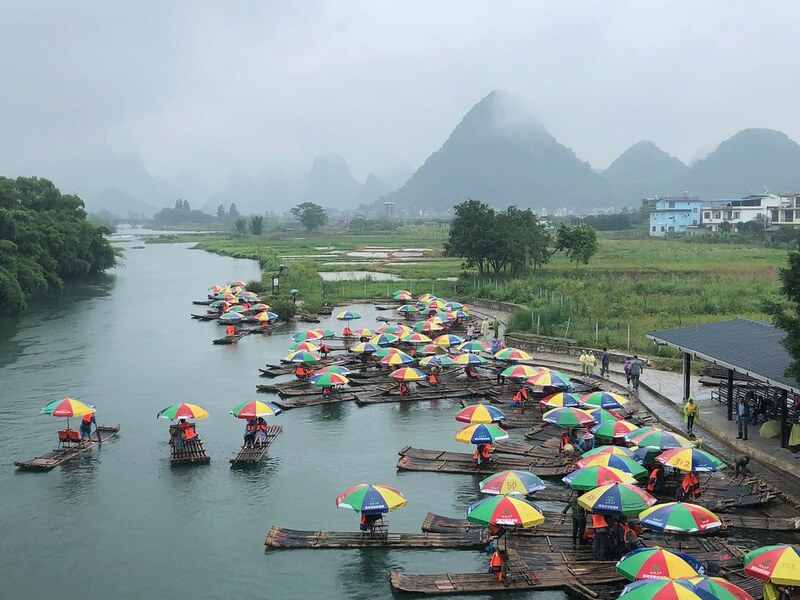 I say bamboo rafts and they look like they are made from bamboo, but I am pretty sure they are made from fibreglass. 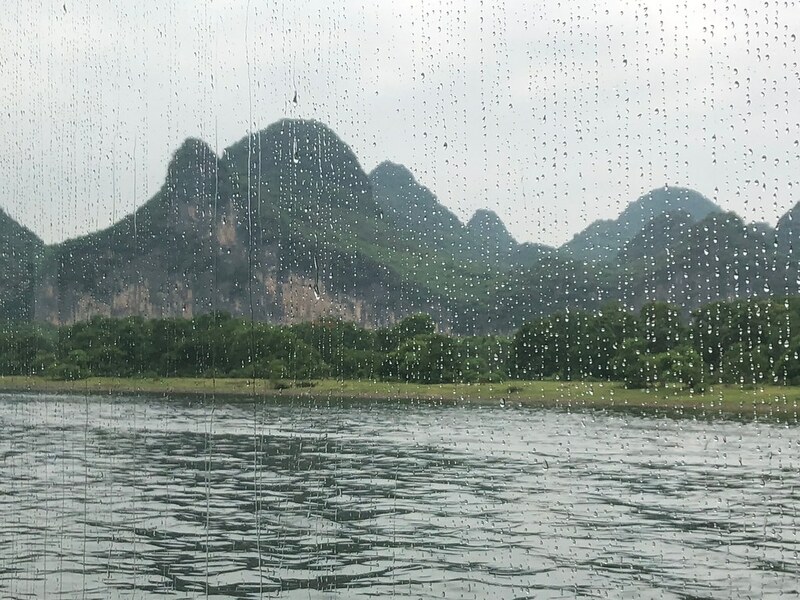 It was raining quite heavily when we got to the first of the mountains. 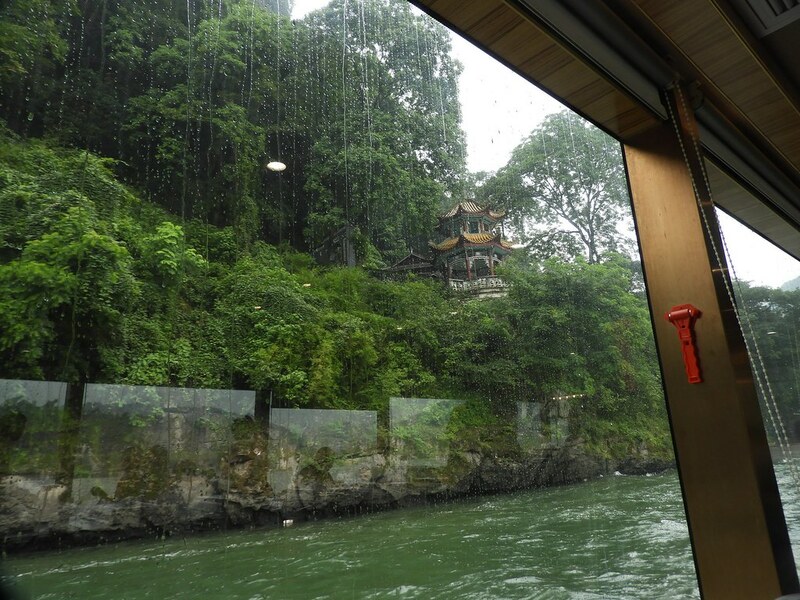 Fortunately, this was only a passing shower and once it eased off, we headed upstairs to the open deck. There we met a fellow traveller from Texas. 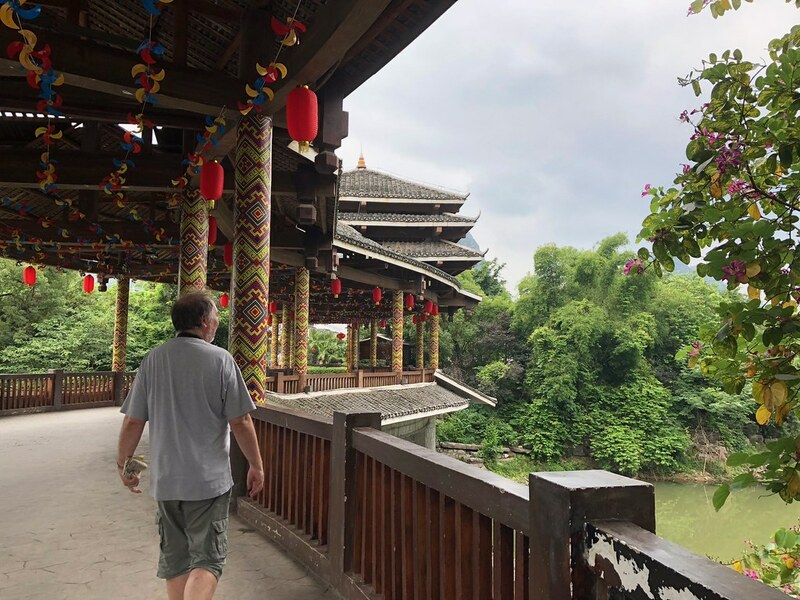 He was in China with his grandson and this was their first visit. His grandson goes to school with a boy from China and his family had invited them to stay with them. I thought this was a lovely story. We admired the scenery for a while until the next shower came through and we went back downstairs. Once the rain eased off, we headed back upstairs until the next shower passed through. When I came back downstairs, they had started to serve lunch. Lunch was a buffet. It smelled and looked delicious. 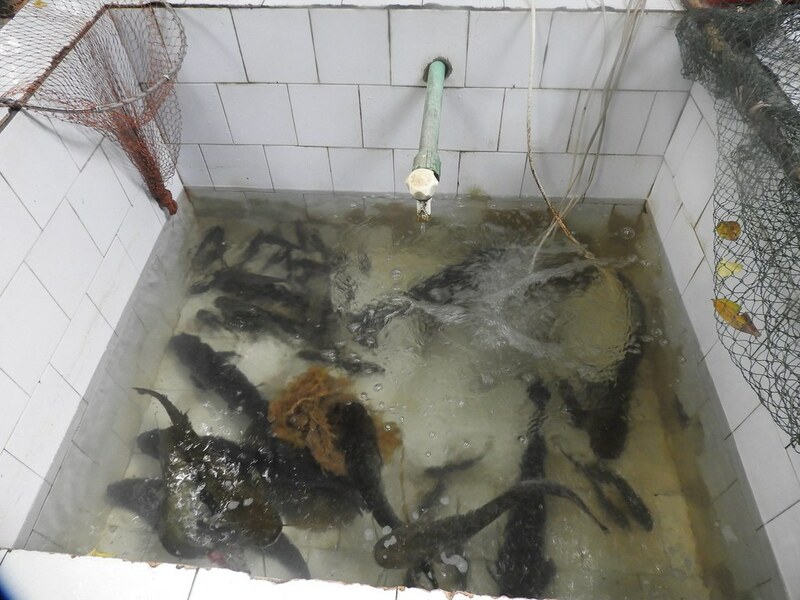 The problem was that nothing was labelled, and I assumed that a lot of it was probably fish, which I don’t eat. I played it safe and only had food that I could clearly identify. 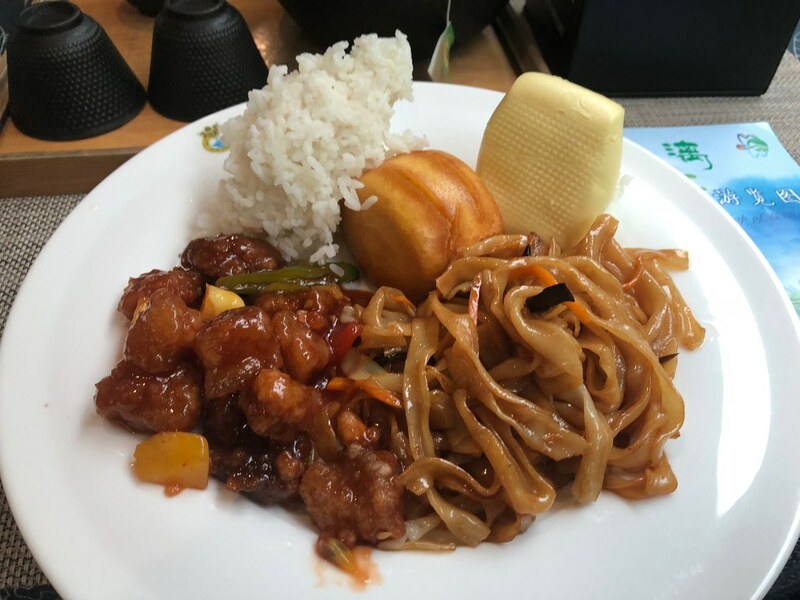 I had rice, sweet and sour pork, vegetable noodles and plain steamed and fried buns. I also had a selection of tropical fruit and the best cookies I ever tasted. They were like a shortbread, but with sesame seeds. I kept going back for more. Graham tried a bit of everything and enjoyed his lunch. I decided to stay inside after lunch. Graham went upstairs one more time. I think at some stage I must have fallen asleep as time seemed to be passing awfully quickly. 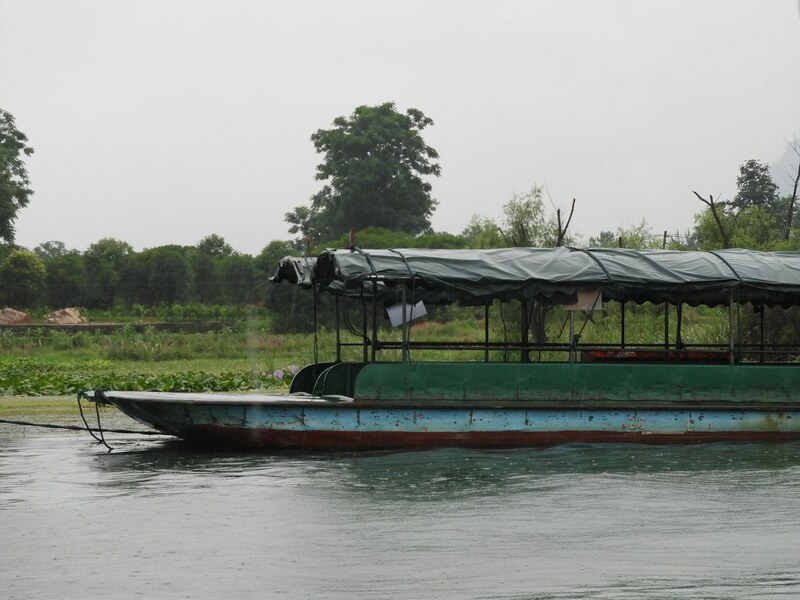 Once we got closer to our destination, the river got busier again with boats passing us and also coming the other way. 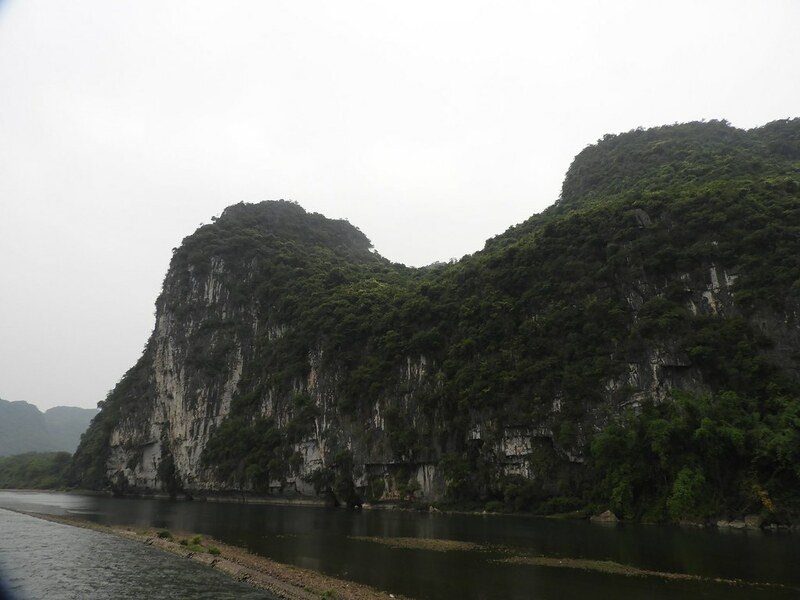 The scenery also changed and there were now fields and small villages along the river. Soon we got to our destination and the first part of our adventure was over. Jenny waited for us on the dock and told us where and when to meet her again. Then we had some free time. On the riverbank was a fisherman with two cormorants. 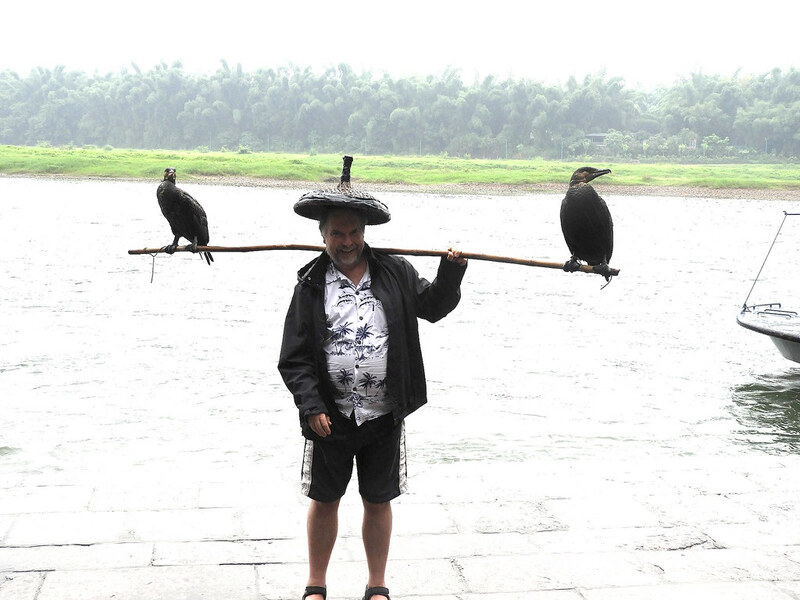 In this part of China, the traditional way of fishing is with cormorants. 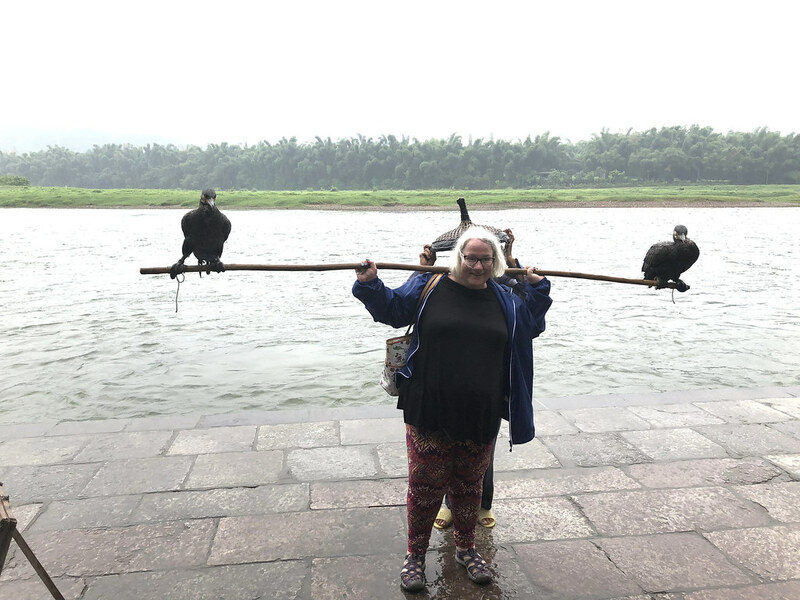 However, the locals have worked out that there is more money in letting tourists take photos with the cormorants than in fishing. 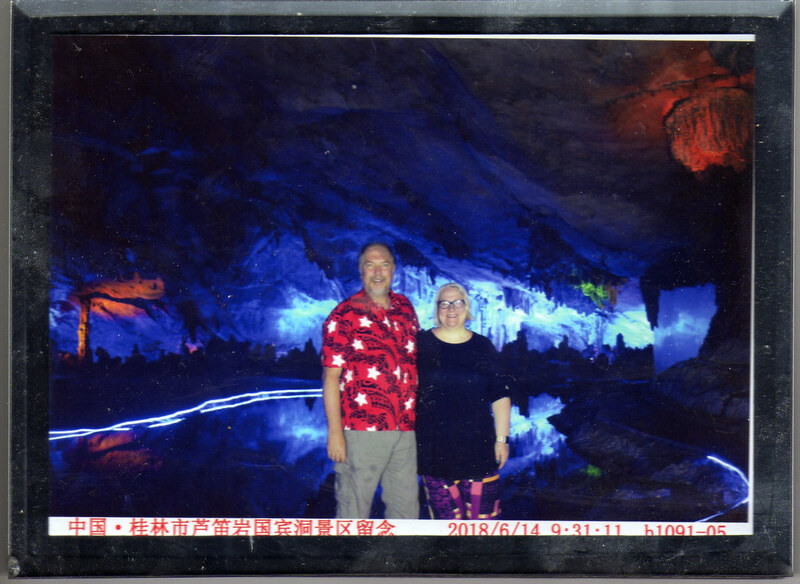 It only cost a couple of yuan so we both had a go. There were some interesting buildings in the area and a little market selling fruit and souvenirs. 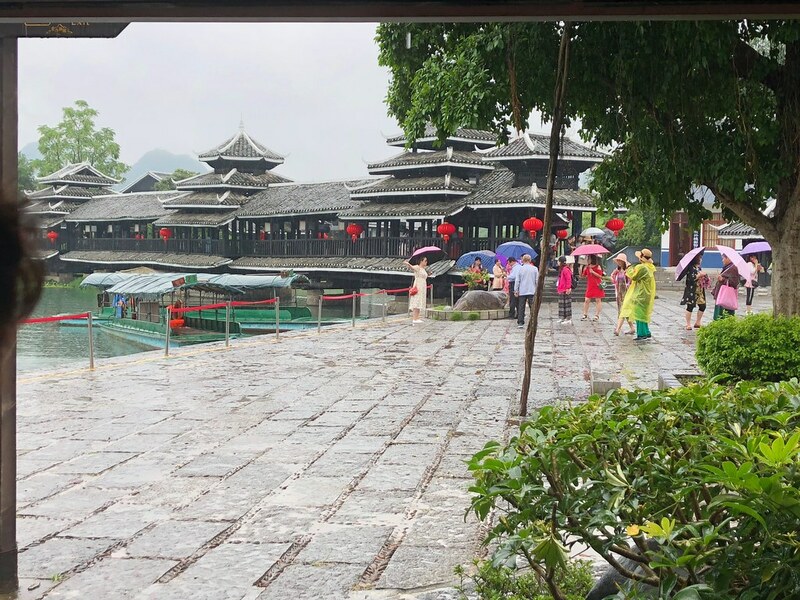 They had beautiful embroidered umbrellas made from chiffon. As it was raining pretty heavily again, they would have made a fortune if they had made from a sturdier material. 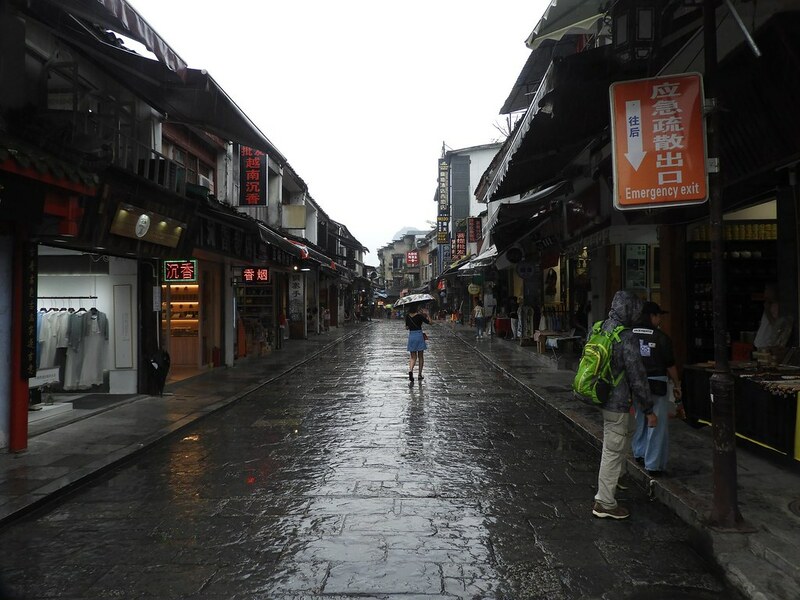 We then headed for West Street, which is the main pedestrian street through Yangshuo. It is also an unashamed tourist trap. It very much reminded me of similar streets in the Rhine valley. 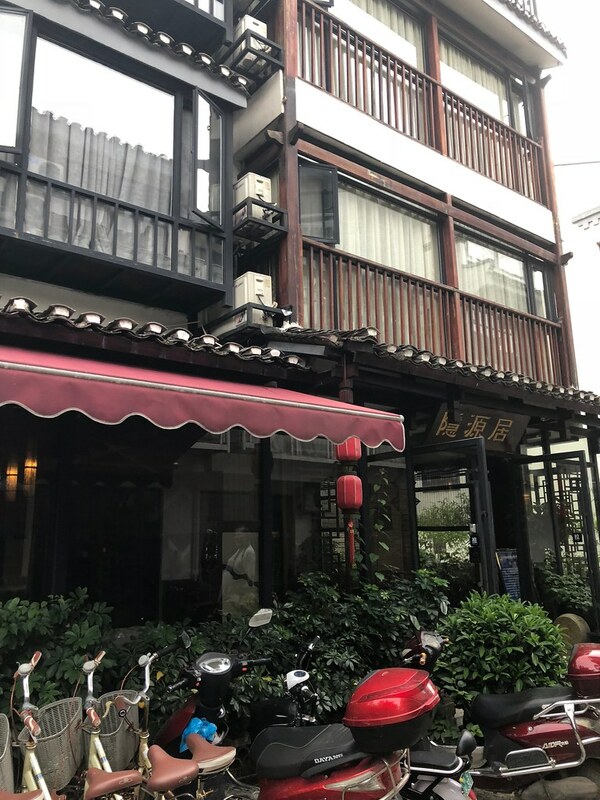 Most of the street was lined with souvenir shops, bars and cheap restaurants and take-aways, but there were some shops that were of interest including a tea shop. We got to try various fruit and herbal teas and I managed to buy some herbal Osmanthus tea. 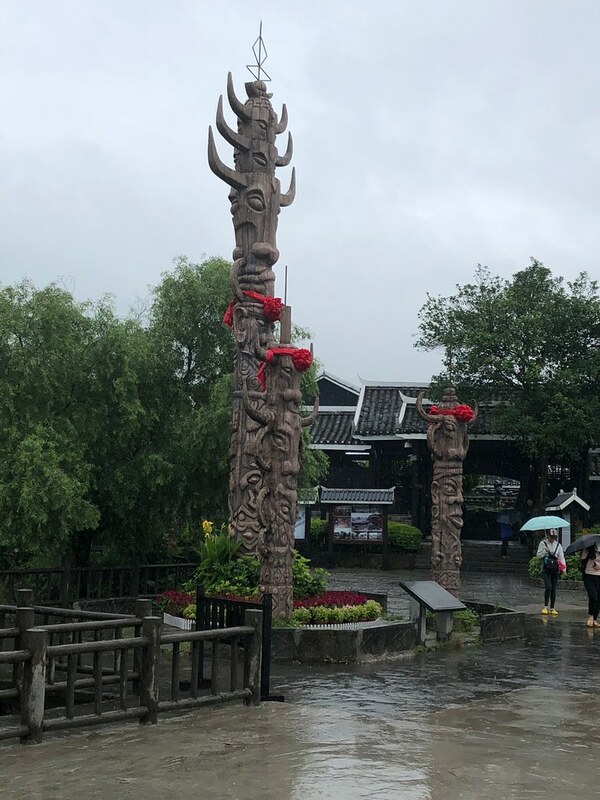 Osmanthus is related to the olive tree, but produces very fragrant white flowers that are dried and either used alone as a herbal tea or mixed with green tea. 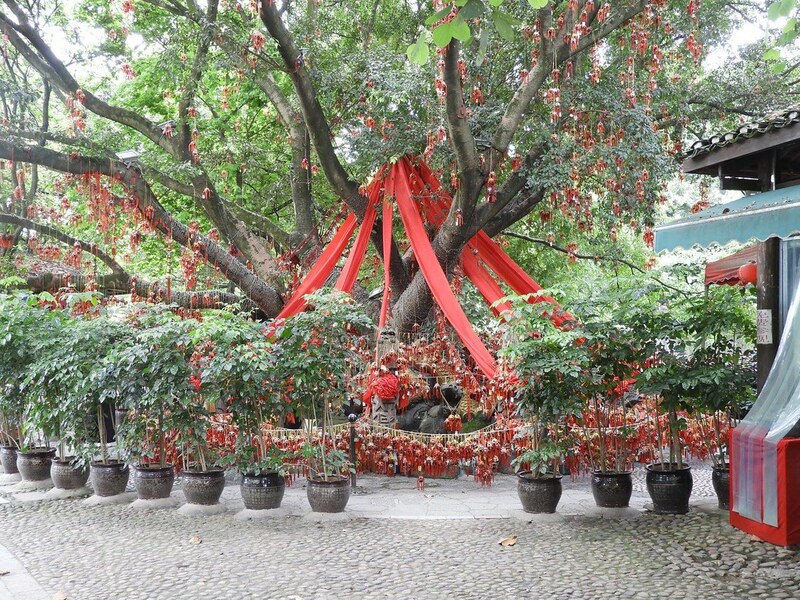 The area around Guilin is famous for its Sweet Osmanthus trees. I had always planned to get some Osmanthus tea, but I expected the kind that is mixed with green tea. We got to try some at the shop and this was absolutely delicious. It has a flavour that is similar to apricots. I ended up buying a tin of Osmanthus tea to take home. As we approached the end of West Street, we saw some interesting architecture. If the weather had been better, we would have gone exploring, but the rain was pretty strong at that time. I took a couple of photos and then headed to a bank to get some cash. The bank was right next to KFC, which was our meeting point. Once I had my cash, we went inside KFC. Jenny was already there as was the gentleman from Texas me had met on the boat. We chatted for a bit while we were waiting for the rest of the group to arrive. Jenny recommended that we use the bathroom before we leave. I thought that was a great idea. I figured Western fast-food restaurant would equal bathroom with throne. Unfortunately, I was wrong and finally had to make friends with a squat toilet. It was not as bad as I thought, but I was still hoping that I would not have to repeat the experience anytime soon. Once everybody was assembled again, Jenny escorted us the short distance to the bus. 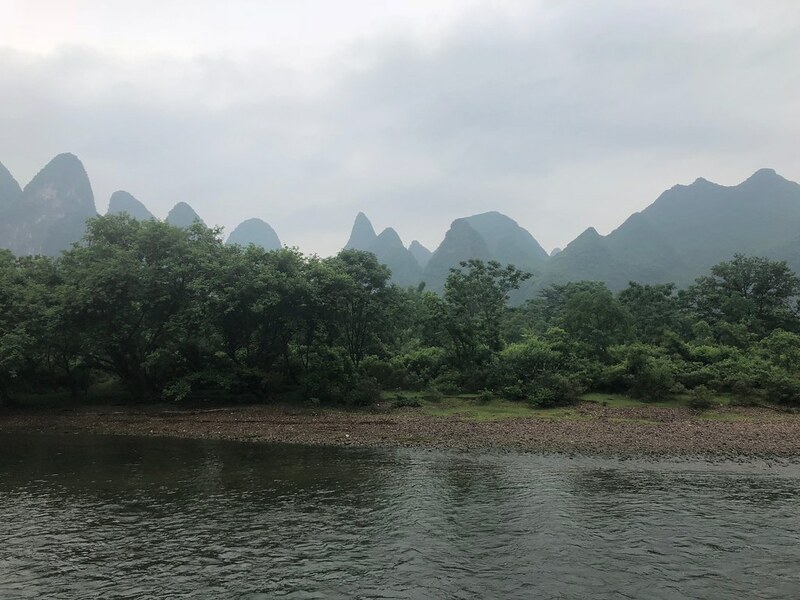 We then headed to Yulong Village. 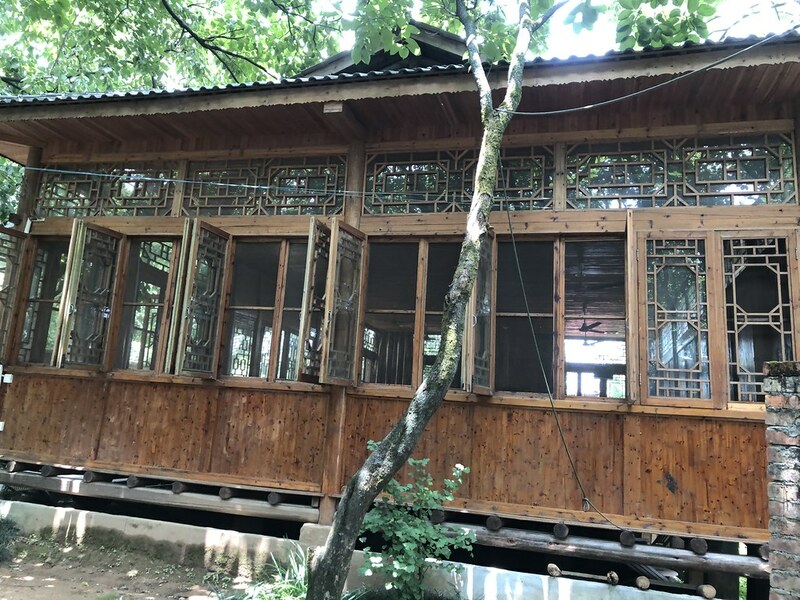 We came past a traditional house that used to belong to a wealthy merchant family, but unfortunately has been allowed to fall into disrepair. Even in this state, it was still beautiful, and Jenny pointed out various traditional features and what they mean. The house has now been bought by the local government and hopefully will be restored to its former glory. This house was on a very narrow alley and unfortunately it was impossible to get a photo. We then walked across a farmers’ market to the reason why we had come here. 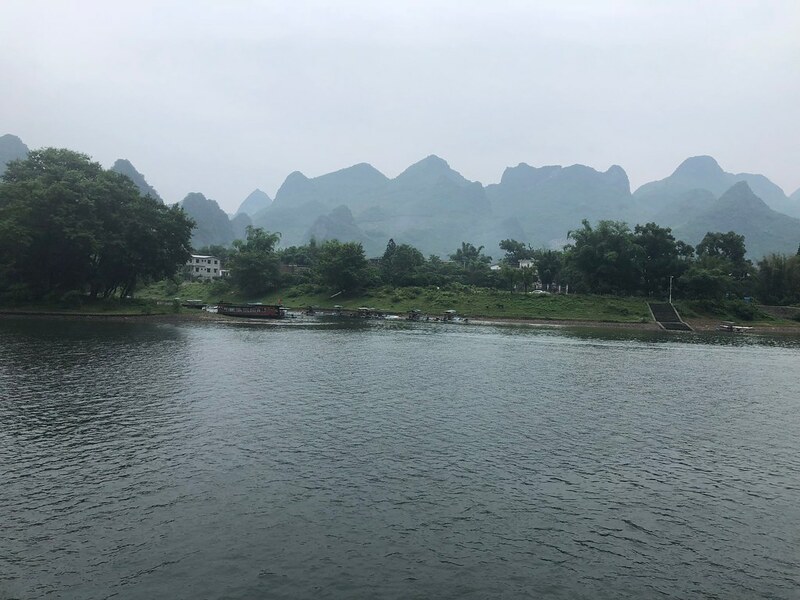 Yulong Village is on the banks of the Yulong river, which is a tributary of the Li river we had been on in the morning. This is a lot smaller and more scenic. 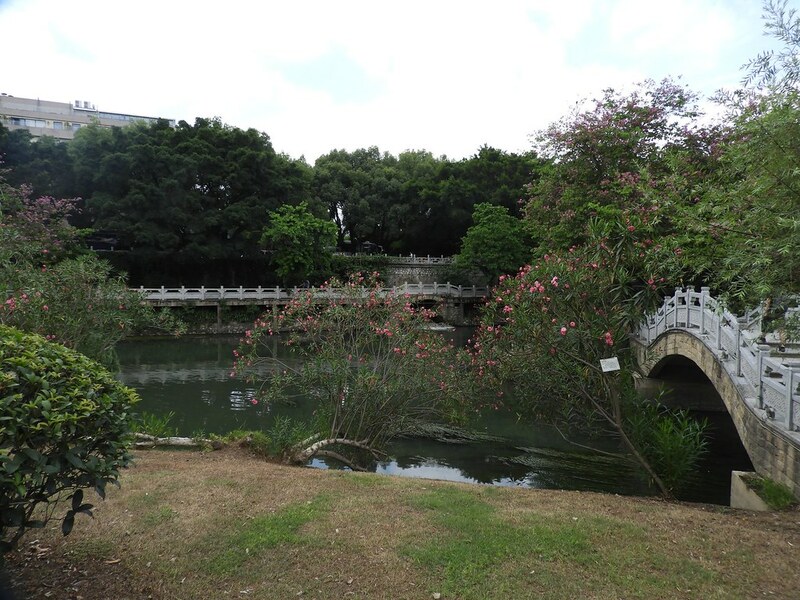 It also features a beautiful arch bridge that was built during the Ming dynasty. Jenny shared a local legend with us. 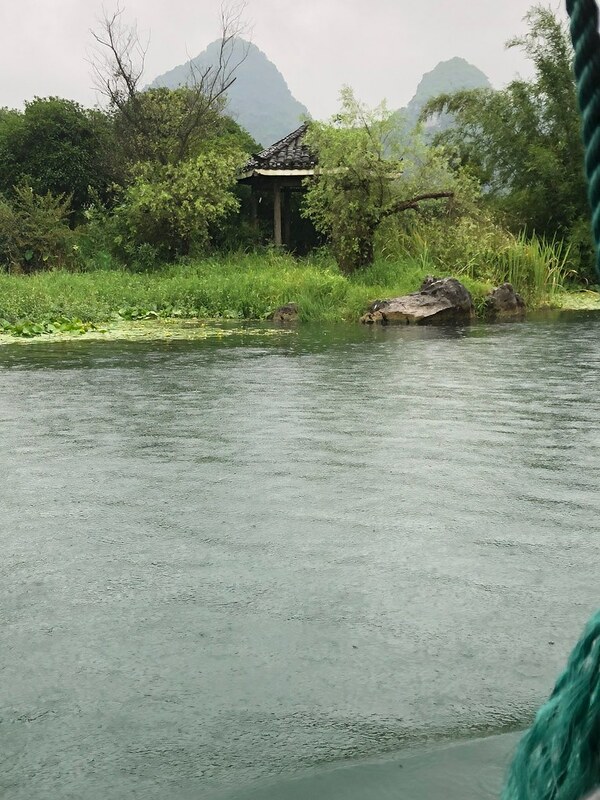 Yulong is Chinese for Meet The Dragon. 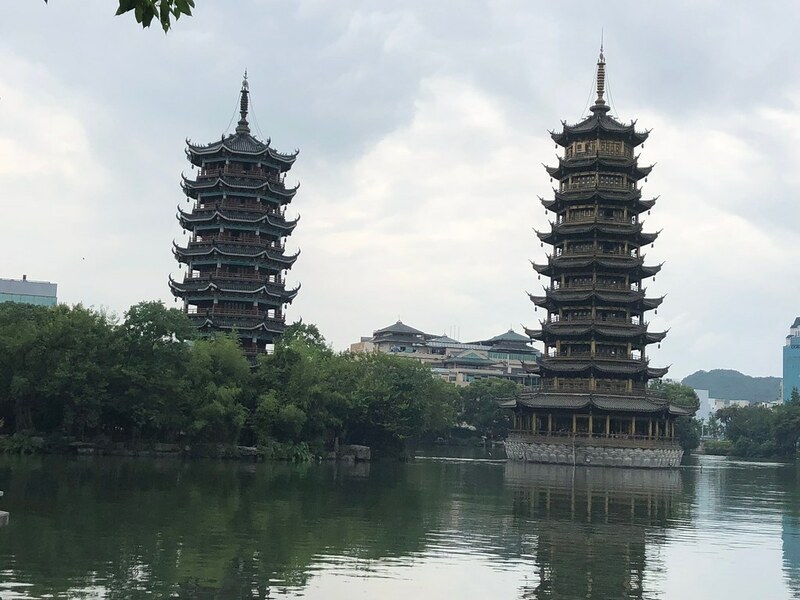 According to the legend, there was a student who needed to take exam in the ancient capital of China. 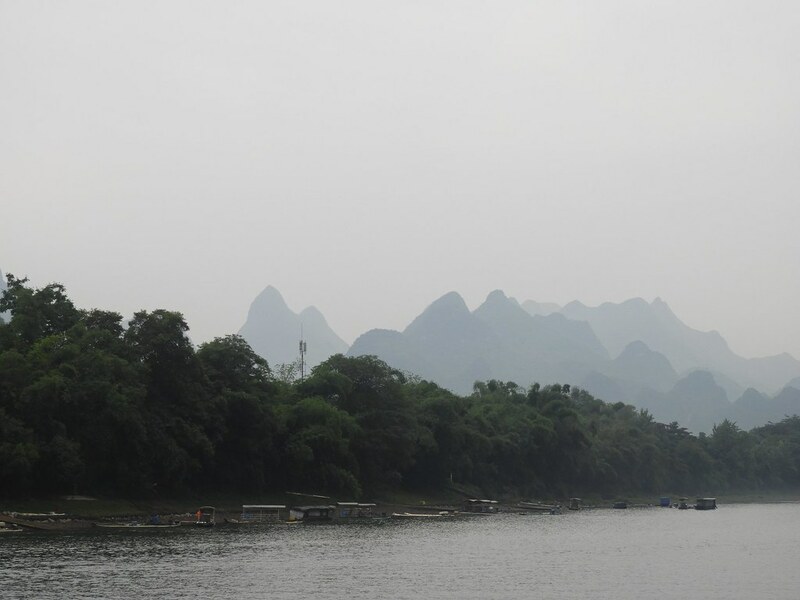 When he came to Yangshuo, he was blocked by the river that is now known as the Yulong River. 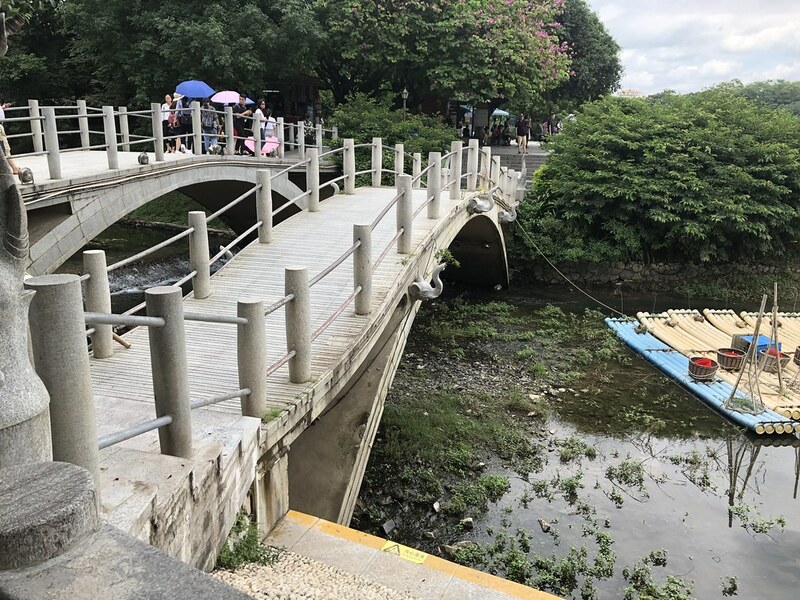 He prayed that he would find a bridge to go across this river so that he would get to the examination on time and promised to build a bridge if he could get to the exam on time. God was touched by his honesty. 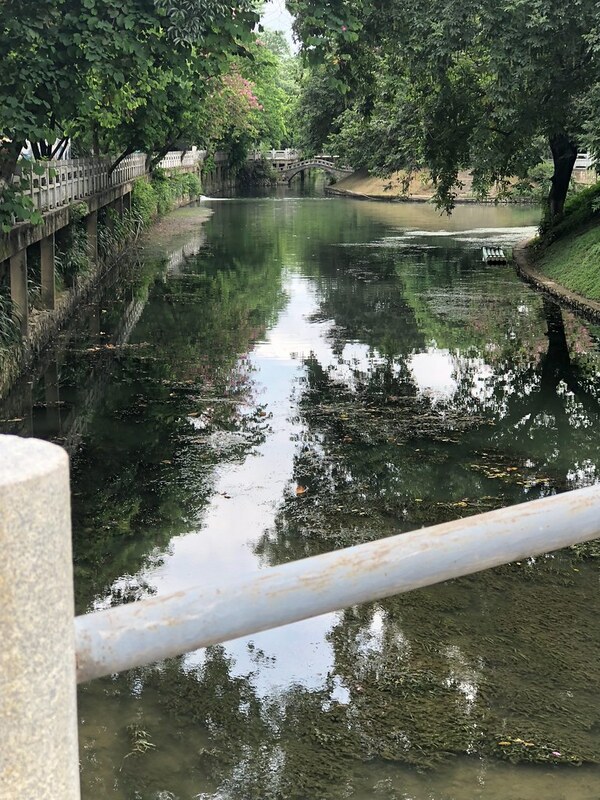 A dragon appeared in the river to help this student. 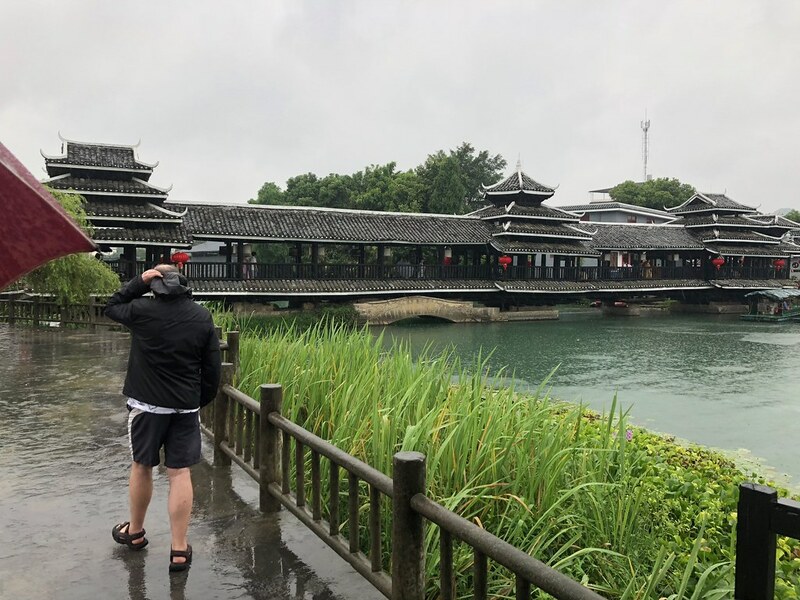 Not only did he get to the exam on time, but he came top in the exam and out of gratitude, he built the bridge and called it Yulong Bridge. We stayed in this area for about 10 minutes to enjoy the scenery and to take some photos. Then we headed back to the bus. Our final destination was Shangri-La. 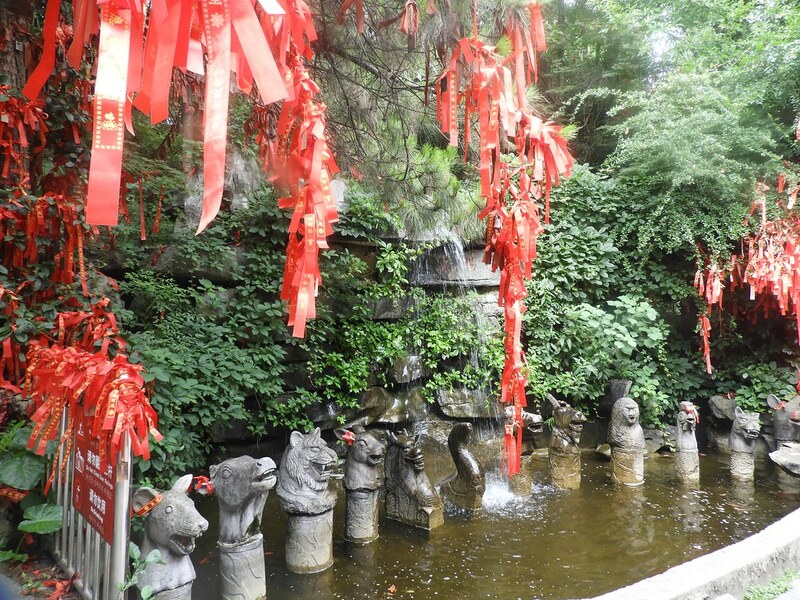 Shangri-La in Chinese means beautiful place and it definitely was this. Essentially this is another tourist trap, but if it is so pretty, I do not actually mind. 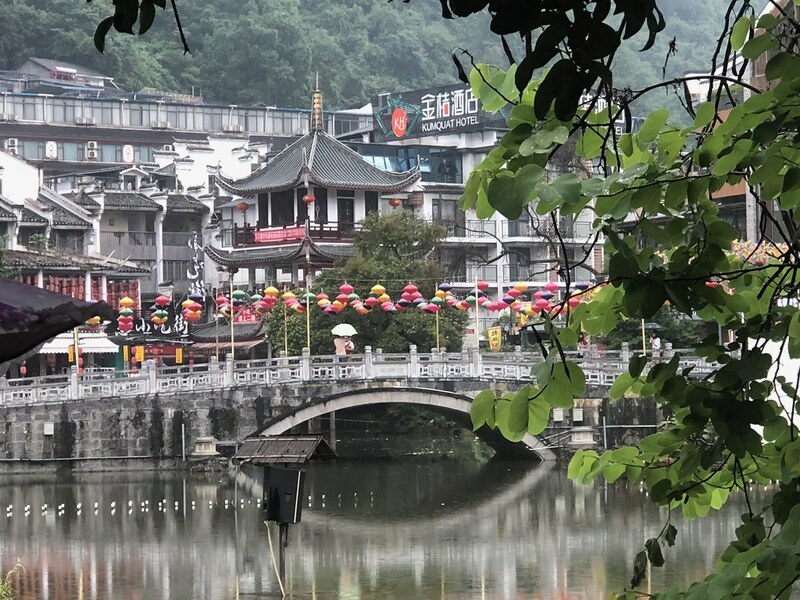 There is a beautiful covered bridge, the Swallow Lake, the Peach Blossom village, which is home to the Dong people and the Yuanming Villa, features the traditional north Guilin style. When we got there, we crossed the covered bridge to get to the boat dock. 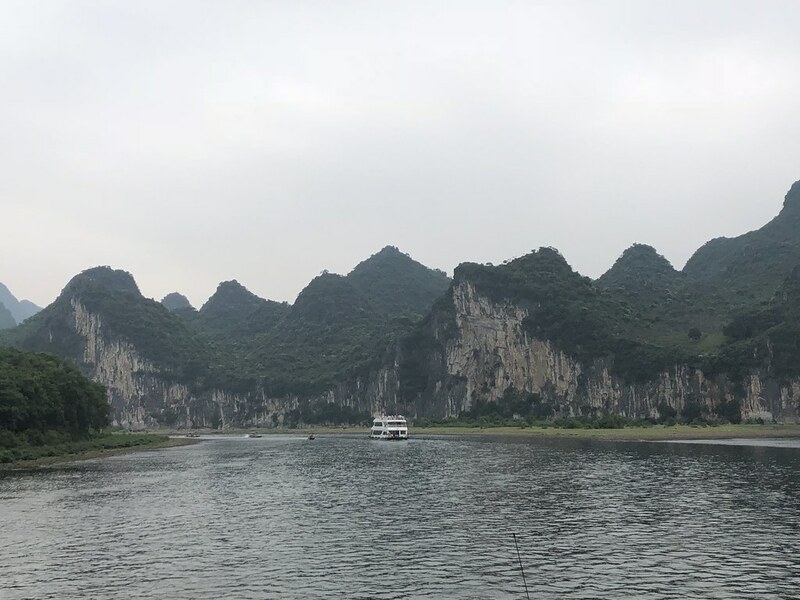 From there we took a short boat ride, which took us past a drum tower, beautiful mountain landscapes and through a cave. Once we arrived back at dock, we walked over to the village. 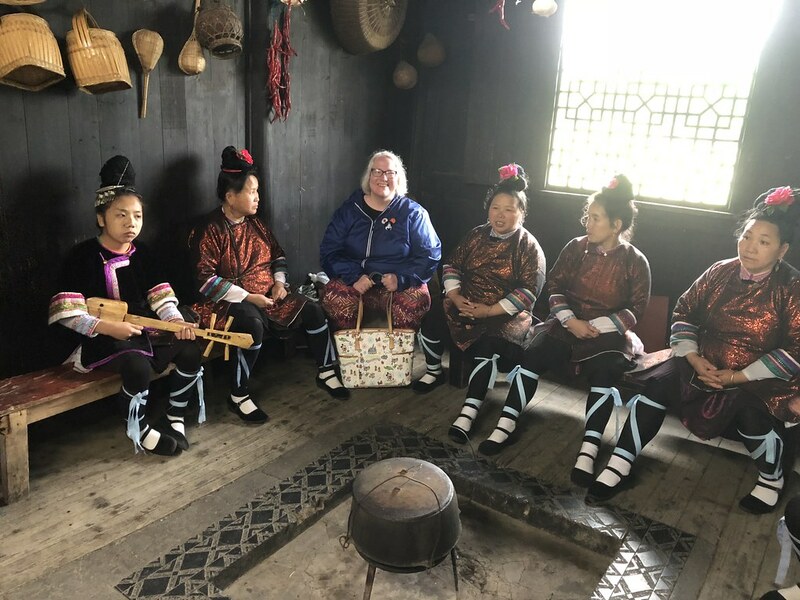 We were welcomed with a cup of the sweet rice wine that is produced in the village. This was delicious. We then headed into one of the houses. 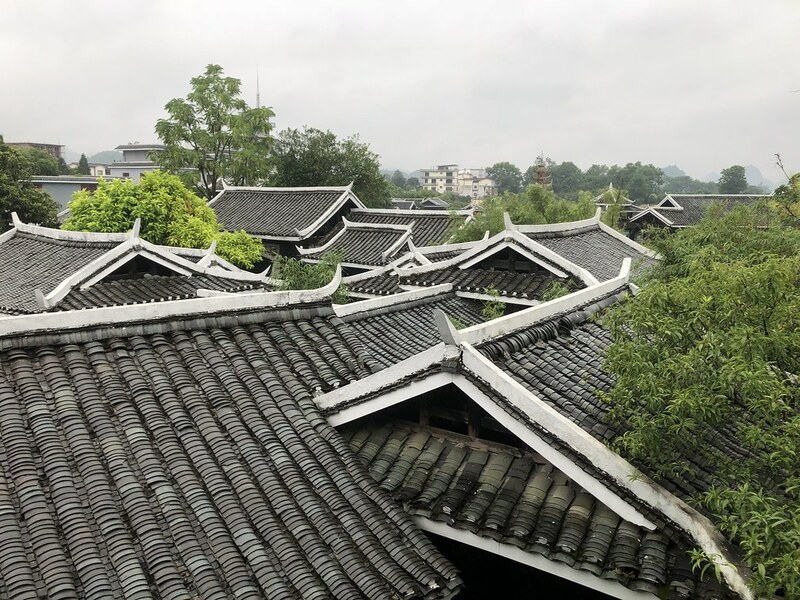 The majority of people in China are Han people. 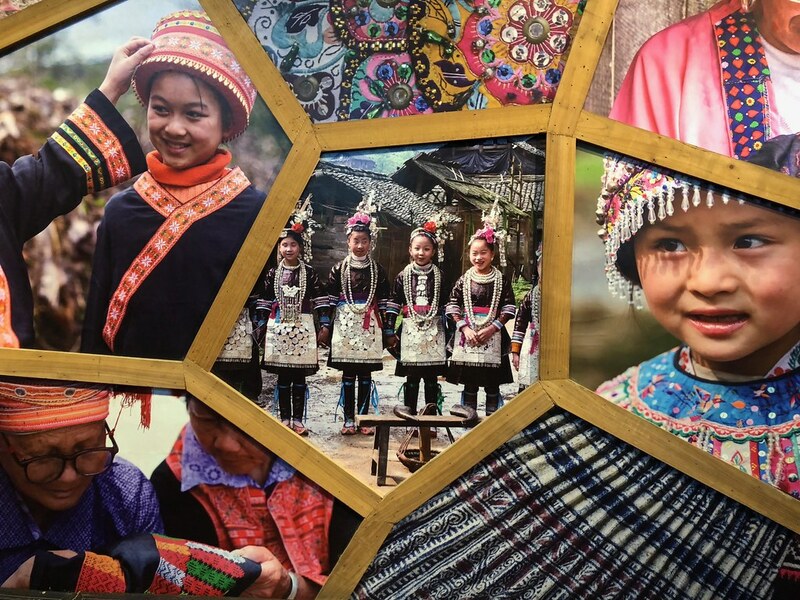 However, about 8.5% of the population of China belongs to the 55 recognized ethnic minorities. 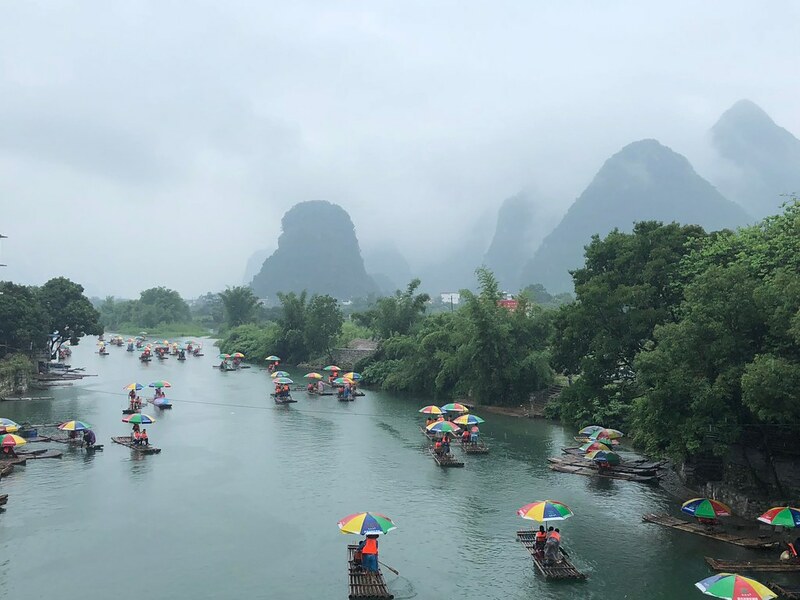 Officially Guanxi, where Guilin and Yangshuo are located is not classified as a Chinese province, but as an autonomous region. 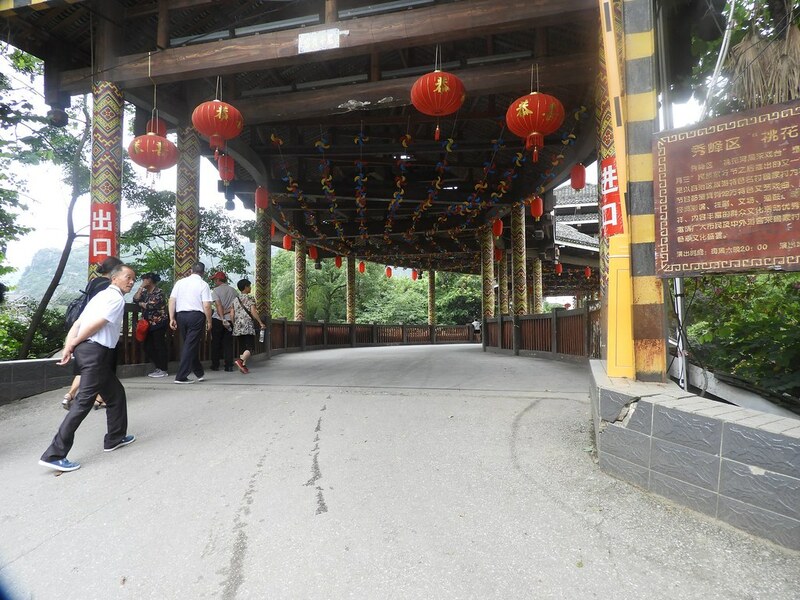 The reason for this is the relatively high proportion of ethnic minorities living in Guanxi. 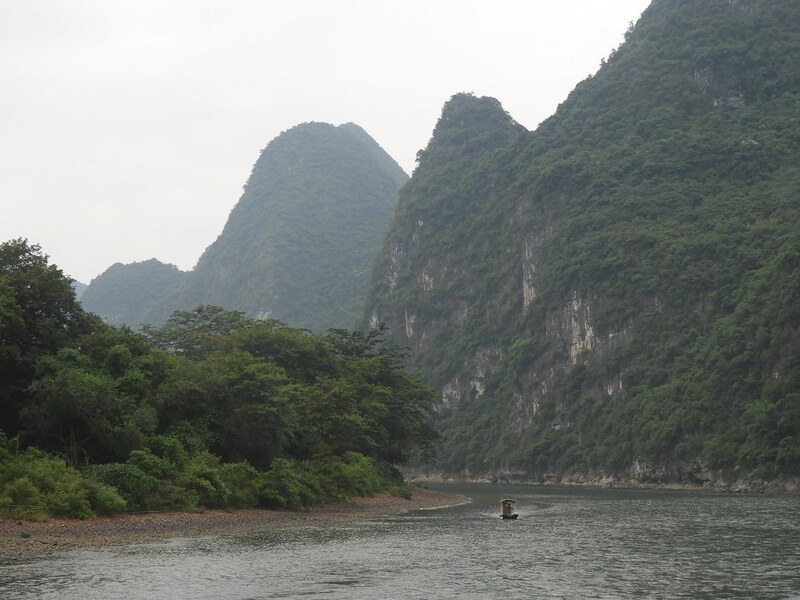 62% of the population are still Han people, but the rest of the population is made up of 6 different ethnic minorities. 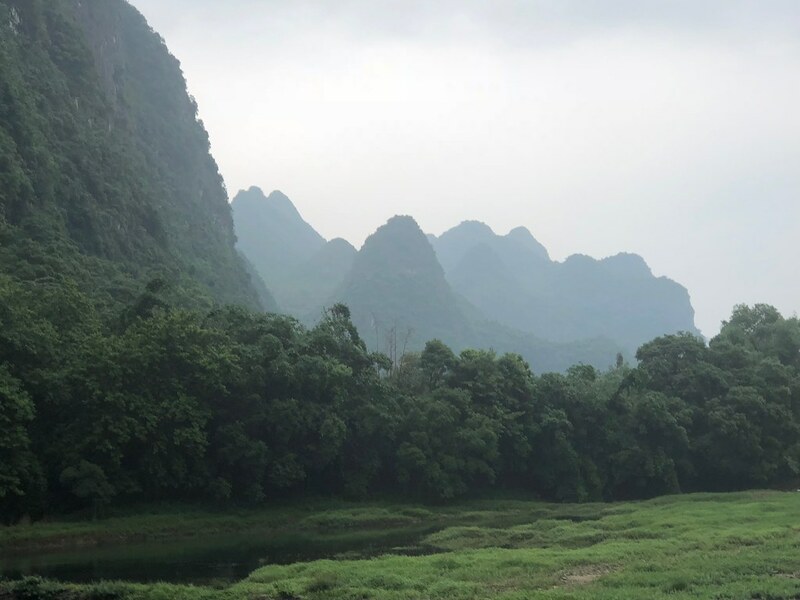 The largest group are the Zhuang people, who make up 32% of the population of Guangxi. The village we visited was a village of the Dong people. They only make up 0.7% of the population, but have an absolutely fascinating culture. They are known for their polyphonic singing and we were treated to some of this. This is an absolutely amazing sound. 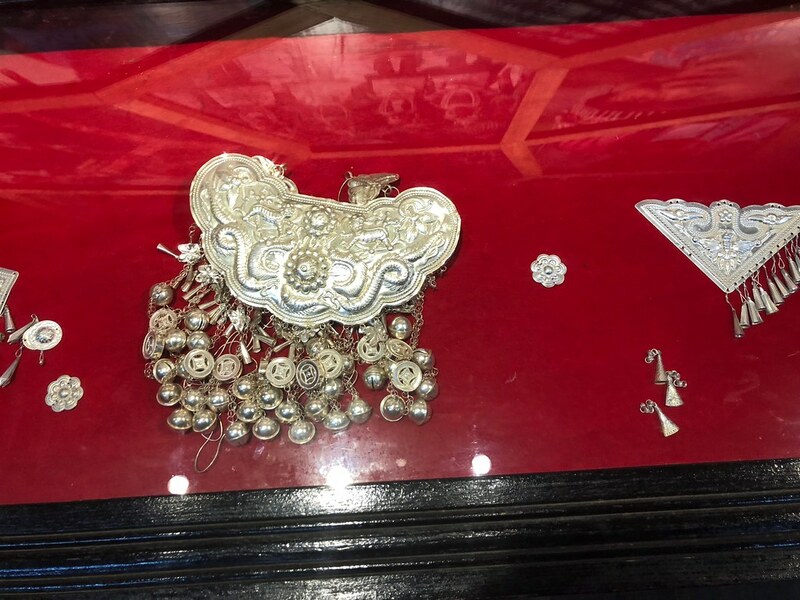 They are also well known for their intricate silver jewellery and embroidery, both of which was for sale in the village. 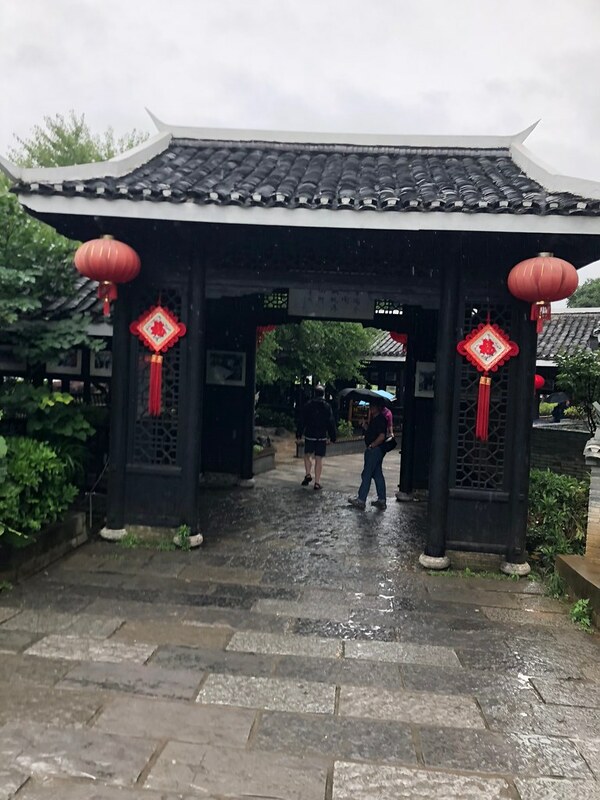 After the presentation, I decided to check out Yuanming Villa, which is a combined museum and craft centre. Graham decided to wait on the bridge for me. 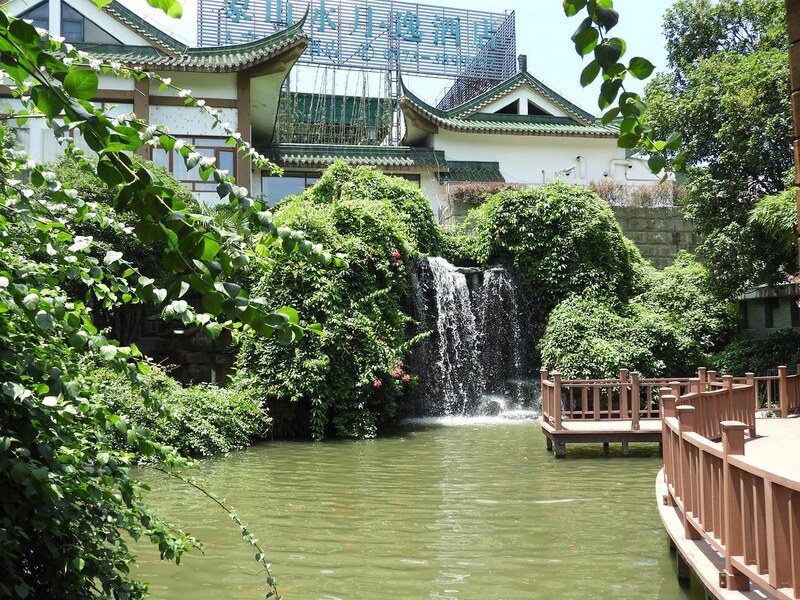 I liked Yuanming Villa, but it would have been even nicer if it had been more museum and less shop. Still, it was well worth seeing. Shortly after I met up with Graham again, we had to go to meeting point, which was outside yet another shop. We were then directed to the vehicle that would take us to where we needed to go. 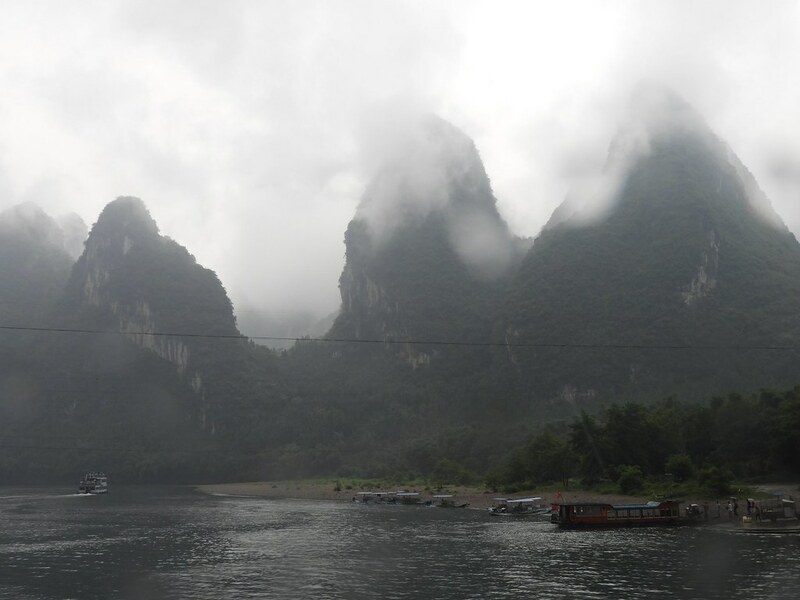 Most people went back to Yangshuo and they went back on the bus. 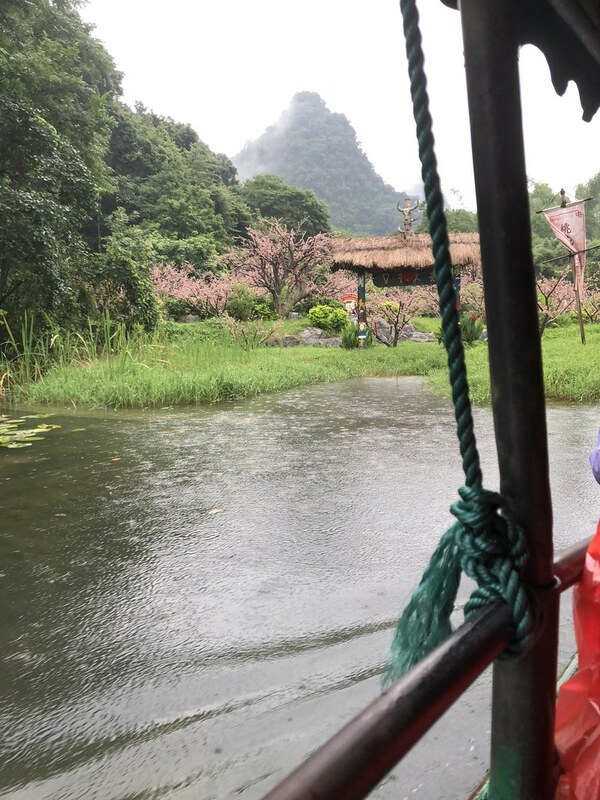 Jenny, a family of 4 and the two of us went back to Guilin and we went by mini bus. I slept most of the way back. 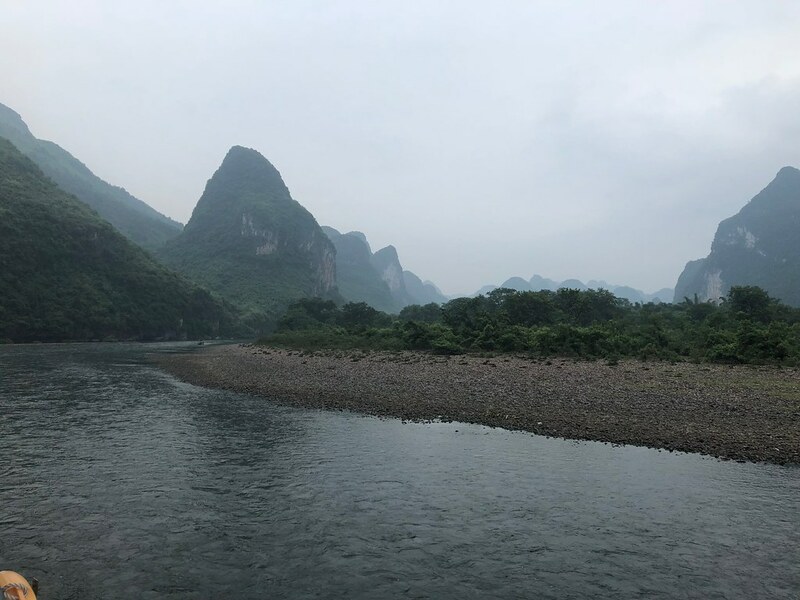 Once we got back to Guilin, we were given the option of being dropped off in the centre and making our own way back later or being taken back to the hotel. We were both tired so opted to be taken back to the hotel. The other family and Jenny were dropped off in the city centre and then the driver took us back to our hotel. We had a bit of a nap when we got back. When we woke up, we freshened up a little and then went for dinner in the hotel restaurant. 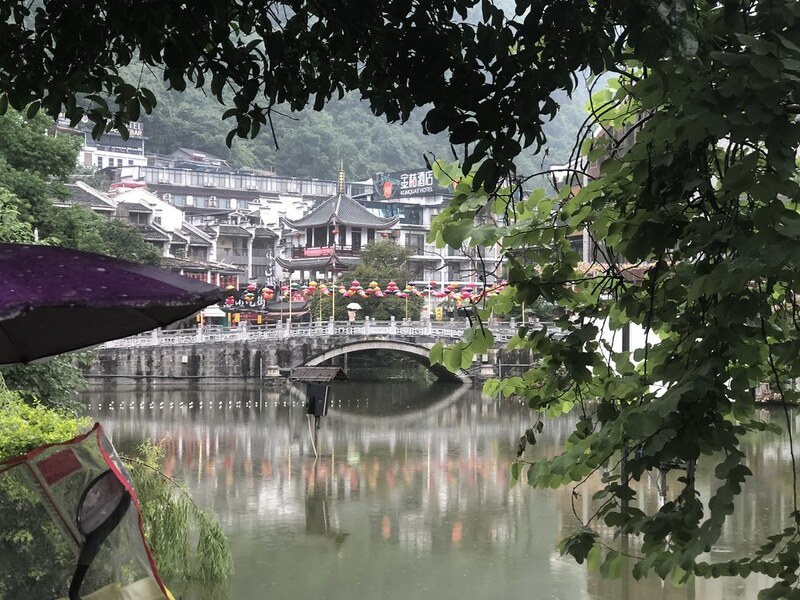 Graham had a beer and I had a pot of Osmanthus tea. Sadly, this came in the shape of a teabag, but was still delicious. 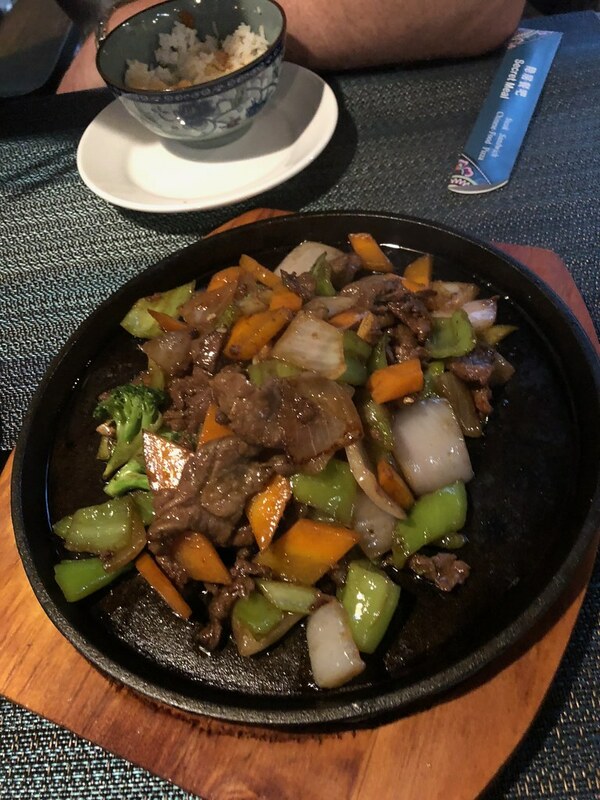 Graham had a sizzling beef dish and I had some spicy pork. We shared some rice. The food was absolutely delicious again. After dinner, we headed up to the room. Graham went to bed straightaway. I read for a bit, but my eyes kept falling shut and I went to bed shortly afterwards. What a lovely day! 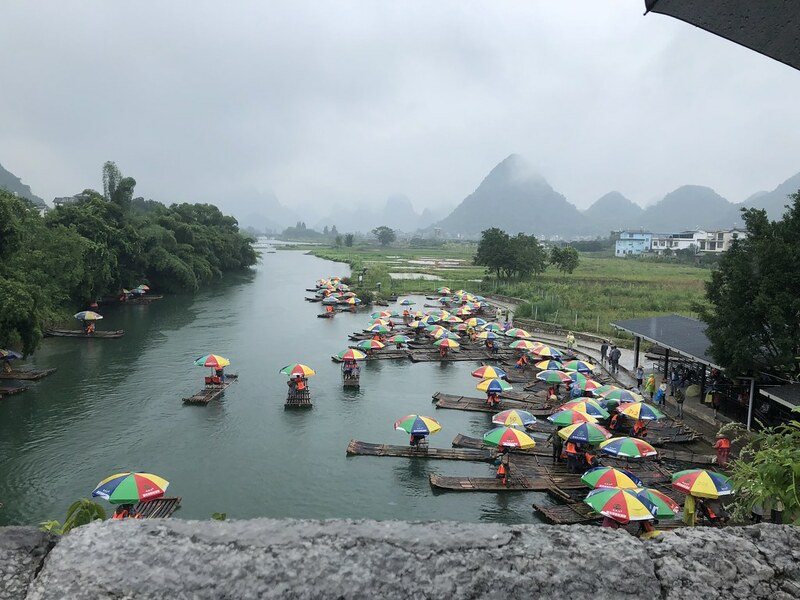 Although rain is a bummer on tours, it did make for nice pics of the umbrellas on the river. So much beauty, I think I would be overwhelmed. The mountains and the fog make fabulous pictures. Glad you decided to do the tour. Too bad Jenny was late starting, like you said you could have had a full breakfast. The cormorants are quite big, wow! 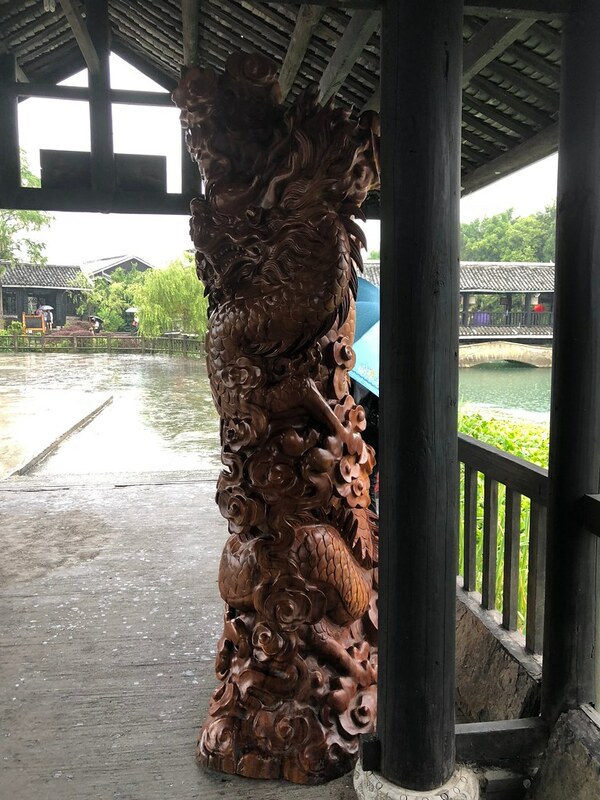 Those wood sculptures are amazing. 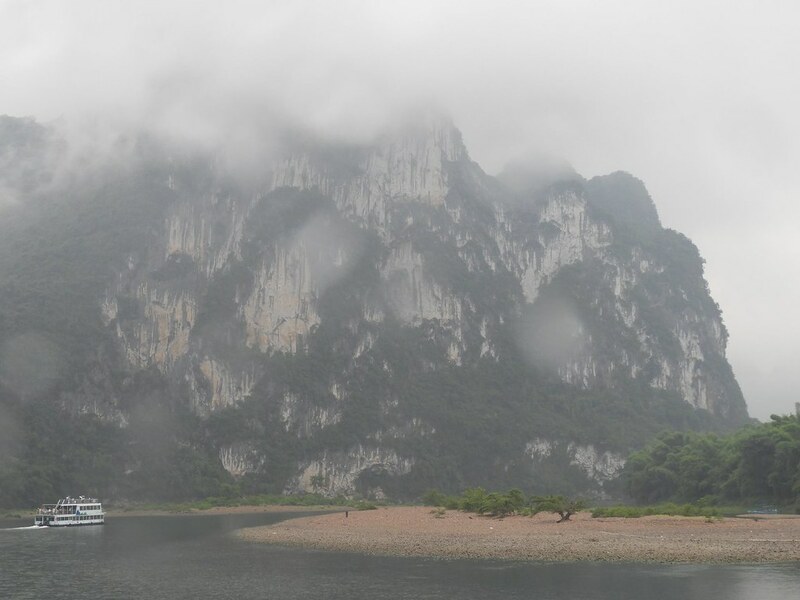 The low cloud also gave a ver mysterious feel to the karst mountains. So much beauty, I think I would be overwhelmed. 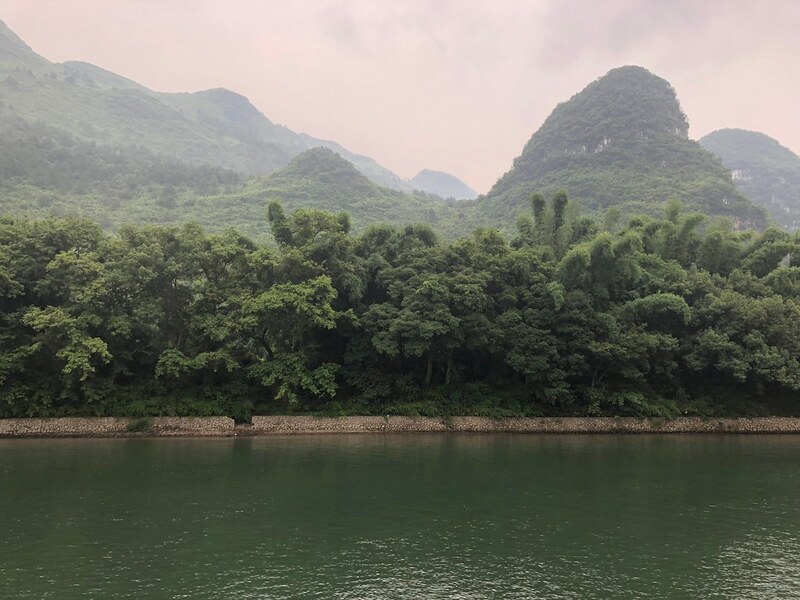 This area of China is just stunningly beautiful. The mountains and the fog make fabulous pictures. Too bad Jenny was late starting, like you said you could have had a full breakfast. This was very much the exception. 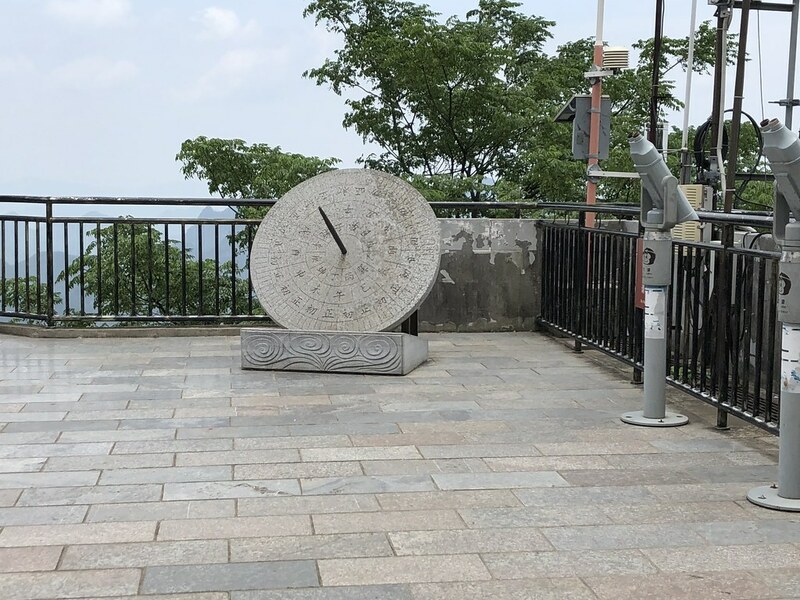 I have found that people in China are normally overly punctual. I suppose this had to do with the morning rush hour. They also turned out to be very heavy. This caught me by surprise as birds normally are surprisingly light for their size, but cormorants seem to be the exception to this rule. We had planned on a more leisurely day and a lie in, but I was wide awake by 6:00 AM. I read for a bit and then managed to fall asleep again and we both woke up at 7:30 AM. We got up, had a shower and then got ready for breakfast. It was pretty busy that morning and we ended up sitting in the bar area. We tried the coffee and that made Royal Caribbean Blend seem like a gourmet offering. Fortunately, the rest of breakfast was a winner. We both had sausages and egg. 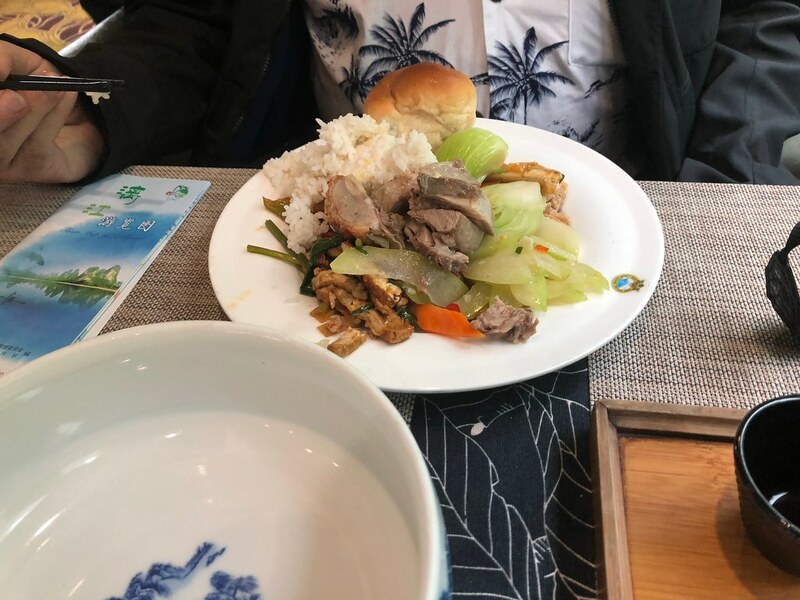 Graham tried the bacon, which he said was delicious and I had some plain steamed buns. We both had some cake and fruit. I particularly was drawn to the dragon fruit, which was delicious. After breakfast, we briefly went up to the room to get what we needed. Then we checked with reception if they could call us a taxi. This was no problem. 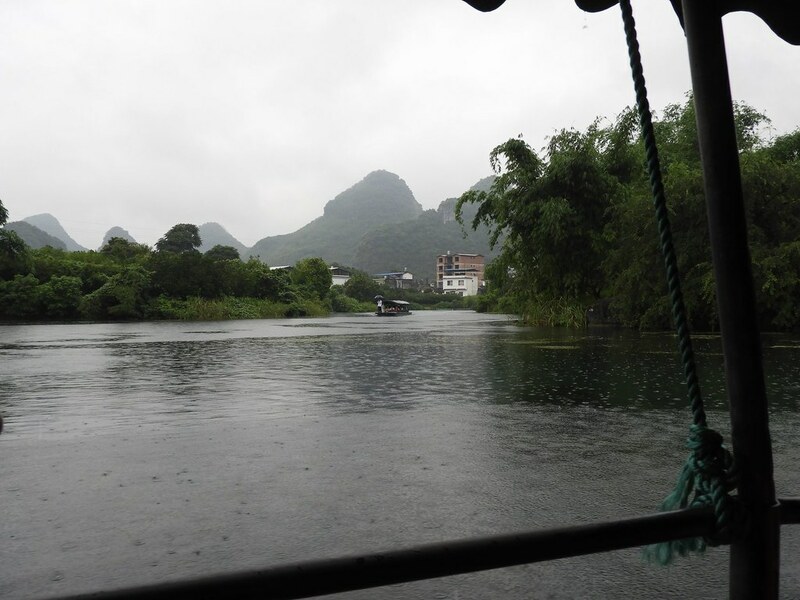 We were going to check out what Guilin itself has to offer. Before we went sightseeing though, we had something else to take care of. 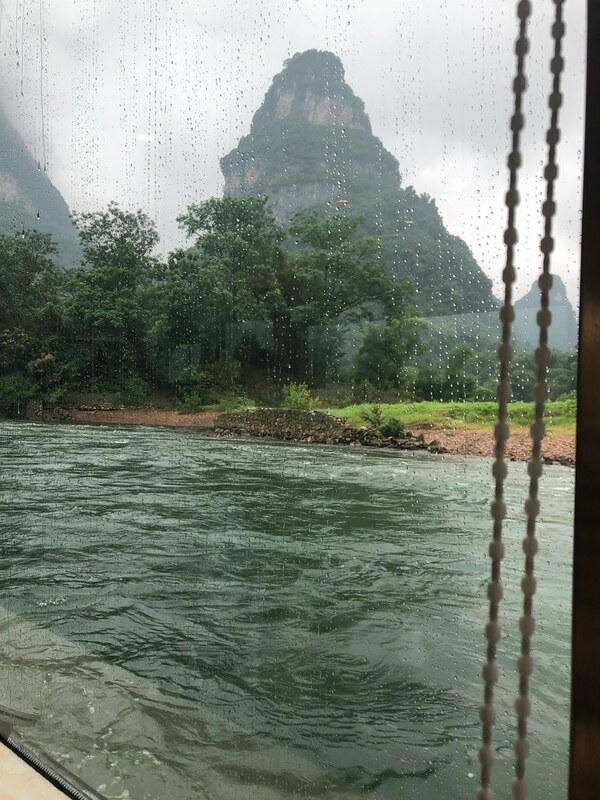 When we bought our train tickets, we had not realised that there are through trains from Guilin North to Shenzhen North. 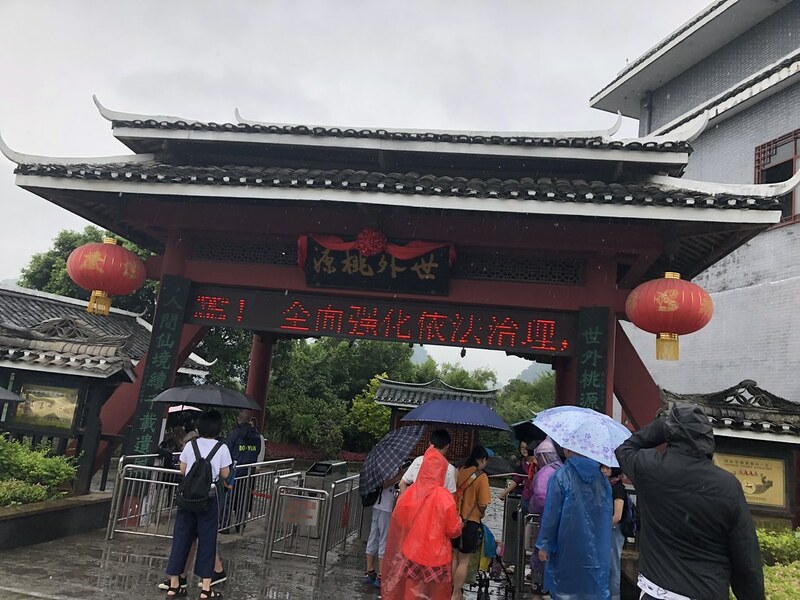 We also were not sure at this stage how punctual and reliable the Chinese train system was so the plan was to get to Guangzhou and then buy tickets to get to Shenzhen. Knowing that there are through trains changed this plan. I had done some research the previous evening and the train we were booked on terminated in Shenzhen. 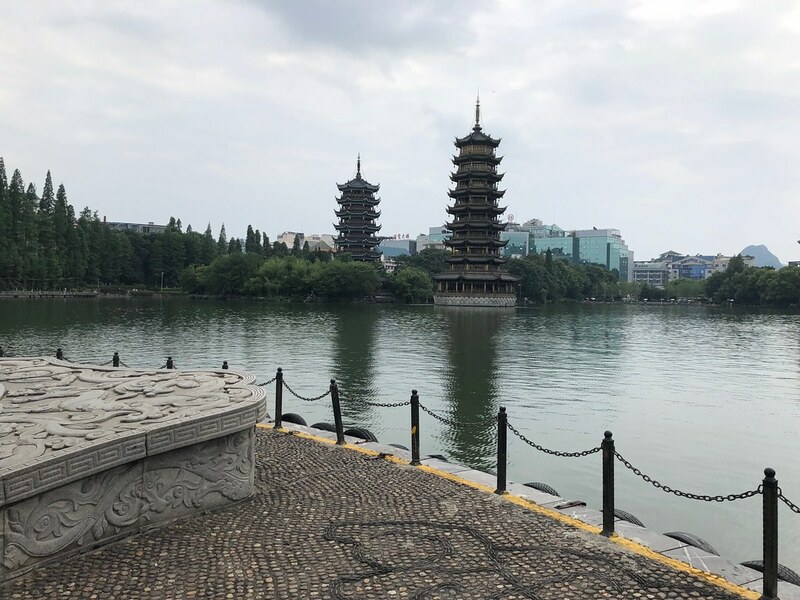 I had checked if there were tickets available for the same coach for the leg from Guangzhou to Shenzhen, but there were not, and I did not really fancy changing coaches with luggage in Guangzhou. So, there was only one solution. We needed to see if we could change our existing tickets. We had learned in Mandarin class how to buy train tickets, but not how to change them. 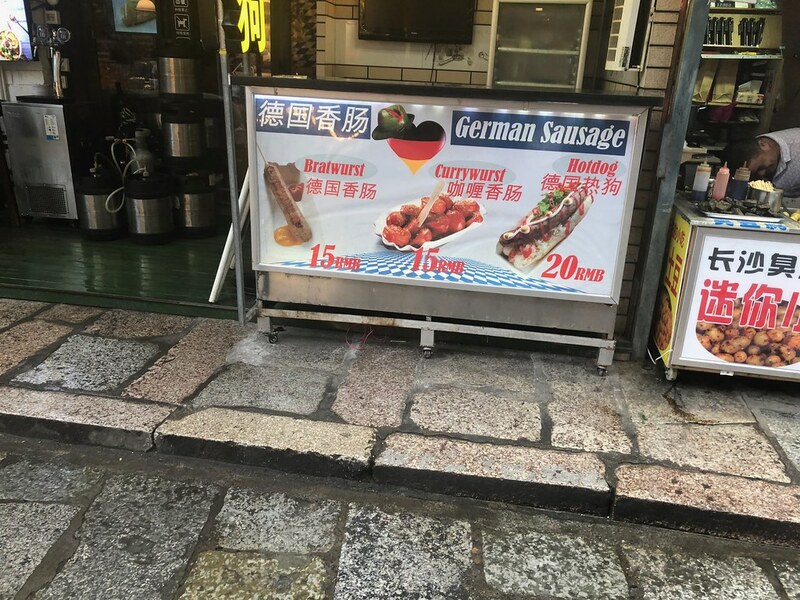 I did have access to the services of Google Translate, but I know sometimes the translations employ a certain artistic freedom. I typed out what I wanted to say and clicked on translate. I then handed my phone to one of the members of staff to sense-check it. I am glad that I did as apparently it did not make a great deal of sense. She asked me what I was hoping to achieve and after a couple of clarifications, she wrote some Mandarin on a piece of paper for me and asked me to show this at the ticket office. I thanked her. We were also given another piece of paper with some numbers and letters on it and were told that the taxi would pick us up near the bridge leading to the village. Pretty much as soon as we left the hotel, we were intercepted by a taxi driver. I showed him our piece of paper and he shook his head. We pushed on towards the bridge. As soon as we walked onto the bridge, we saw a taxi parked and the driver was waiting on the bridge. I had assumed that the piece of paper we were given had the taxi’s registration number on it and the registration number of the taxi waiting was different. However, the taxi driver looked at the piece of paper and beckoned us to follow him. We thought it must be some kind of order number in this case and did not think anything off it. 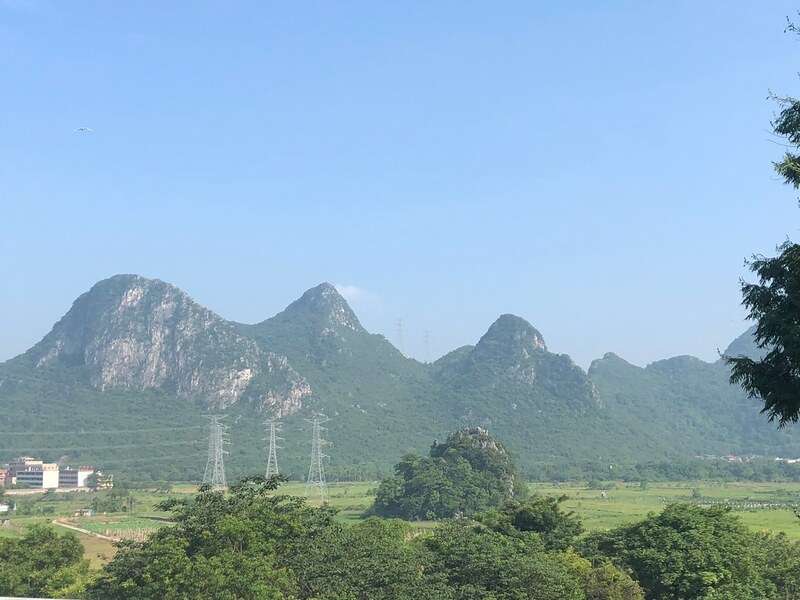 We took a similar route into Guilin than we had the previous day and again this did not set off any alarm bells as Guilin station is on the edge of the city centre. Suddenly the taxi driver got a call and there was some very animated discussion and the driver pulled over to the side of the road as soon as he got off the phone. He used the same translation app that the driver that had picked us up from the station the first day and checked with us where we were going. 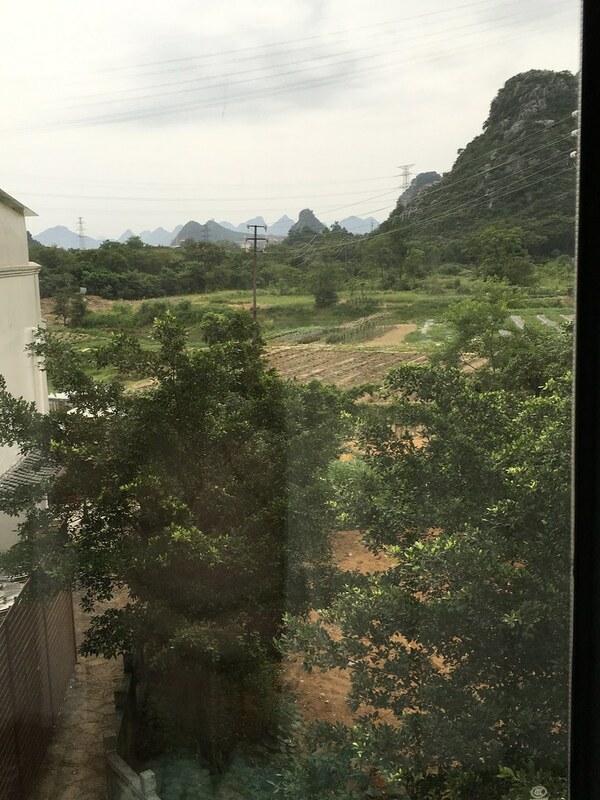 We confirmed that we wanted to go to Guilin station. We never completely understood what had gone on, but we came to the assumption that we were picked up by a taxi that was meant for somebody else. 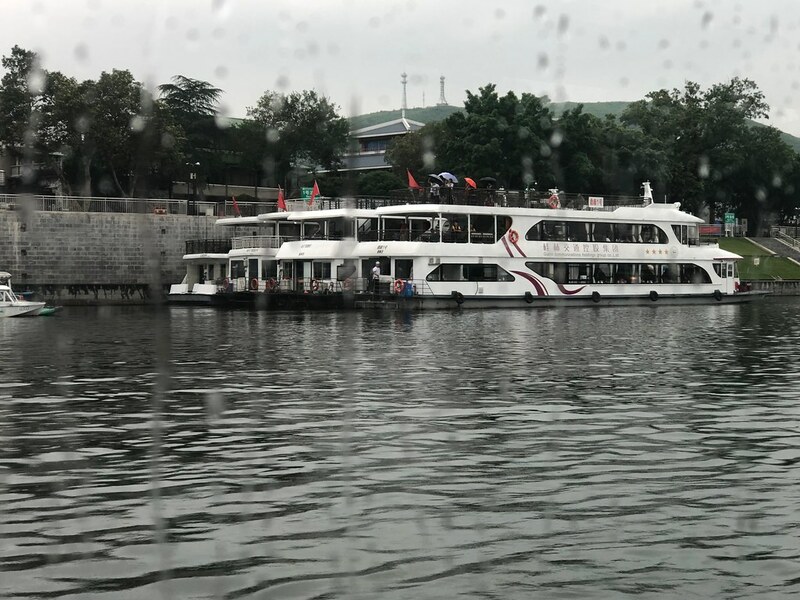 The driver made a u-turn and a couple of minutes later he dropped us off outside Guilin station. Even with the detour, the taxi fare was only about £3. We went through security and entered the ticket hall. It looked pretty busy and we had no clear concept if all the ticket windows did the same job. We were amused by the fact that every ticket window seemed to have different opening hours. We got in line in front of the ticket window with the shortest line and we only waited about 5 minutes. I passed over the piece of paper I had been given at the hotel, our tickets and our passports. She read the note and then told us in English that we needed to go to a different window to make changes and advised us the numbers of the ticket windows that could help us. We went over to one of them and again had a fairly short wait. The member of staff there only spoke very little English and tried to explain something to us. I had no idea what the issue was. He then called over a supervisor, who spoke very good English and she explained us that only second-class seats were available, and we were happy with this. We had travelled up in second class and this was very comfortable. She also gave us a receipt as we were due a refund and advised that we would need to send this to the company that we booked the tickets through. The refund was not very much, and it probably would have cost us more to send the receipt in, so we never bothered. We were given our new tickets and we were on our way again. Graham quickly used the bathroom at the station and then we set off. Our first destination was Elephant Trunk Hill and the surrounding park, and this is not too far from the station. We had bought a map from the hotel reception that morning and Graham had worked out a route. What we had not bargained with is that this area is packed to the brim with little alleys and there is not always a way through. Still, I am glad that we took this route. We went through a number of residential alleys and other alleys with shops and restaurant for the local population. 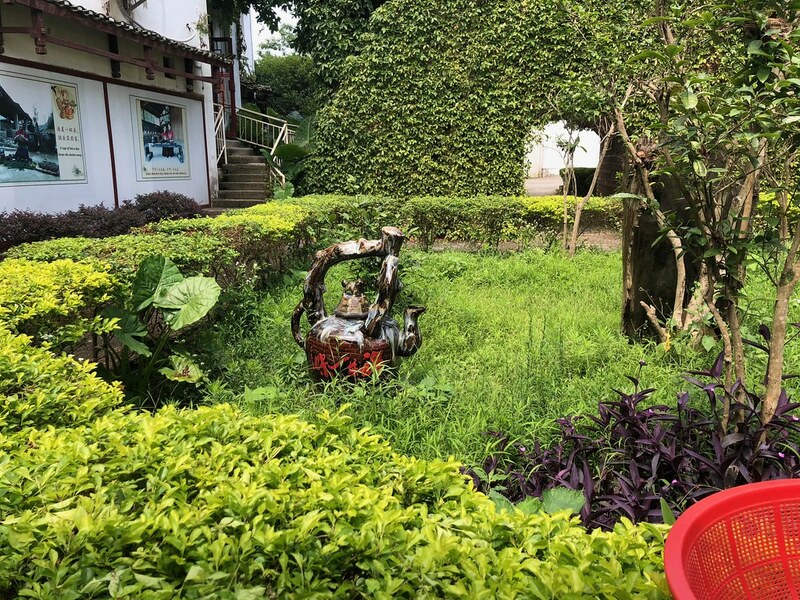 We got a good impression of how people in rural China live. I also found a greengrocer that had all kinds of interesting fruits on display. This was the first time I came across Durian, which really stinks. They had some out to taste and it is meant to taste absolutely delicious, but the stench put me off. I did however make a purchase. I absolutely adore lychees and they are grown in this part of China. 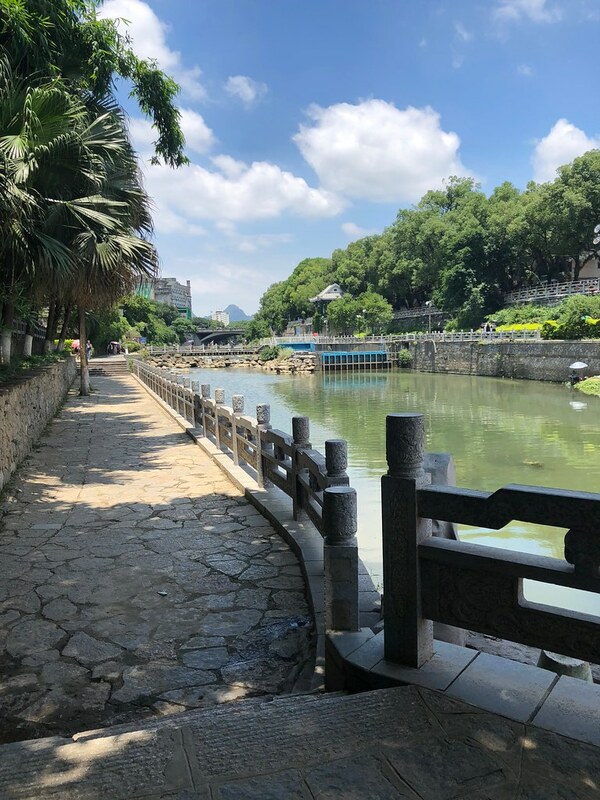 I had seen lychees at the station in Shenzhen and then again near the boat dock in Yangshuo, but I did not want to have to carry them around all day. However, this day I was ready to give in to my craving. I had to double check if what I was seeing were actually lychee as they were huge. 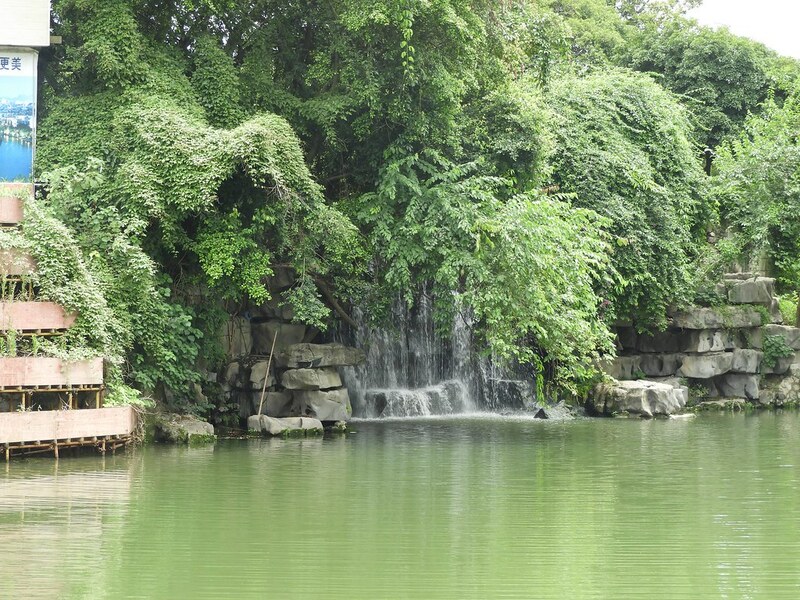 Here they are usually less than 2 inches in diameter and the one I saw in Guilin were about the size of a golf ball. After I was reassured that they were indeed lychee, I bought a punnet. 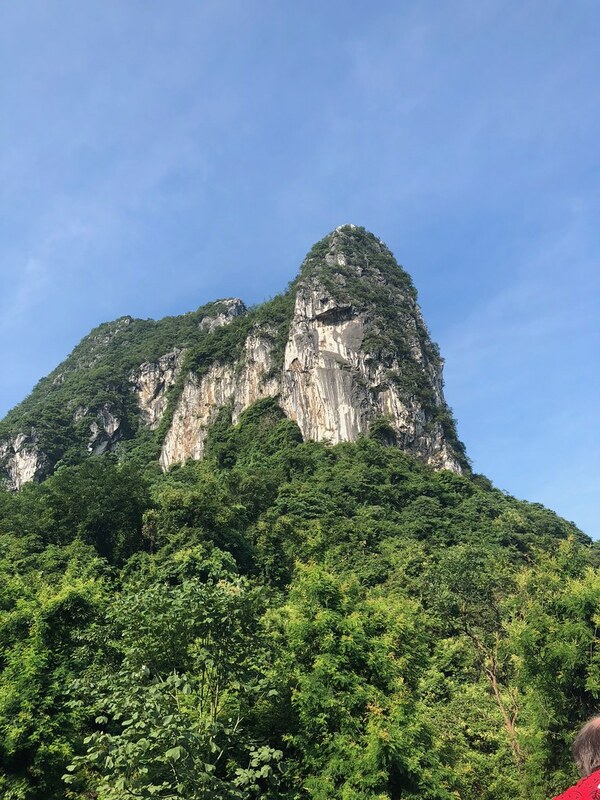 We pushed on towards Elephant Trunk Hill and just outside one of the entrances to the park, we sat on a wall in the shade and enjoyed our lychees. Let’s just say the lychees we can get over here will never be the same again. They were so much nicer. They were a lot sweeter, juicer and more fragrant. We worked our way about halfway through the punnet, but then we were stuffed. I ended up carrying them around with me after all. We walked up to the entrance, but even though it was manned, it was closed. We were directed to the main entrance. We walked back on the road we had come on and then turned towards the main entrance. 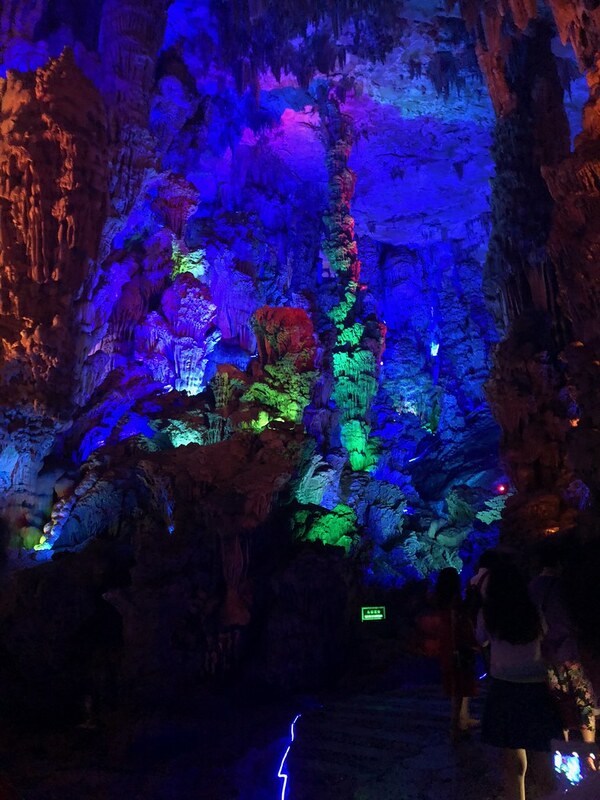 The entrance fee was 55 Yuan per person. 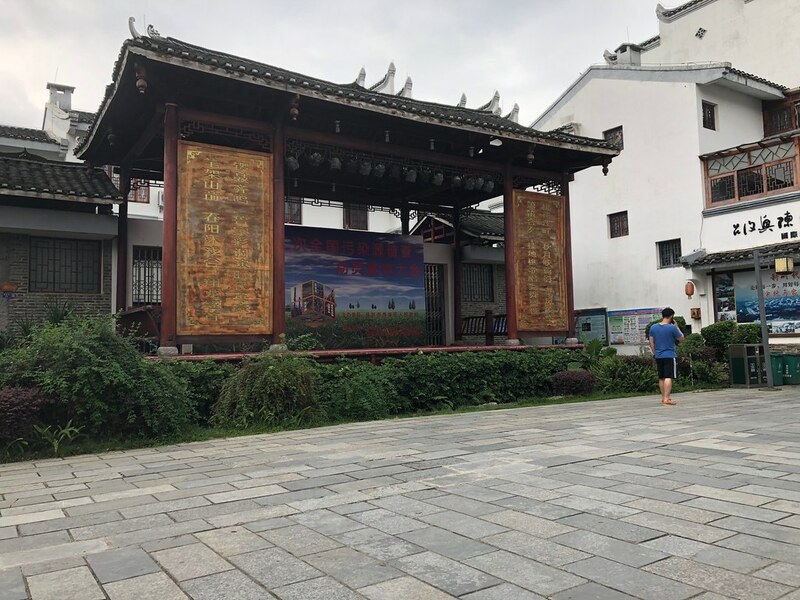 By UK standards, this was fair, but if you consider that the combined admission for Temple of Heaven and Forbidden City in Beijing was less than this, it does not seem to be quite such a good deal. This was even more the case as there was a not a great deal there. Don’t get me wrong, it is quite pretty, but nothing that warrants an admission fee. 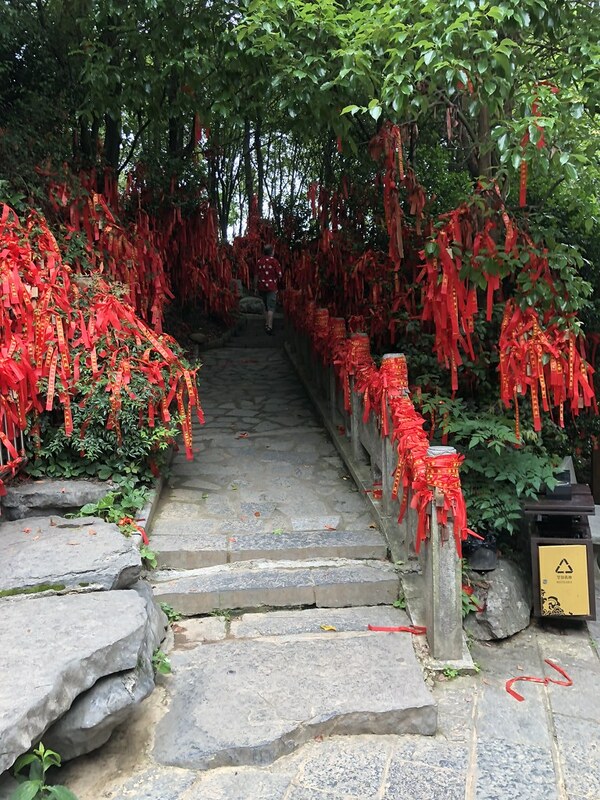 Just the other of the entrance is Sweet Osmanthus Square. 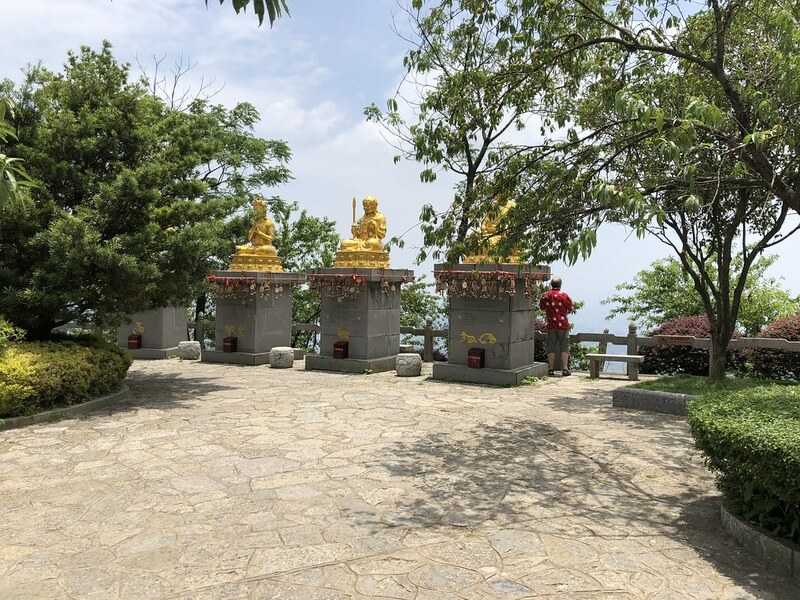 This was the first time I have knowingly seen Sweet Osmanthus trees. They are very impressive and must be even more so when they are flowering. Unfortunately, it was too late in the year for this. 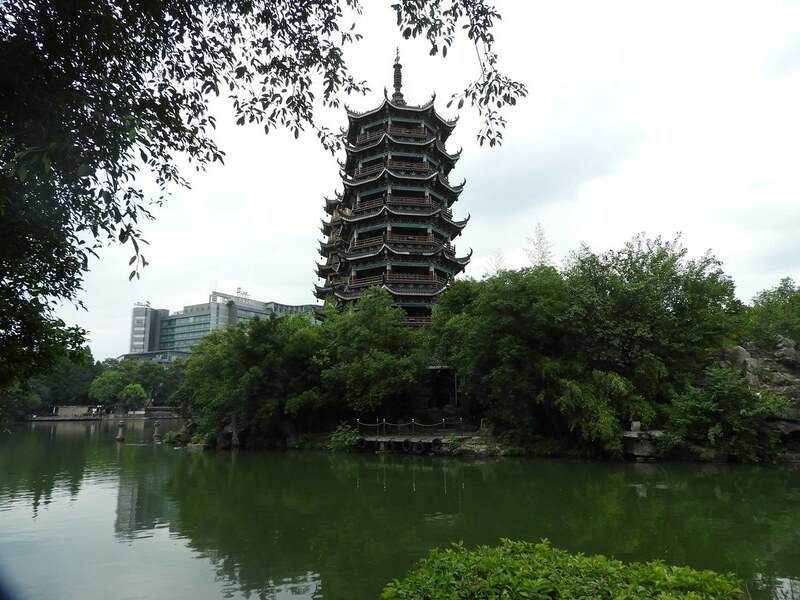 Nearby was the Water Moon Pavilion. 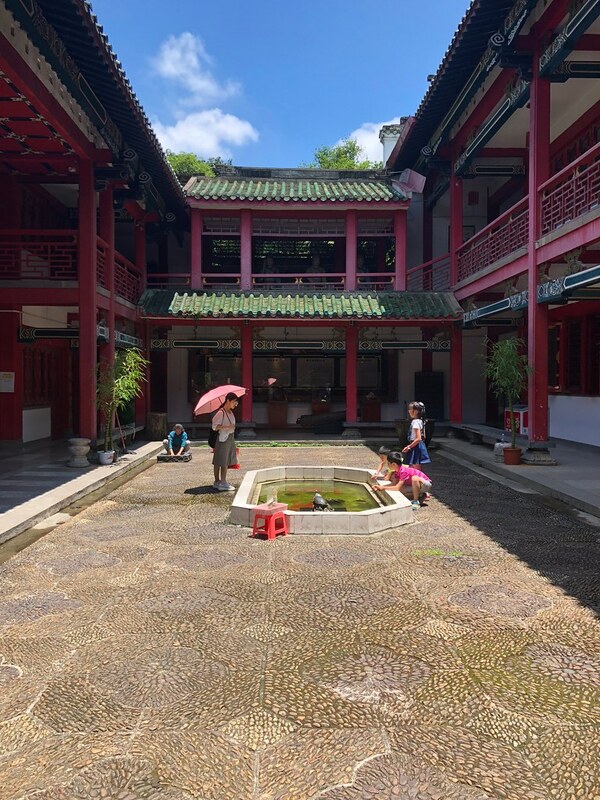 This is a beautiful traditional building built around a courtyard with a koi pond in middle. 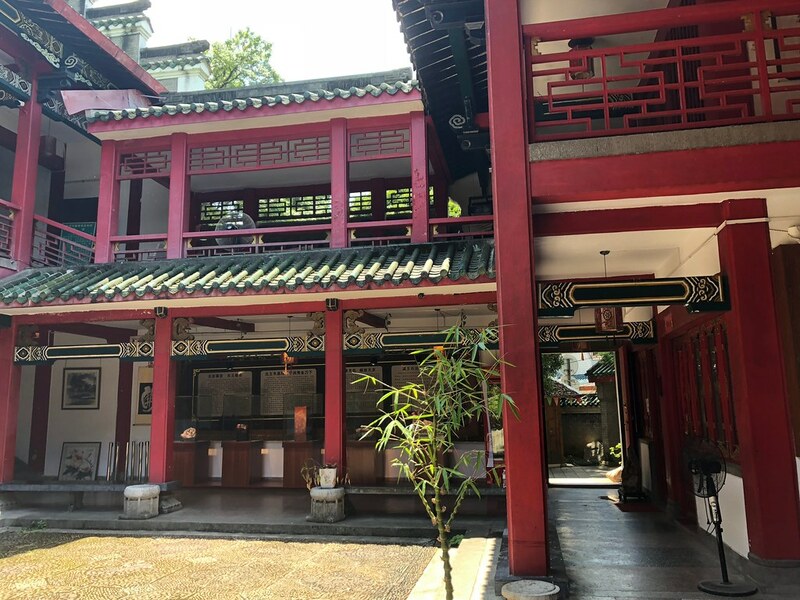 This had two floors and we went exploring, but there was nothing in this building apart from a jewellery shop selling jade and pearl jewellery in one of the wings on the ground floor. 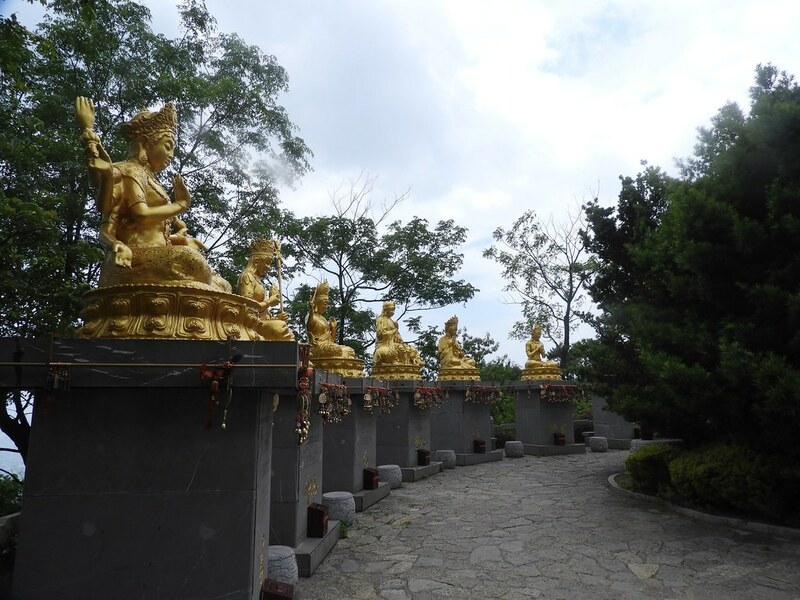 According to the map, there was also a temple in this area, but we did not manage to find this at this time. We pushed on to see what else is on offer. 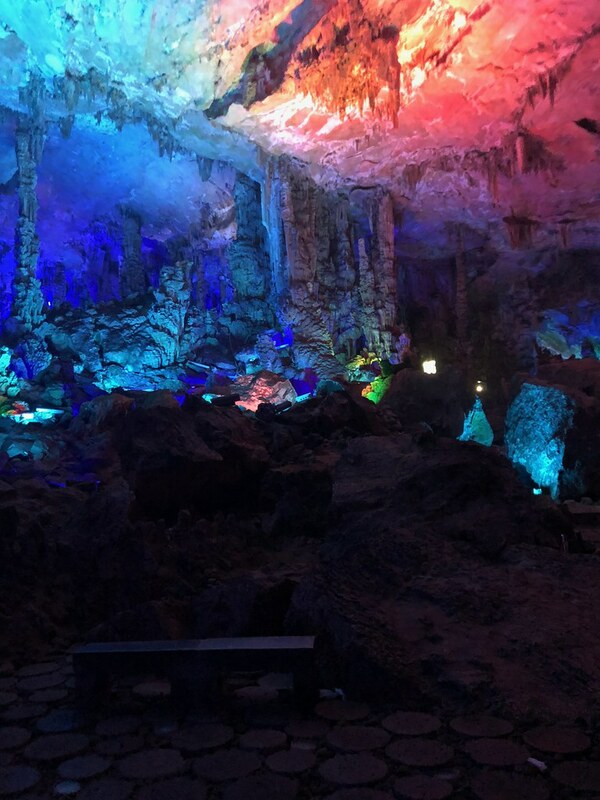 We came past a wine museum and a cave that gave off rather intoxicating fumes. 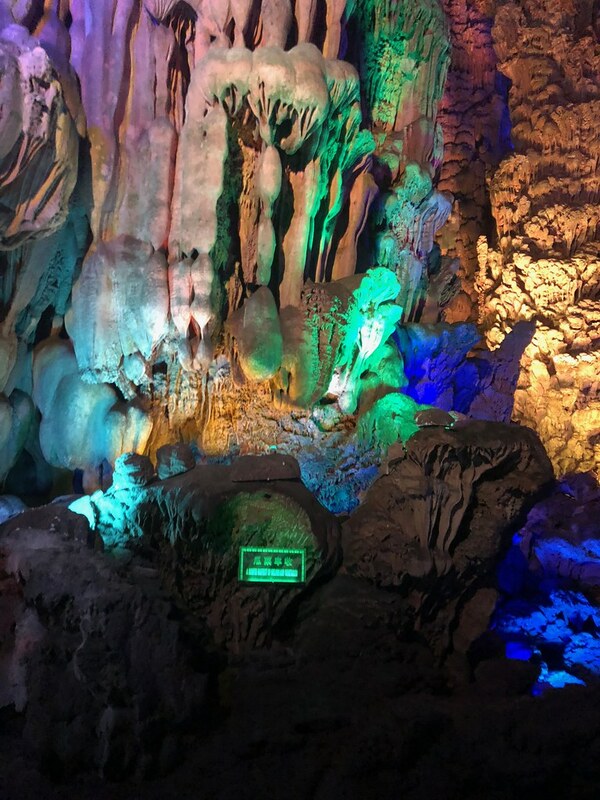 It turns out that this cave is used for maturing rice wine. Normally tours are offered for this, but it was closed that day. 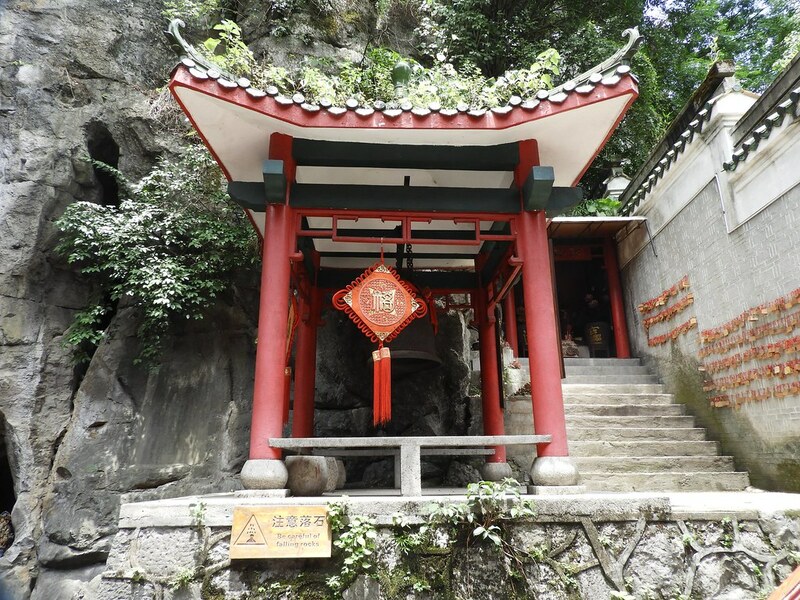 There is another cave and a pagoda nearby as well, but this required a climb up a rather steep hill and we passed. We had a quick bathroom stop before exploring further. The bathroom must be the most unusual one I ever encountered as the building for this was another cave. Fortunately, the facilities were top notch and modern. We then headed down to the waterfront, but there was a not a great deal there. We did see the hill that gives the park its name. 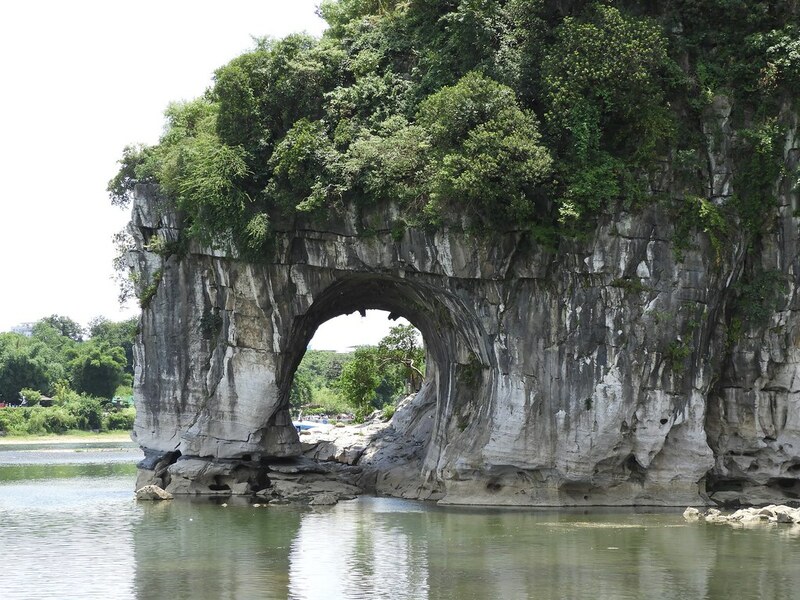 Supposedly it looks like an elephant drinking from the river. I did not quite see this. 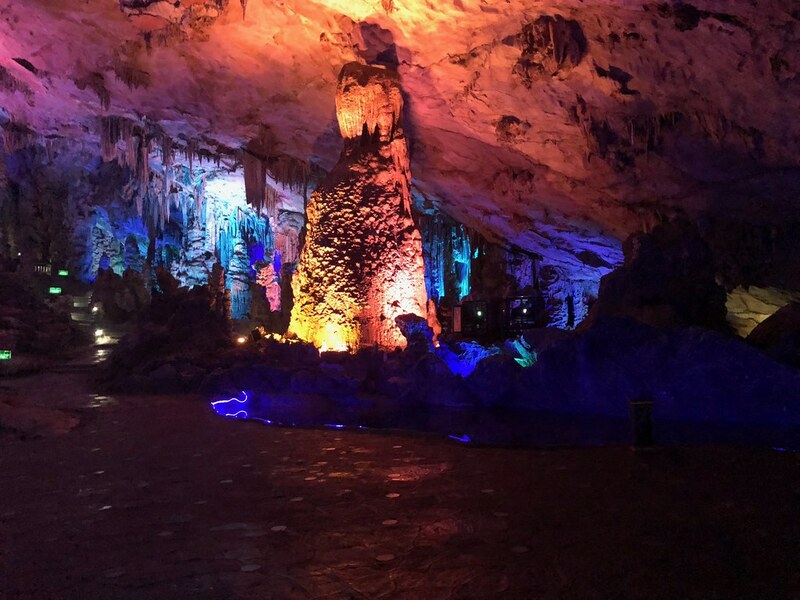 One of the main attractions is Water Moon Cave. 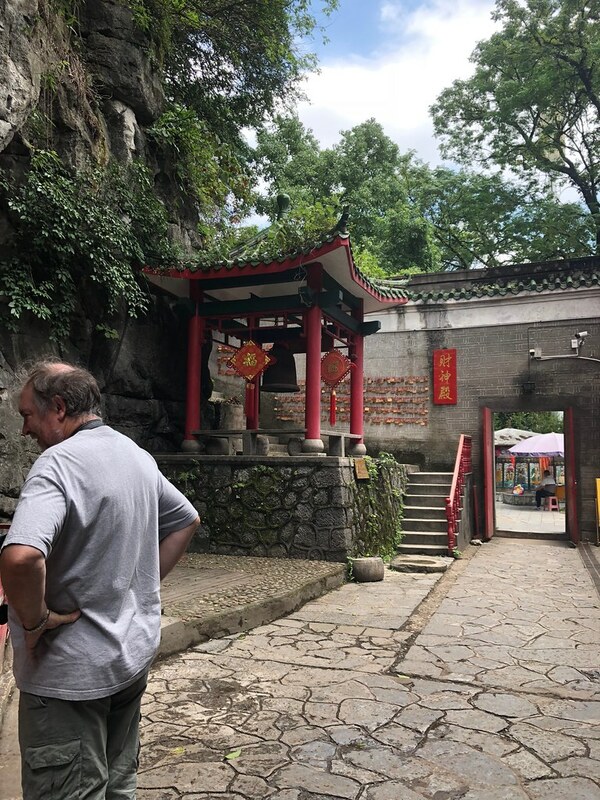 We were trying to figure out where this was and then realised that this referred to the stone arch at the side of the hill. This must be the smallest cave in the world. We backtracked and found a bridge leading over one of the two rivers that run through the park. On the other side where a number of shops. Graham sat down in the shade while I went in search of something to drink. I had hoped for some tea but had to make do with a bottle of Coke. There was one shop that only sold elephants which amused me. One I had finished my Coke, we walked along the waterfront and came to another bridge. 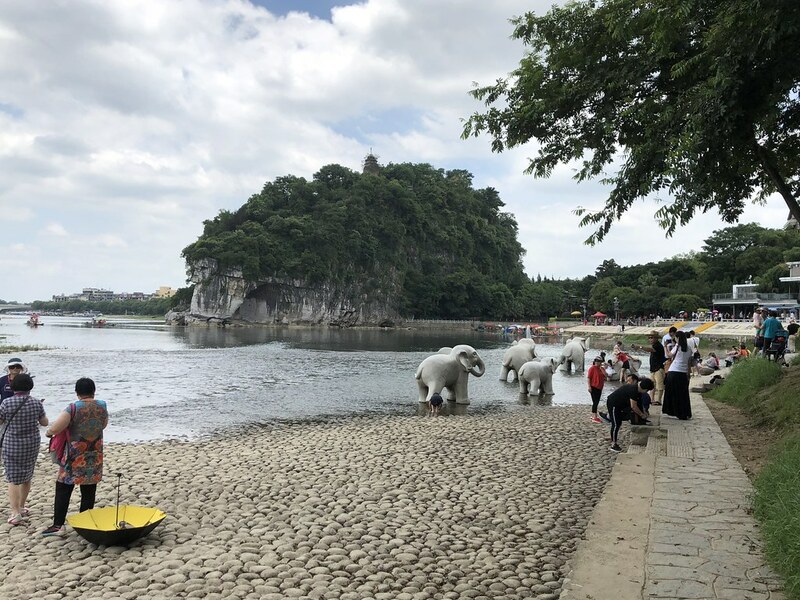 This one used elephant statues as supports. The bridge leads to Love Island and this is the prettiest part of the park. 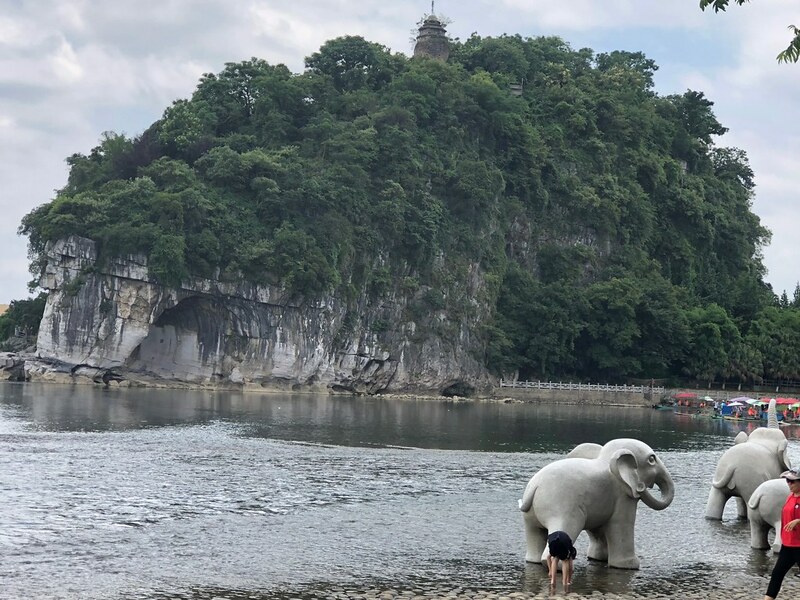 There are various statues around love island and elephant statues in the river. Graham could not resist dipping his toes into the river. 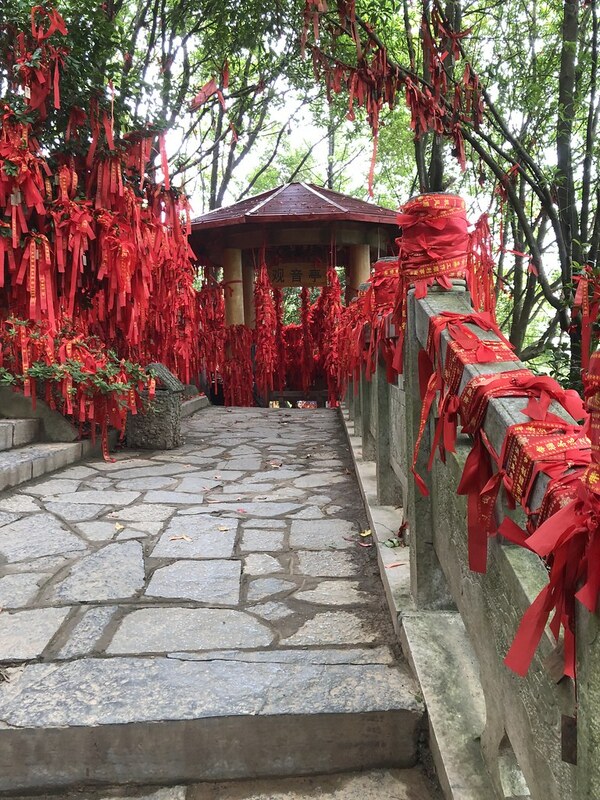 The trees are decorated with red ribbons. We had a wander around for a bit and then headed back towards the exit. 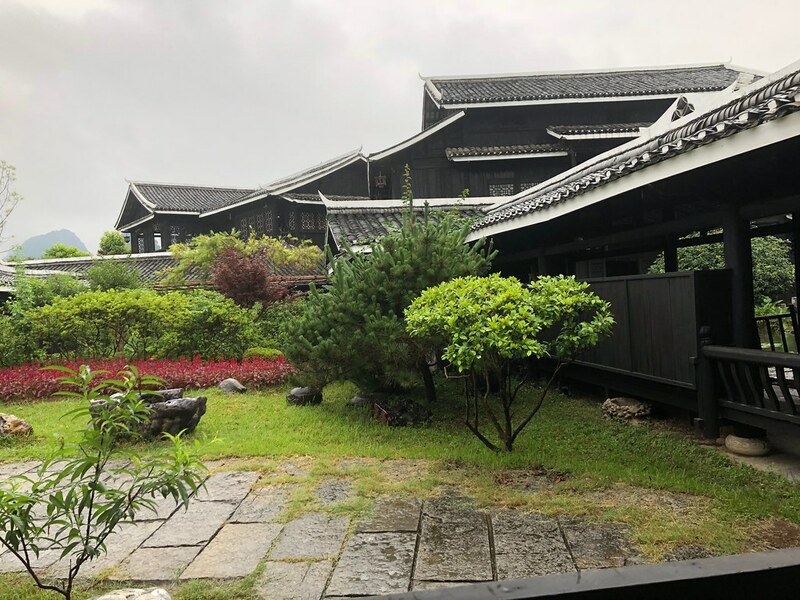 I decided as it was right there and included in the admission fee, I may as well have a look at the Sanhua Wine Museum. Graham decided to pass and found himself a shady spot to sit down and wait for me. It appeared that museum is a thinly veiled disguise for a huge shop. 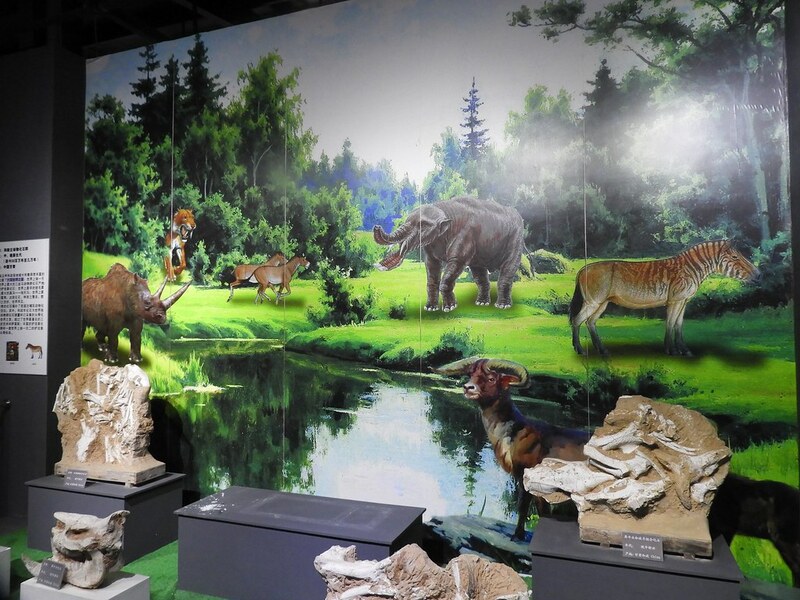 The so-called museum consisted of 8 rooms. The first two actually had deserved the name museum. The remaining 6 were for shopping. 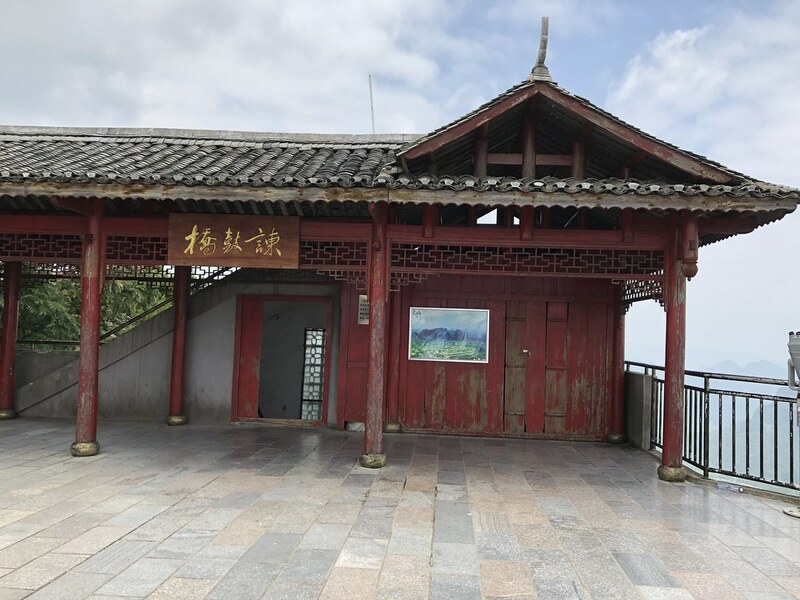 The first room chronicled the history of wine production in Guilin, which is going back to the Song Dynasty (960–1279). 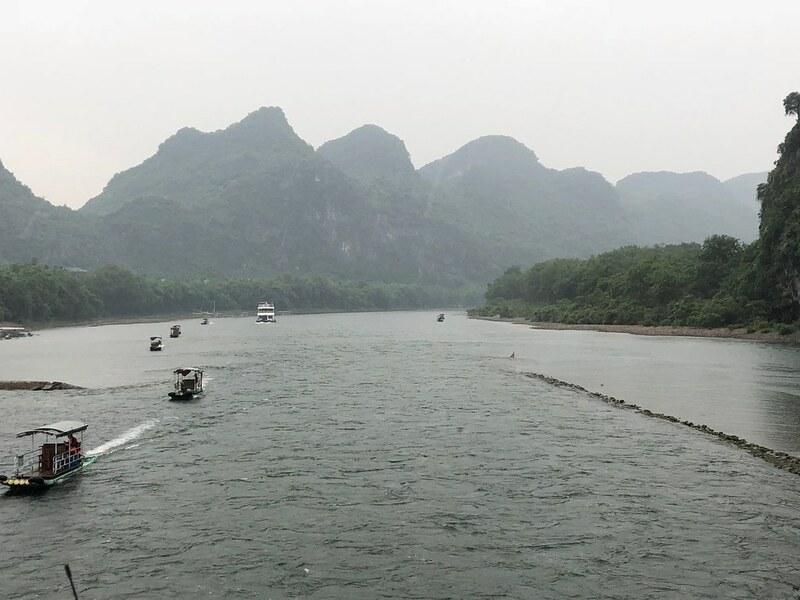 The wine produced here is rice wine and they use water from the Li River which is drawn near Elephant Trunk Hill. The next room had all kinds of vessels in which the wine is stored. I found both rooms very interesting, but I am sure a lot of the local population heads straight to the shopping area. This however held no interest for me and I left again very quickly. 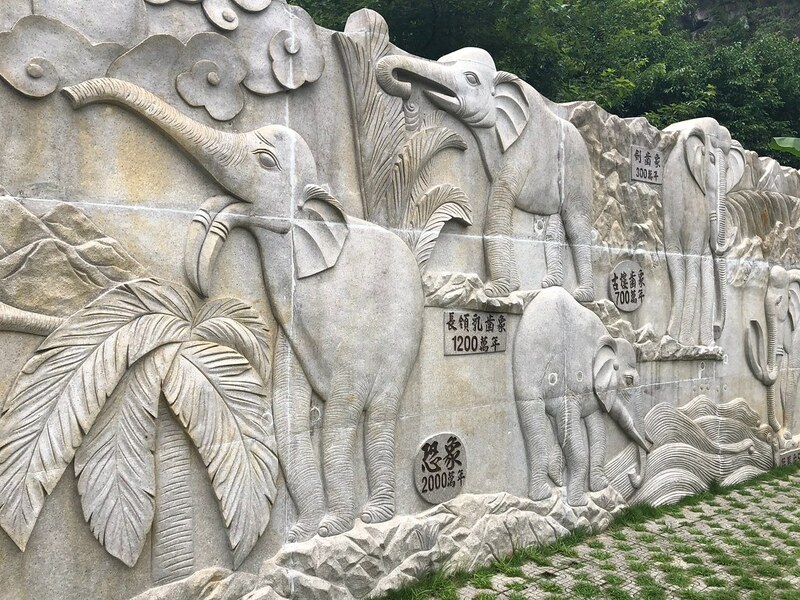 I took a quick photo of the Elephant Screen, which is a wall with all kinds of elephant and plant carvings. 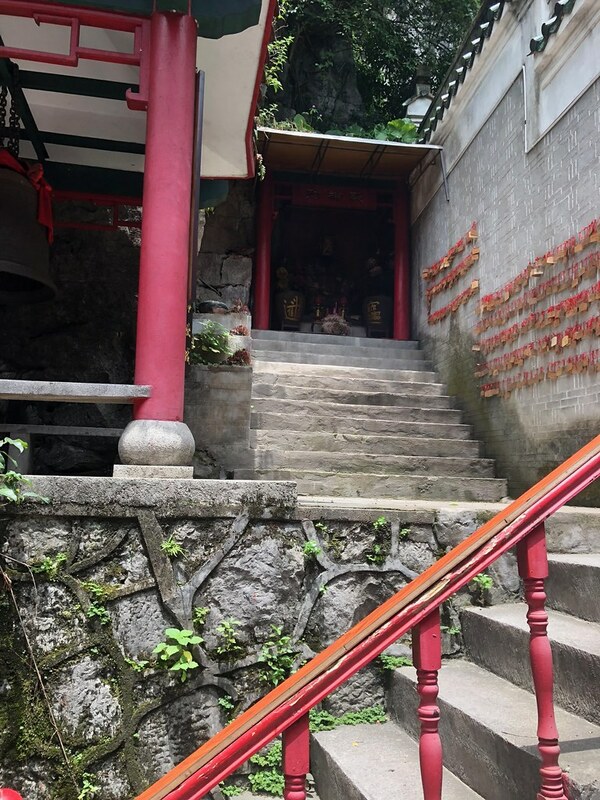 On our way to the exit, we then found the temple. 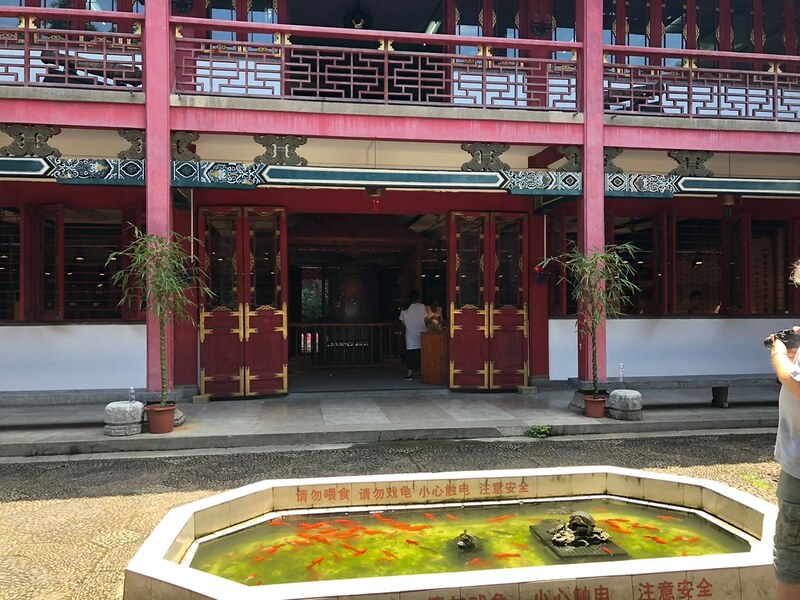 I had not expected an open-air temple. It is very pretty. 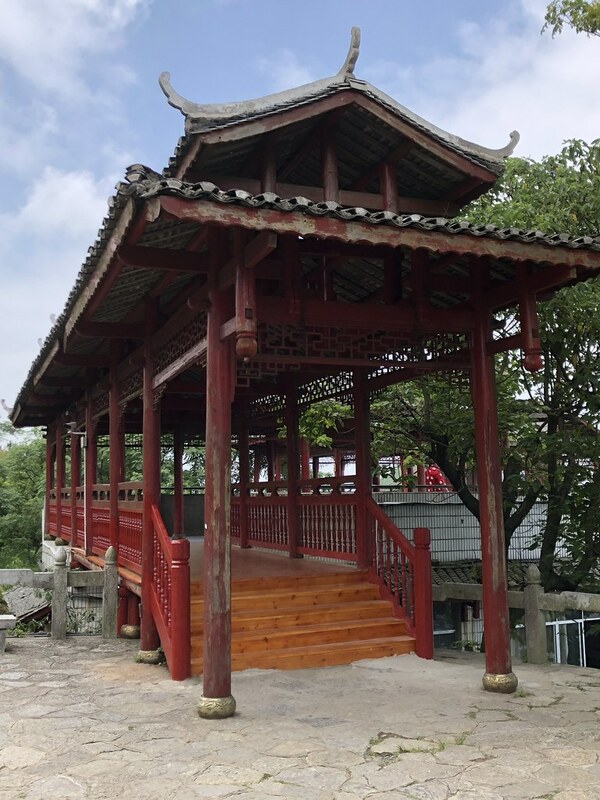 The temple was built during the Tang Dynasty (618–907) and was originally home to a monk who made 6 trips to Japan to spread Buddhism. 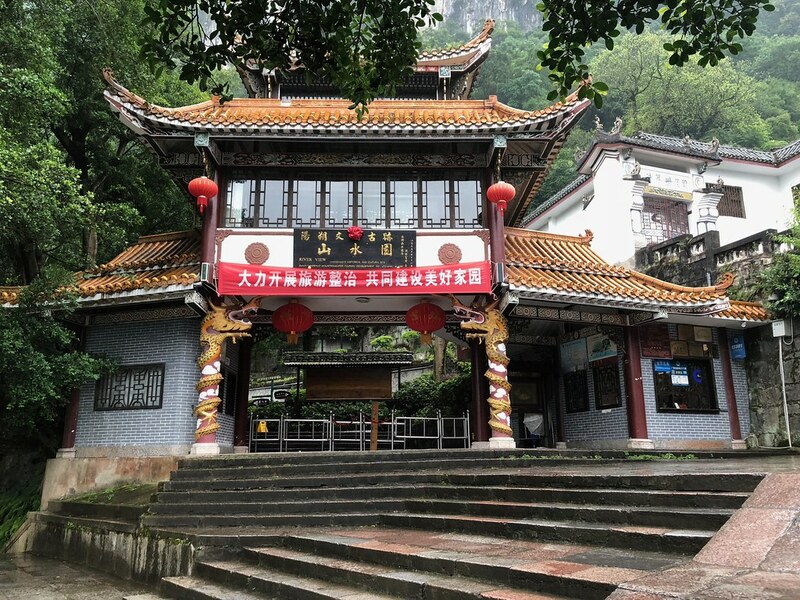 This is one of the oldest temples in Guilin. When we left the park, I took a quick photo of a pretty building just outside the park and then we decided that we better do something about lunch. There were plenty of restaurants nearby. We ended up in what was essentially a fast food restaurant, but they had a menu with photos, which always helps. 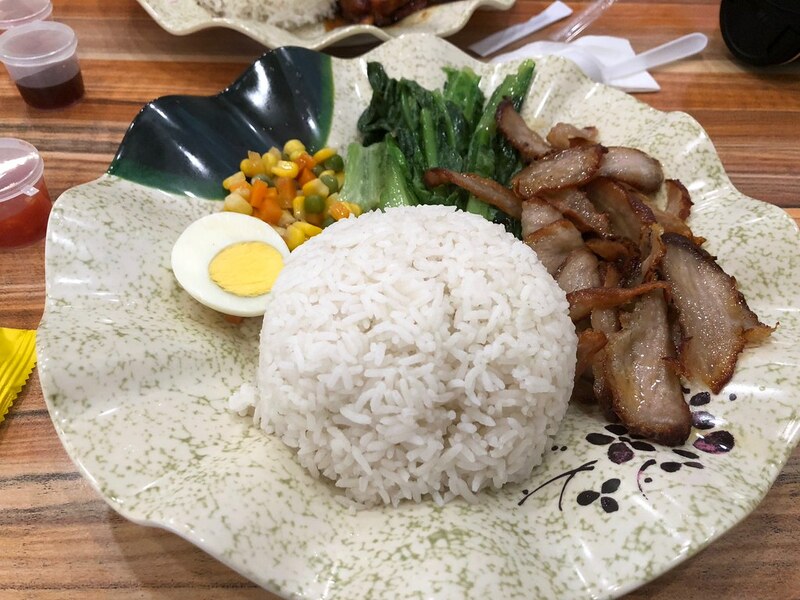 We both had a set meal, which consisted of rice, vegetables, half a boiled egg and a choice of meat dish. Graham had duck and I had pork belly. This was absolutely amazing. The pork was tender and full of flavour. The meal also came with some iced milk tea and Graham developed a taste for this. We had another milk tea each and the bill for two meals and the extra milk teas came to about £6 for the two of us. We were absolutely stuffed. After lunch, we definitely needed to walk off all the food we had. 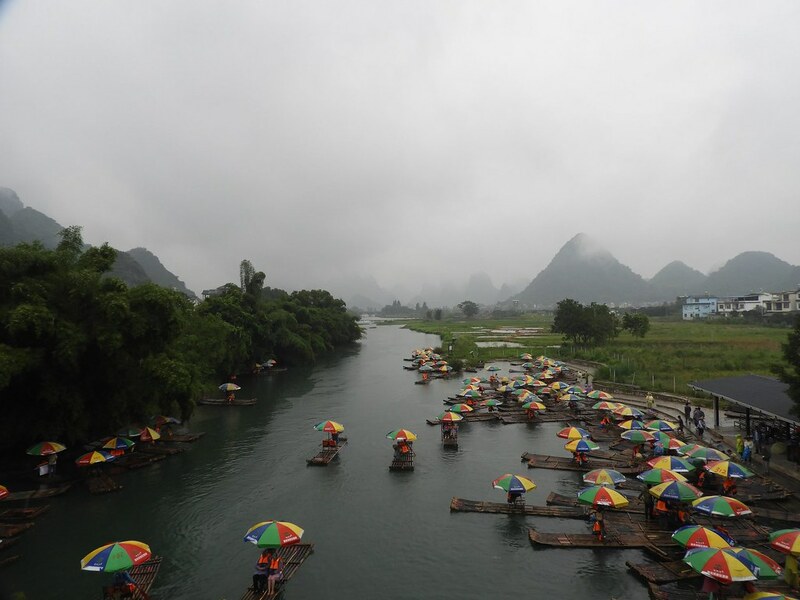 One thing that Guilin is famous for is the Two Rivers and Four Lakes Scenic Area. 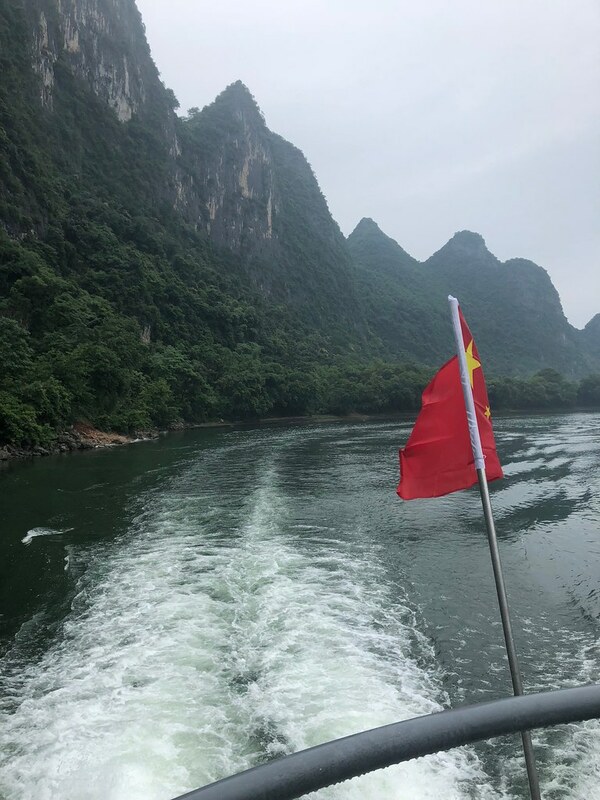 You can get boat trips covering the whole area and this is definitely on our to do list for our next visit. Our destination that afternoon was one of those lakes, the Shanhu Lake Scenic Area. 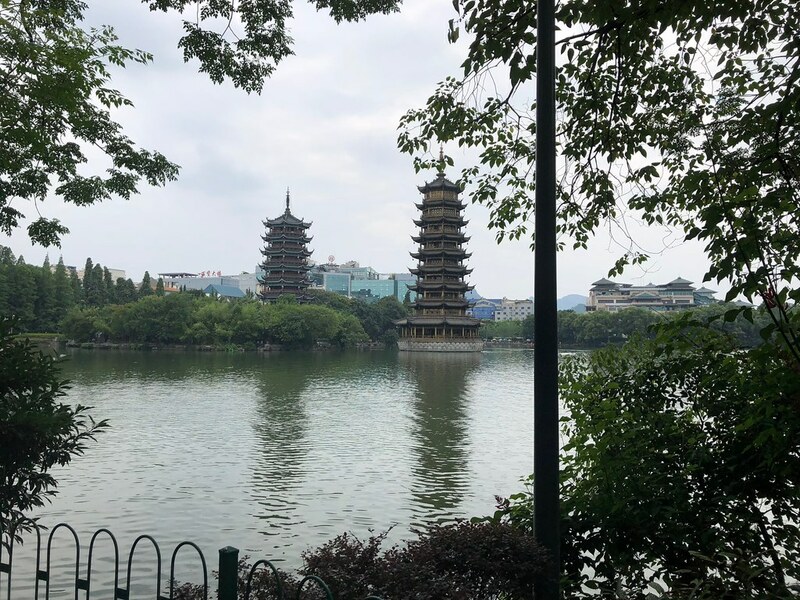 Shanhu Lake is also known as Fir Lake and is home to the Sun Pagoda and Moon Pagodas. 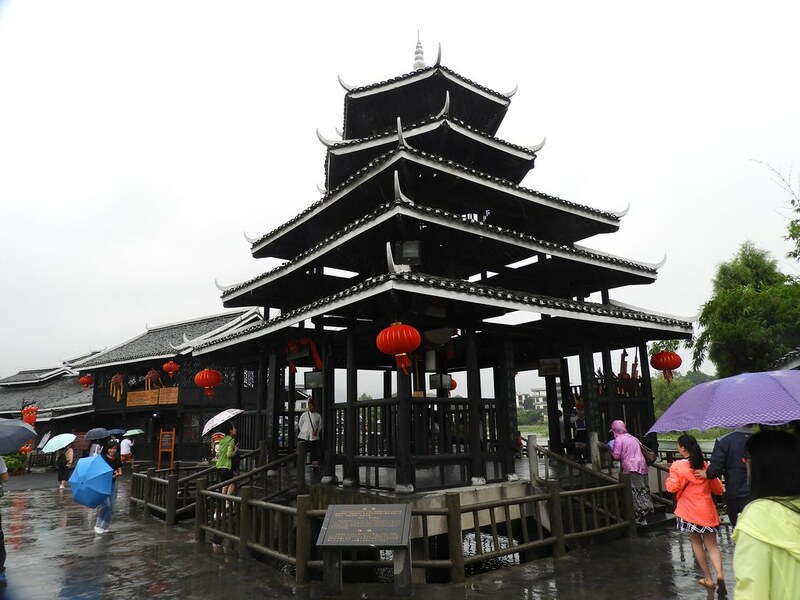 The Sun Pagoda is made from bronze and the Moon Pagoda is covered in glazed tiles. 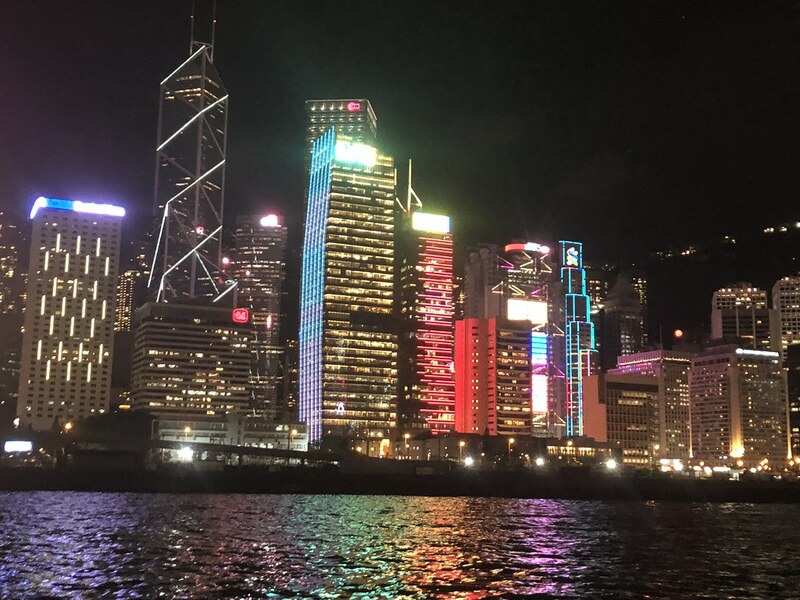 Judging from photos, they look truly stunning at night. We originally had planned to come back later to see them all lit up, but this did not happen. Well, there is always next time. 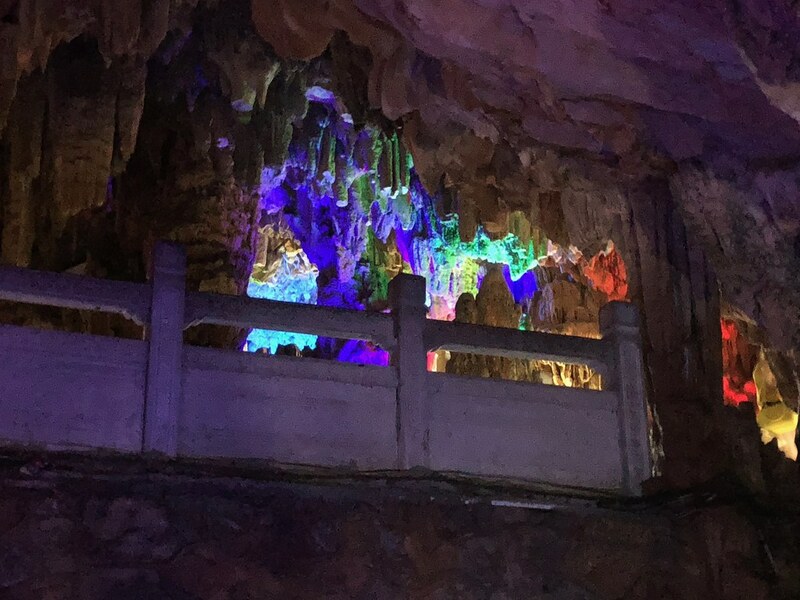 You can pay to go inside the pagodas and they are linked by a glass tunnel. We decided to pass on this. 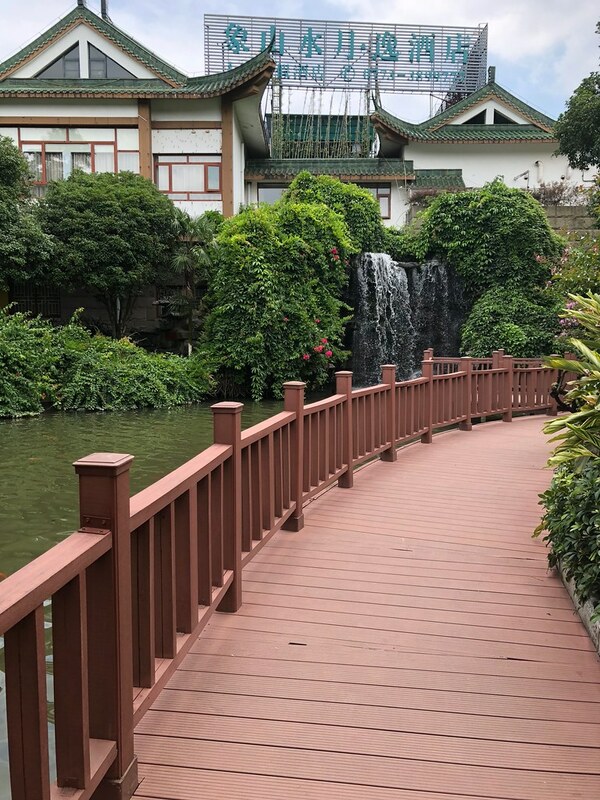 Instead we walked around the beautiful gardens by the lake. The footpath is a zig-zag bridge. 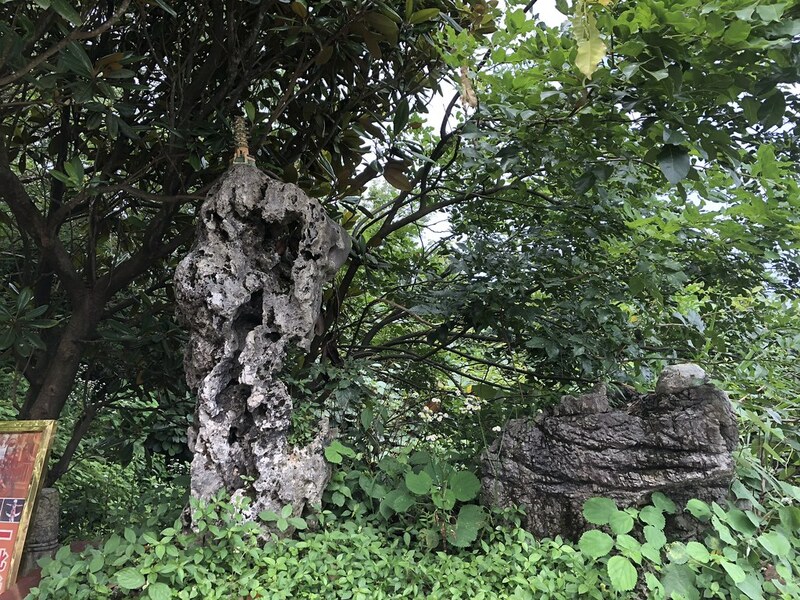 They are very common in Chinese gardens. 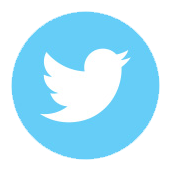 There are a number of different explanations why they are so popular. They are supposed to be structurally sounder than straight bridges. They are meant to improve mindfulness and also are in keeping with Feng Shui principles. My favourite explanation is that they keep away evil spirits who can only travel in a straight line. Above all, they are just very pretty. We took time admiring our beautiful surroundings and took a few photos. About half-way was an area with a shop, a restaurant and public bathrooms. I needed the bathroom, but there were only squat toilets there. I remembered that I saw a hotel around the corner earlier and I decided to go and check out if they had toilets in the lobby. They did, and it appeared that they had a throne as well, but the door was locked. I figured that this was occupied, but when nobody came out after 15 minutes, I came to the conclusion that this must be out of order. So, I had to bite the bullet and use the squat toilet again. Talk about cultural immersion! At least this seemed to be the deluxe version. I went back to find Graham, who was in an animated conversation with somebody. After chatting about different parts of China, he tried to convince us to come with him and he would write our names in Chinese letters. We politely declined and headed off. 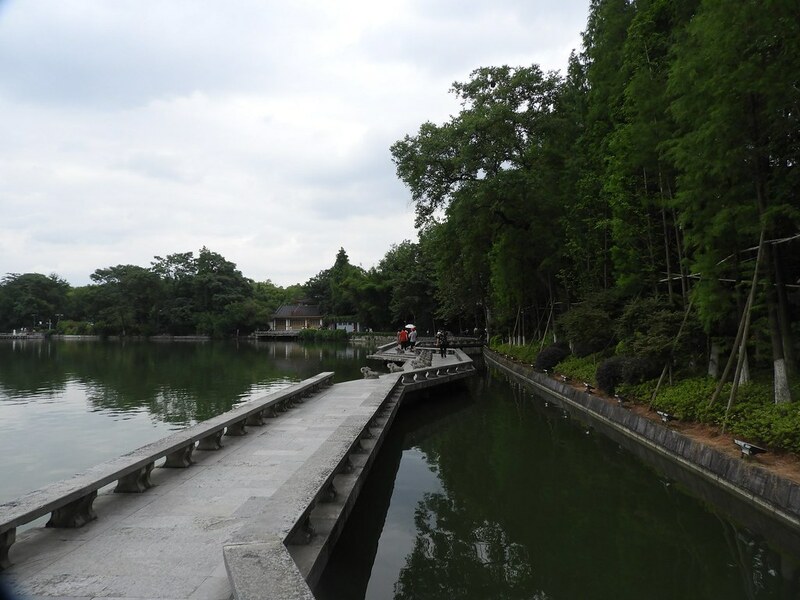 We finished our walk and left the park on the opposite side from where we had entered. We decided that we had seen enough for the day and took a taxi back to the hotel. 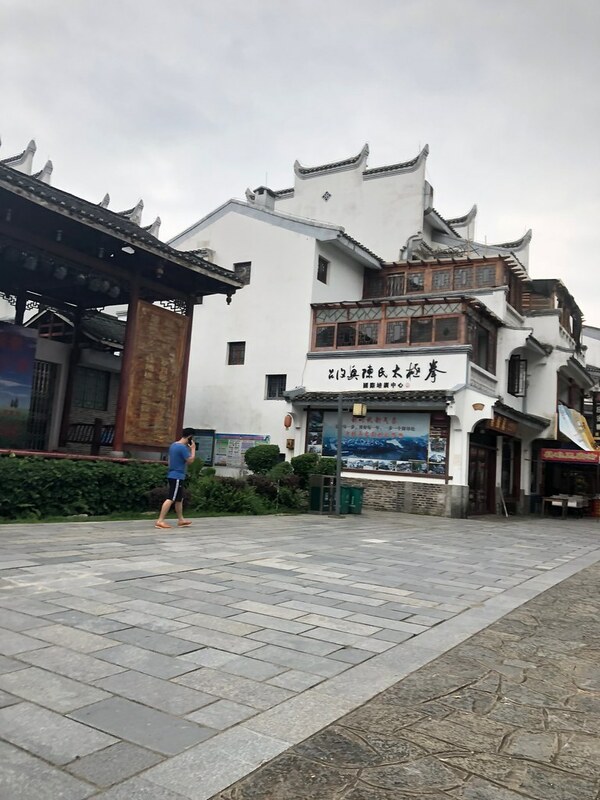 We decided that we may as well check out Lujia Village, where our hotel was located. 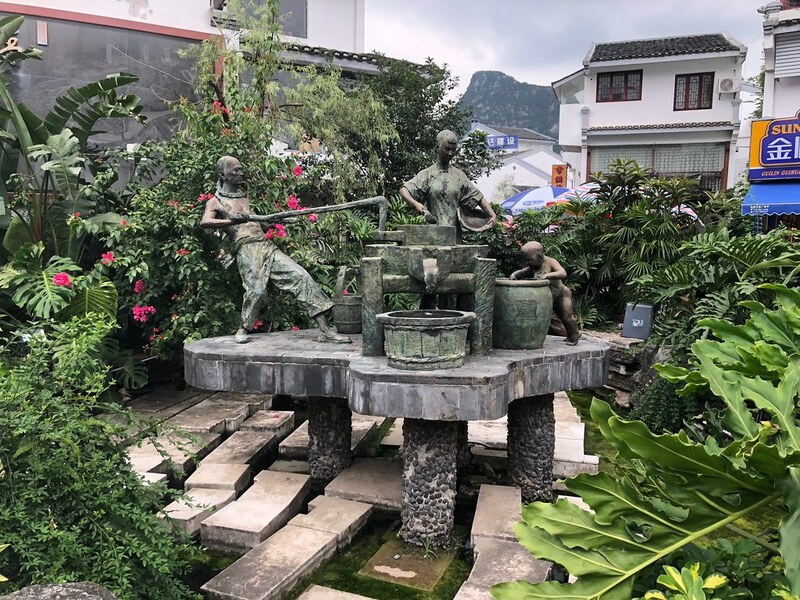 I rather suspect that this is about as authentic as Ngong Ping Village in Hong Kong, but this was more tastefully done. We arrived at the same time as two coaches full of Chinese tourists. We waited to see where they were headed and then went in the opposite direction. We did not walk very far until we came to a part of the village that felt like a ghost town. The shops, restaurants and hotels in this area where closed. 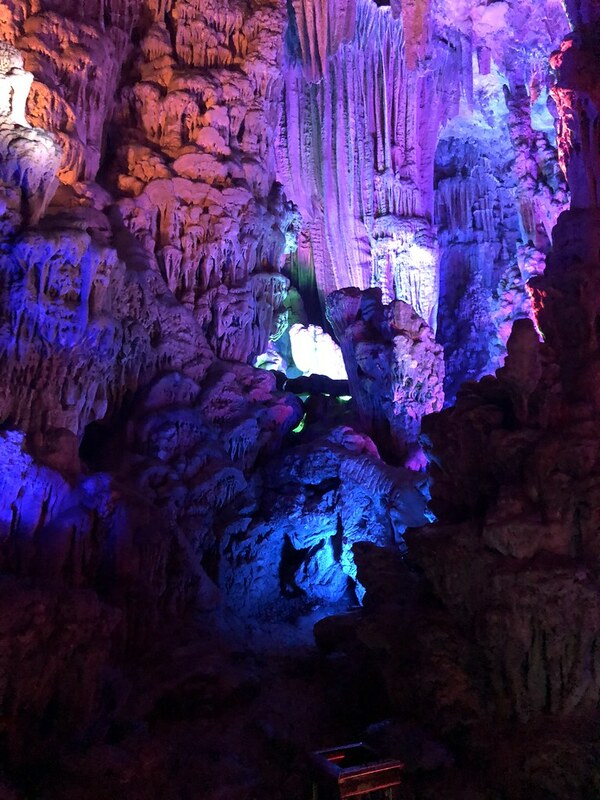 We did find the path leading to the Reed Flute Cave, which was on our to do list for the next day. We retraced our steps and there was at least some life although a lot of the businesses still appeared to be closed. 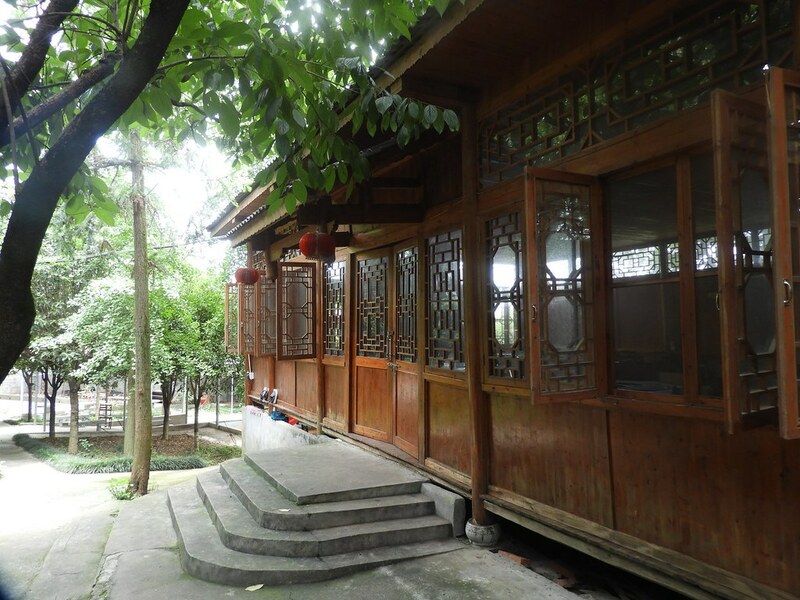 We came past a tea house and there were people sitting inside, but it still looked closed. The only part of the village that seemed to be thriving was the area closest to our hotel. Not only where there quite a few hotels that were open, but they all seemed to be full. There were also a number of restaurants that were definitely open for business, some shops and a market selling snacks and souvenirs. I really do not understand why so much of the village seemed to be closed as there appears to be plenty of footfall there. We had planned to eat somewhere in the village that night, but the restaurants that were open did not really appeal. We went back to the hotel and decided to have another look at the excursions folder. The excursion that we had originally considered no longer appealed as we had seen quite a bit of what was included that day. There was however another excursion that caught our eye. 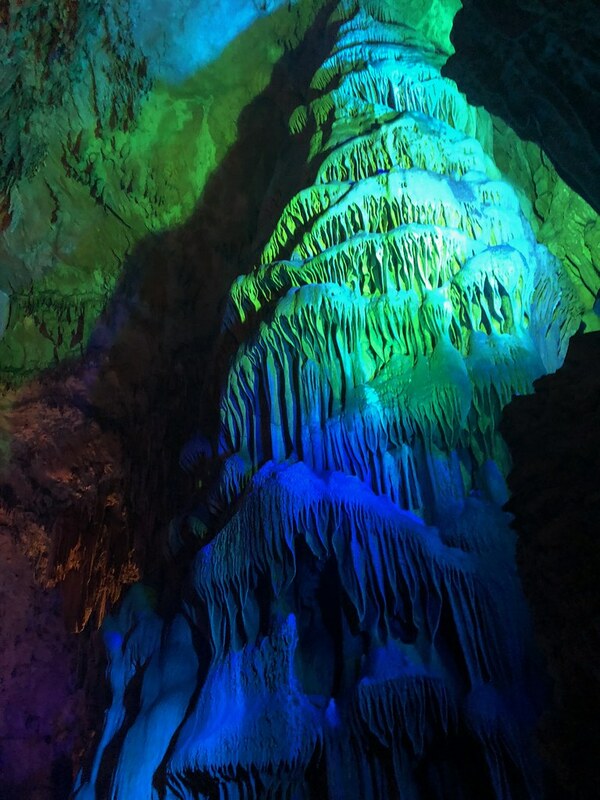 This combined the Reed Flute Cave and Yao Mountain with a visit to a tea plantation. We decided to book this for the next day. With this out of the way, we went up to our room. We ended up having a nap. Once we were awake again, we headed downstairs for dinner. 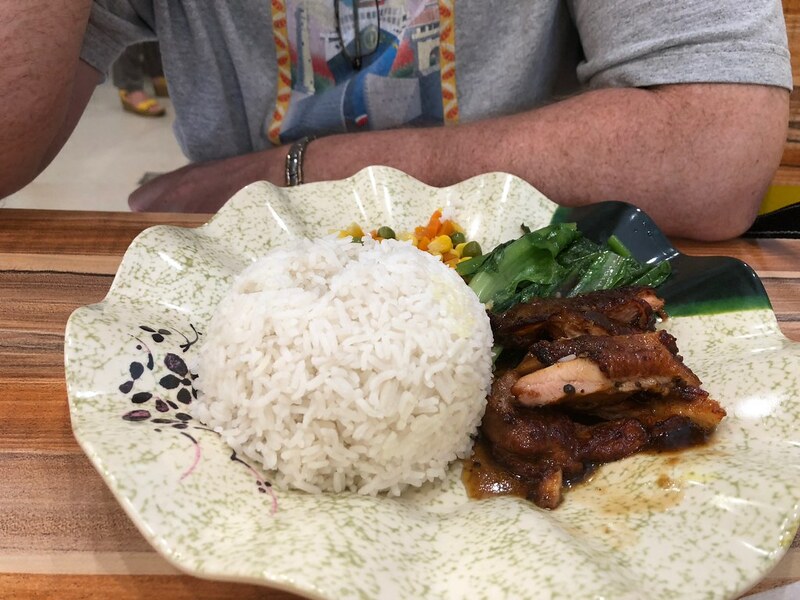 Graham had a beer and duck in beer sauce, which is a local speciality. 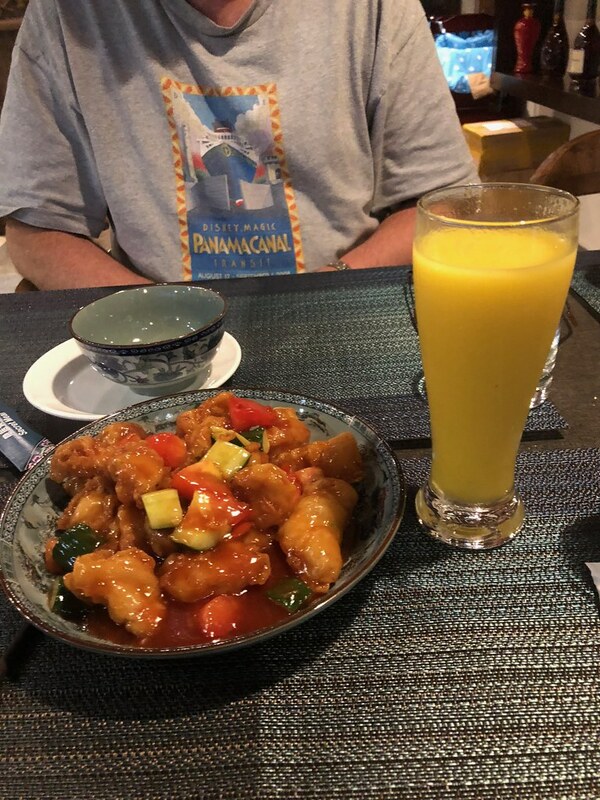 I had some mango juice and sweet and sour pork. We shared a bowl of rice. We were absolutely stuffed again. We decided to take another stroll around the village to see if this was livelier at night and to walk off dinner. It did not feel any different than it had been during the day. We went back to the hotel after a while and had an early night. Such a nice day! You got some beautiful pics! Thanks. There are even prettier photos to come. We were awake before our alarm went off. We enjoyed the lovely view for a bit and then got up and ready. I had a bit of a slow morning, so I sent Graham down to breakfast and said I would follow. By the time I got there, he had just about finished. I was not particularly hungry and was just going to have some dragon fruit and something to drink. However, he had found out something that was of great interest to me. They had soup noodles on the menu. I can eat soup noodles at any time of the day and night. 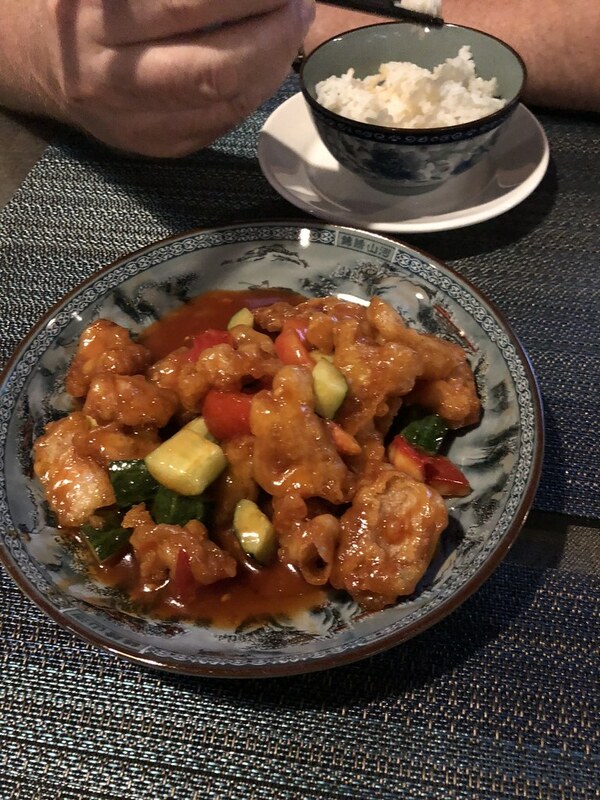 I ordered a bowl and they were absolutely delicious. They were made with chicken and the local beans. I also had some dragon fruit. When I had finished my breakfast, we went back to our room to get organised for the day. When we came back down, our driver was already waiting for us even though it was still some time before we were due to be picked up. We did not mind getting a head start. He escorted us to the car and be headed towards our first stop of the day. We were more than just a little surprised when he drove towards hat we thought was a footpath when we were exploring the village the day before. Apparently, this is a road and it took us straight to the Reed Flute Cave. He parked the car by the side of the road and we walked the short distance to the entrance. 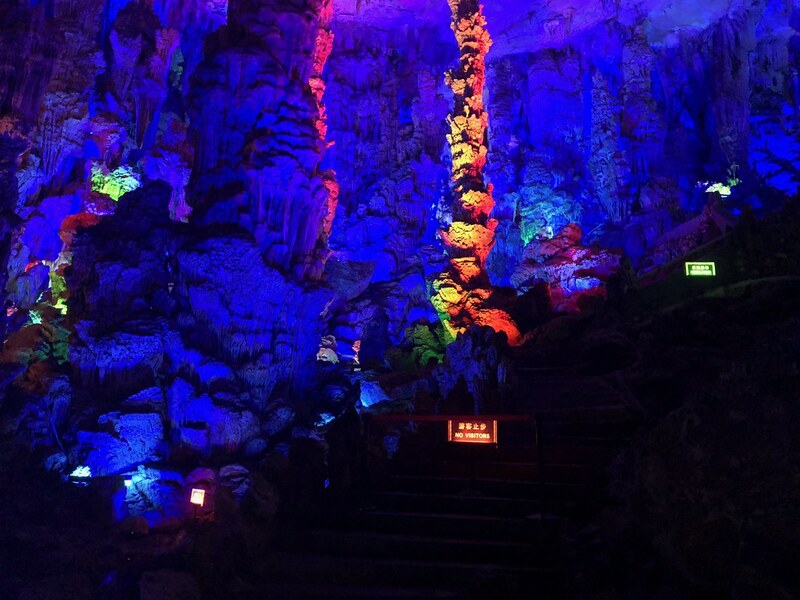 There were a fair number of stairs leading up to the cave. When we got to the top, our driver went to get our tickets. As we had left quite a bit earlier than planned, we had a little while to wait until our tour. 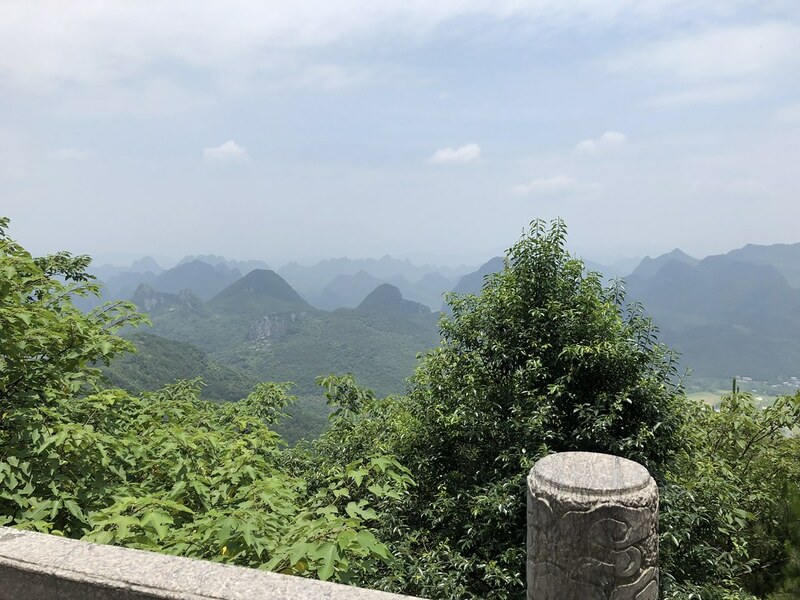 Our driver took us to a nearby overlook and the views from there were stunning. He then told us via the translation app that he would be waiting for us in the car. 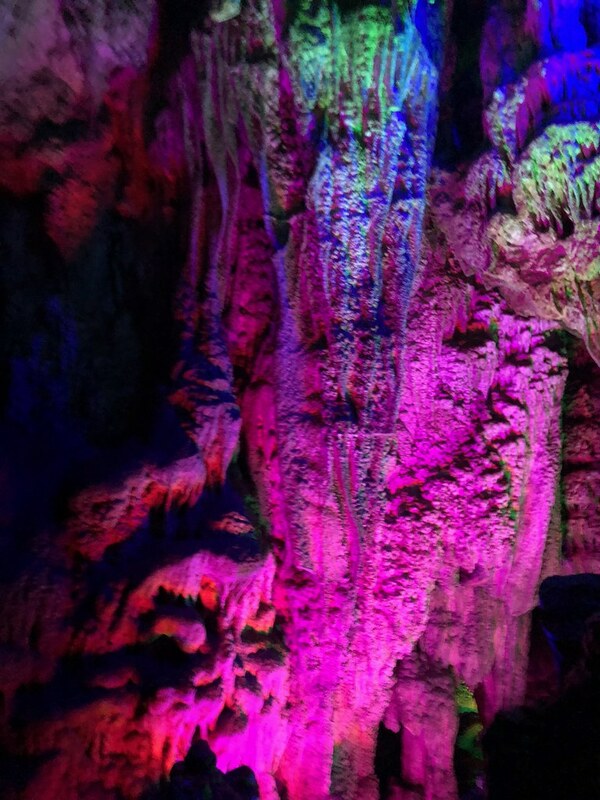 We got in line for the cave. A member of staff came and told us that it would be another 15 minutes or so until the tour was due to start. We were quite happy with this. We were in the shade and it was a beautiful day. More and more people started arriving, but we were the only people that were not Chinese. Our tour guide arrived and then our tickets were checked, and we were on our way. 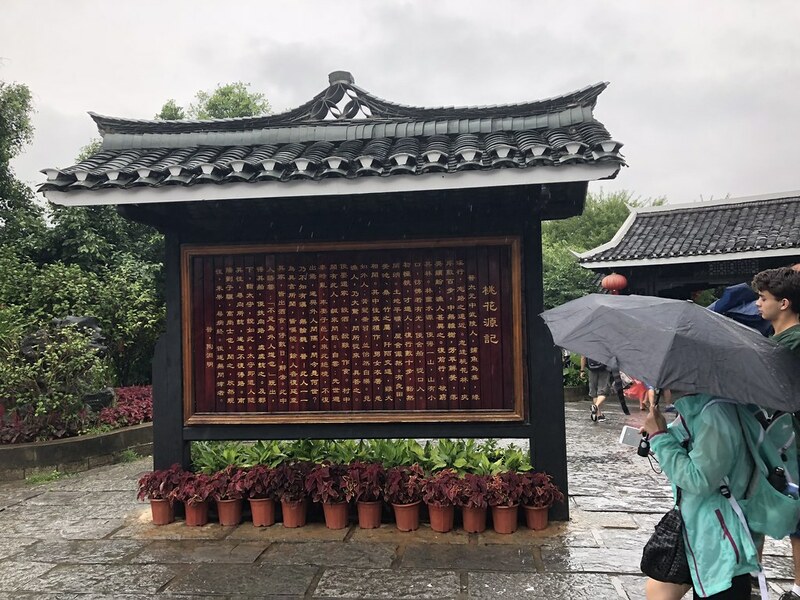 All the narration was in Mandarin and although I am sure it would have been interesting to be able to understand what was said, we still had a very enjoyable visit. 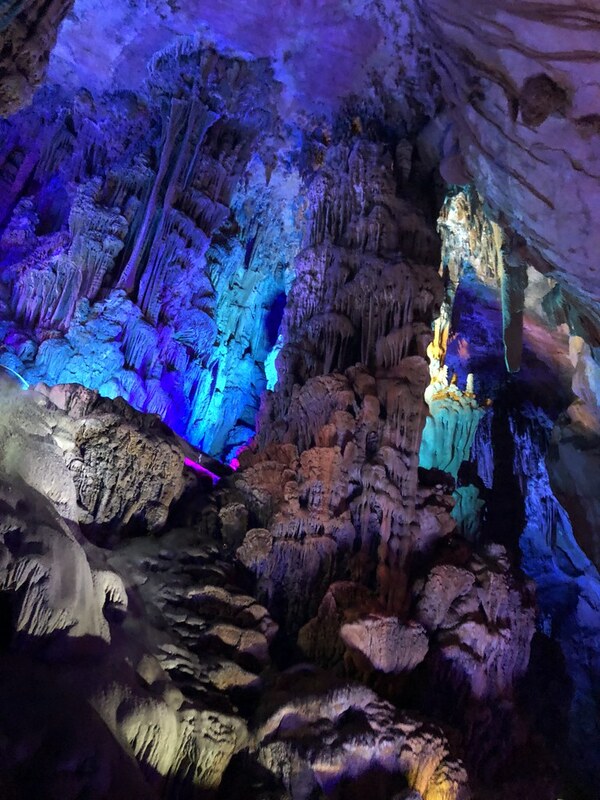 What is now the Reed Flute Cave started forming 180 million years ago and it is estimated that it was fully formed 700,000 years ago. 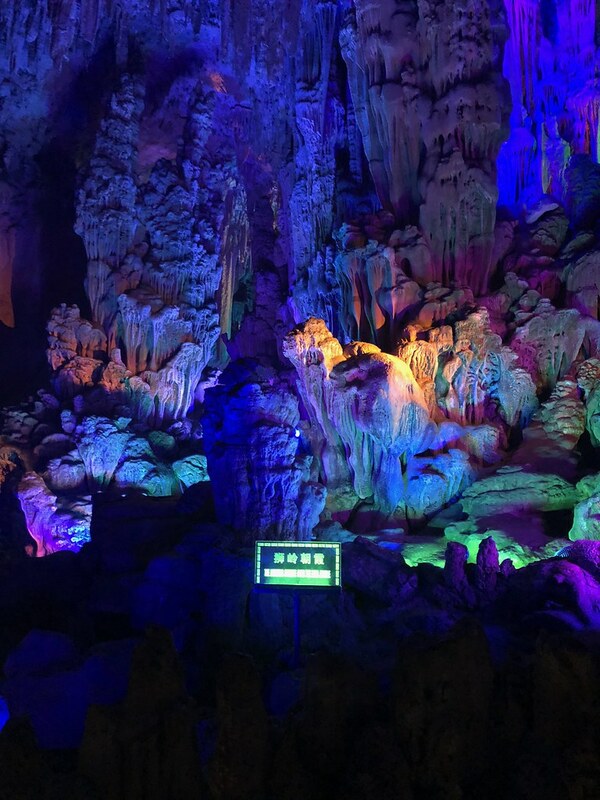 The Reed Flute Cave was created by water erosion and features various types of stalactites, stone pillars and rock formations. 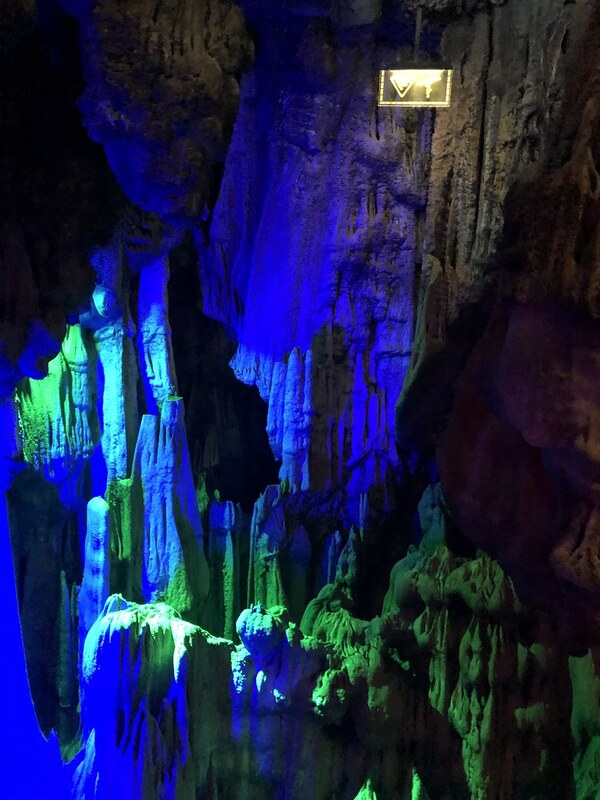 I am sure those natural structures alone would be quite a sight to behold, but they are illuminated by various coloured lights making this truly magical. 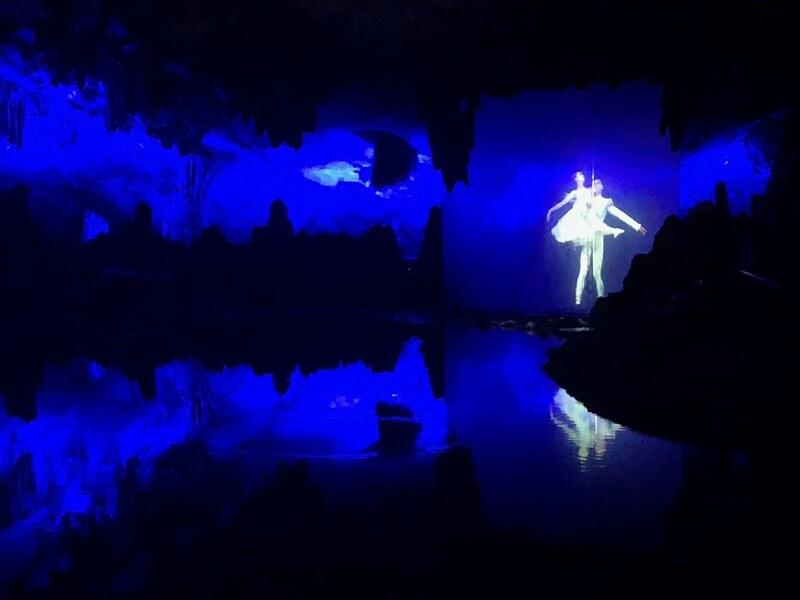 There are also various ponds inside the cave, which added another dimension. I was absolutely in awe of what I saw. There were professional photographers in a couple of places and we got our photo taken. I absolutely loved how it turned out and for 20 Yuan, it was an absolute bargain especially as it came framed. 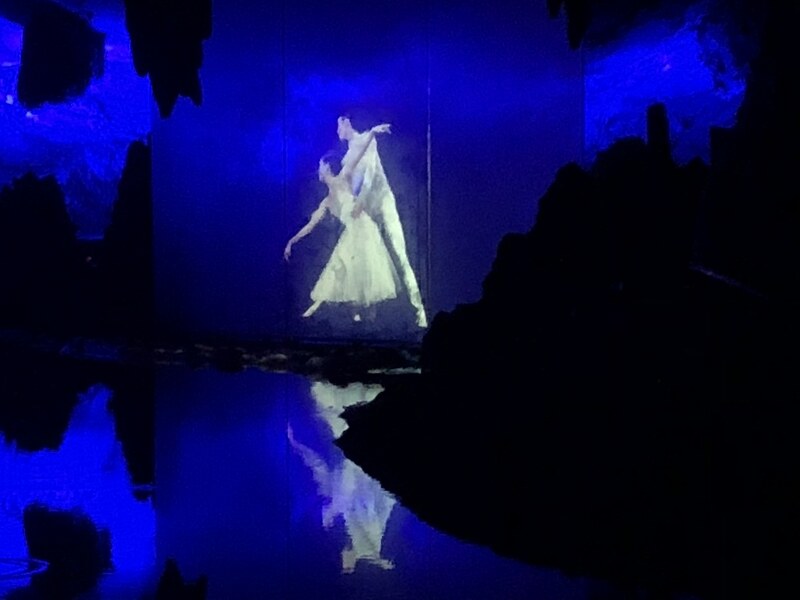 Near the end of the tour there was a show using light effects, projection mapping and water screens. It may not have been up to Disney standards, but it was still magical, and I thoroughly enjoyed it. 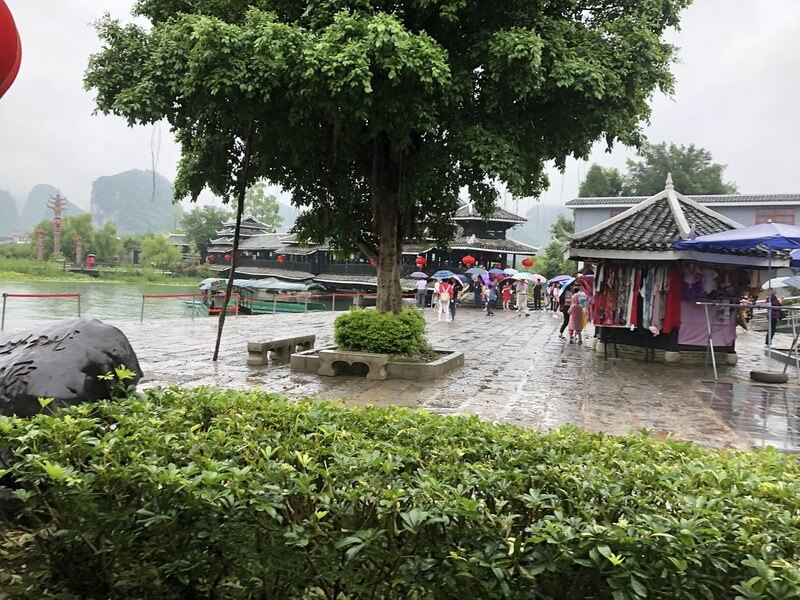 With this being China, at the end of the tour, there was the obligatory collection of shops. We picked up our photo and then we made our way towards the exit. There was one thing that caught our eye though. 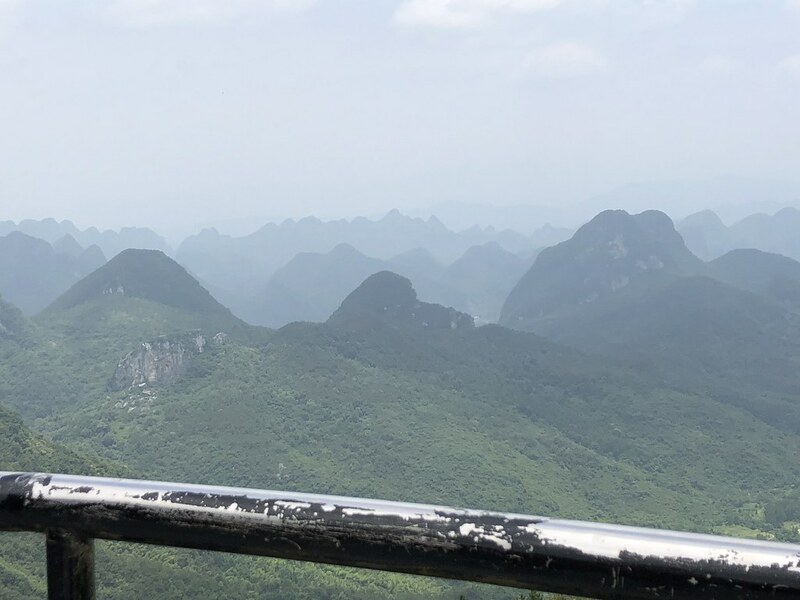 There was a young man, who was an art student who made beautiful ink paintings of the local landscapes using various parts of his hand rather than a paintbrush. They were stunningly beautiful and a fair price. If I had even a glimmer of hope that I could have got this home in one piece, I would have bought one. When we found the exit, we had a conundrum. We came out in a completely different place that we had come in and were not entirely sure where we were in respect to the car. We did spot some familiar landmarks and headed in the right direction. Our driver saw us coming and starting driving in our direction. We were soon back in the car and on our way to our next destination. 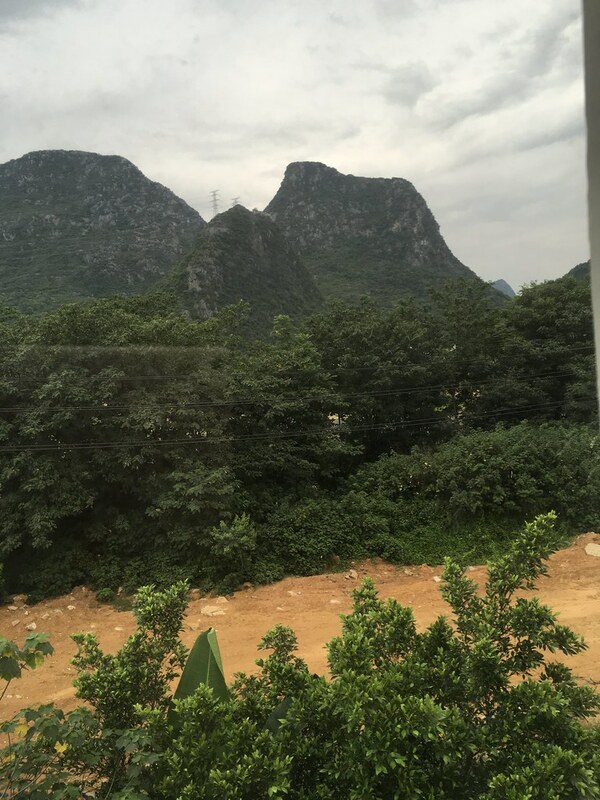 We drove through the suburbs of Guilin for a while, but soon we were out in the countryside. 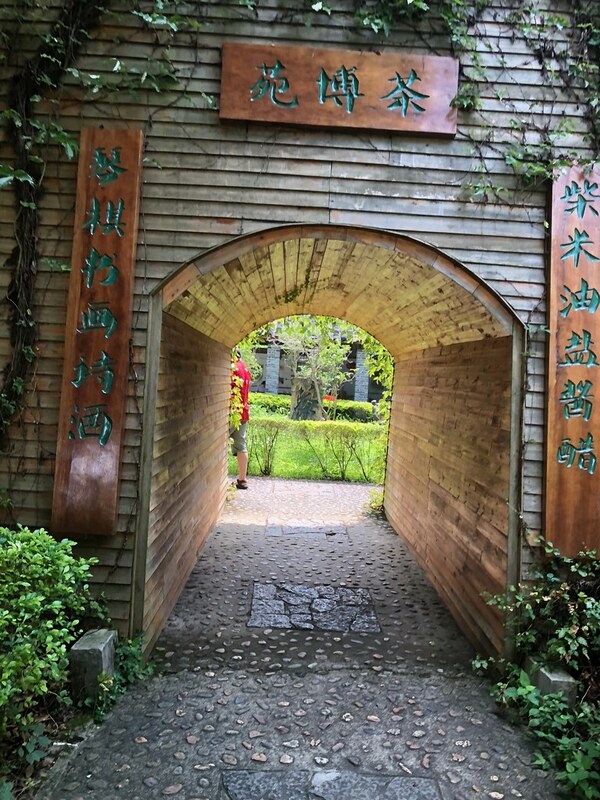 A short while later, we arrived at our destination, the Tea Research Institute. This is a government facility located in a former royal garden and they produce only organic tea. As soon as we pulled into the car park, we were welcomed by our guide. We headed straight to the plantation. 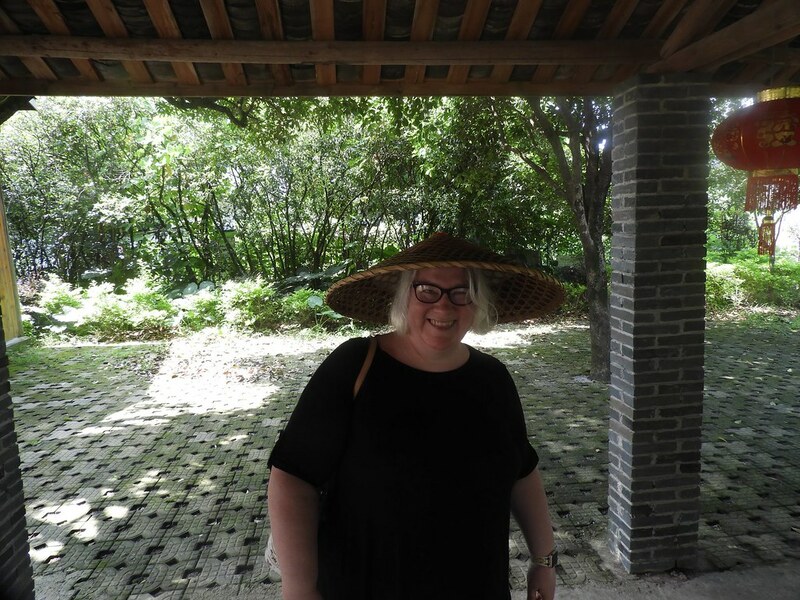 We were equipped with some traditional Chinese hats to keep off the strong sun and then we ventured out into the plantation. The main harvest season was over, but they produce tea year-round and there were people picking tea on the plantation. The scenery on the plantation was absolutely spectacular. 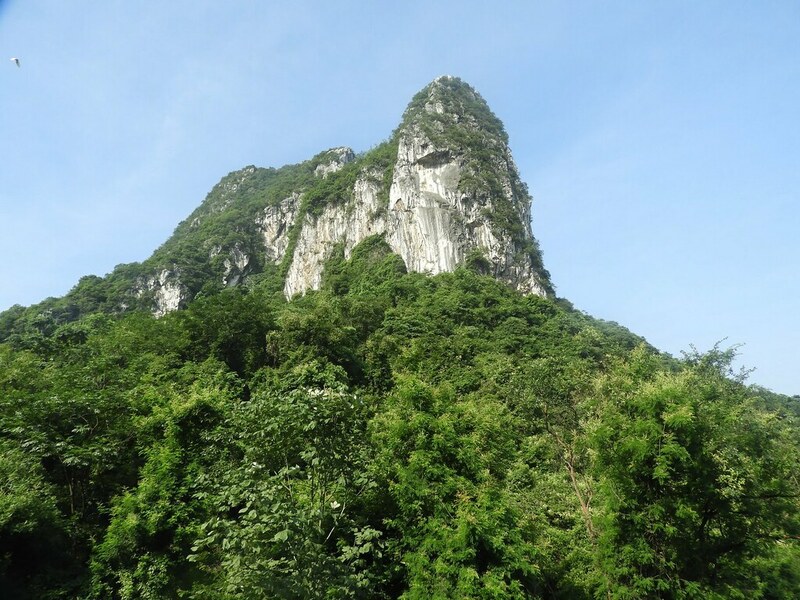 The plantation is at the foot of Yao Mountain, which is the highest mountain in the province. We would head there later in the day. 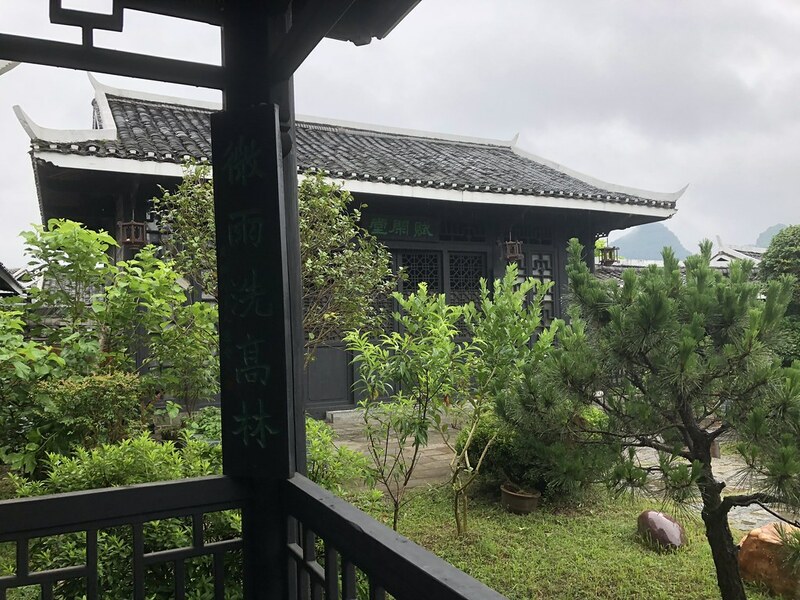 They have another plantation on the mountain, where they grow yellow mountain tea, but this is not accessible to the public. 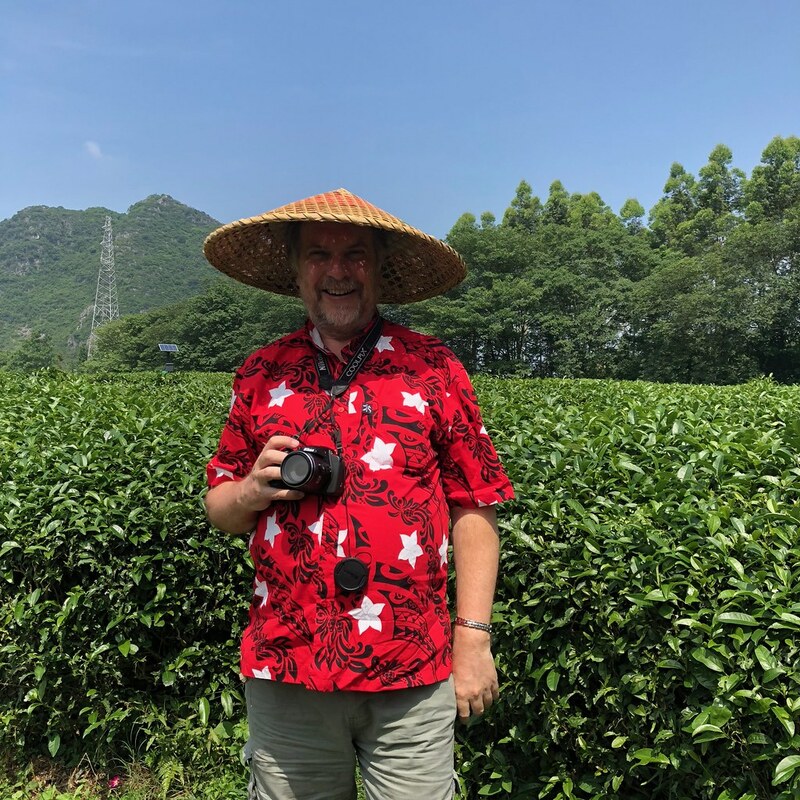 After we were given a while to wander around and enjoy the scenery, our guide picked some tea to show us. High quality tea consists of varying combination of tea buds and tea leaves. White tea, which is the most expensive tea, only contains tea buds. It is also referred to as Silver Needle tea as this is what the dried tea buds look like. 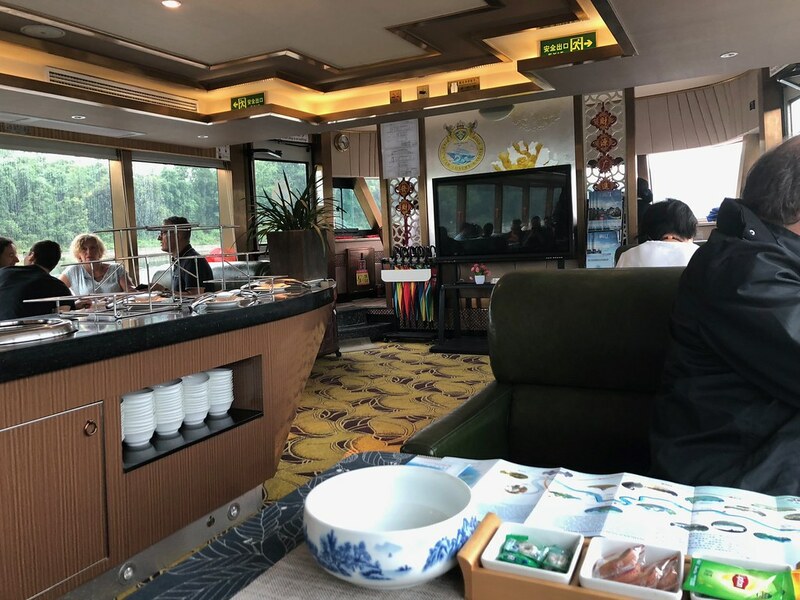 First class tea consists of an equal amount of tea buds and top-quality tea leaves. 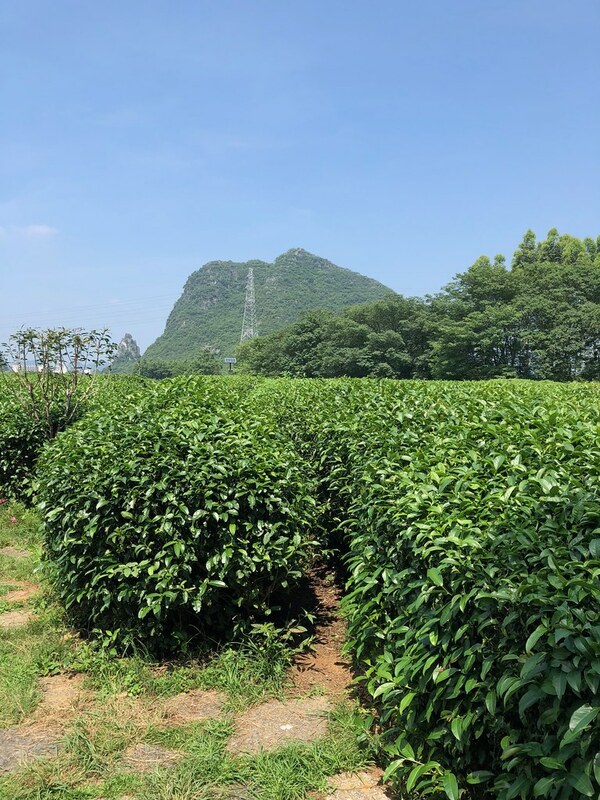 The second-class tea has two tea leaves to every tea bud and so on. 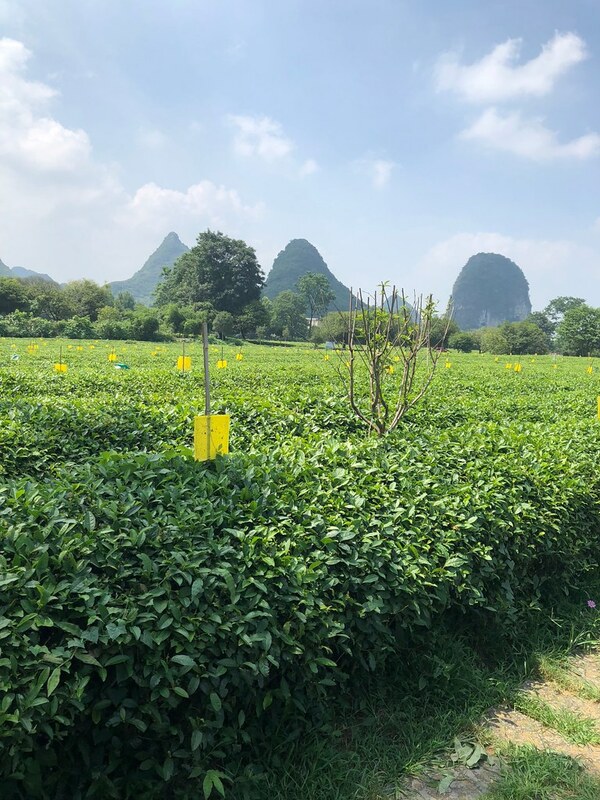 The lower quality teas only consist of tea leaves and not the prime ones either. 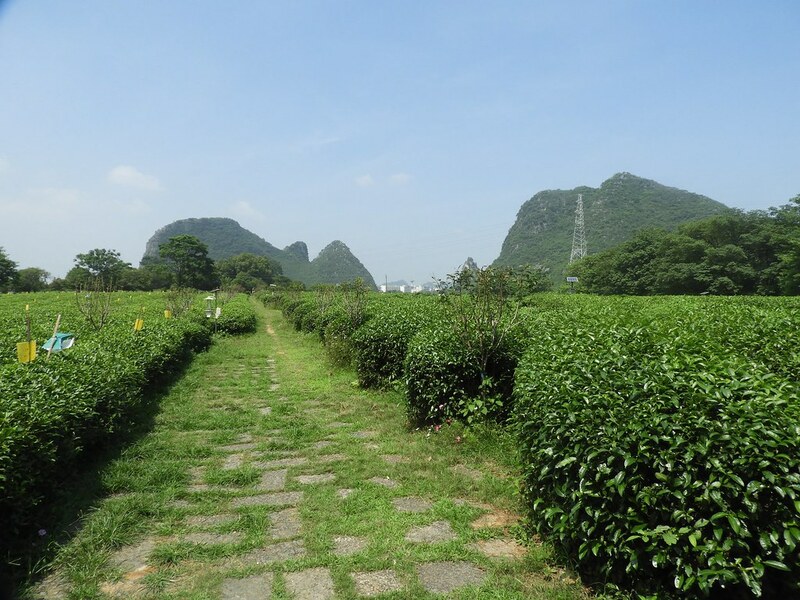 On this plantation, they only produce first and second-class tea. 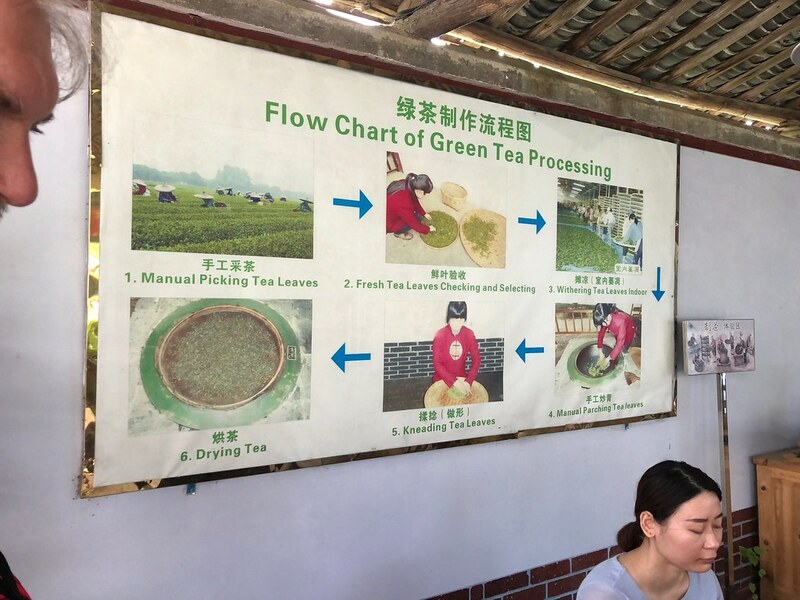 We then left the plantation and were taken to an area where there was a photo display of the various production stages of tea. White tea is just air dried, but all the other types of tea are “cooked”. They had a demonstration of this process set up. 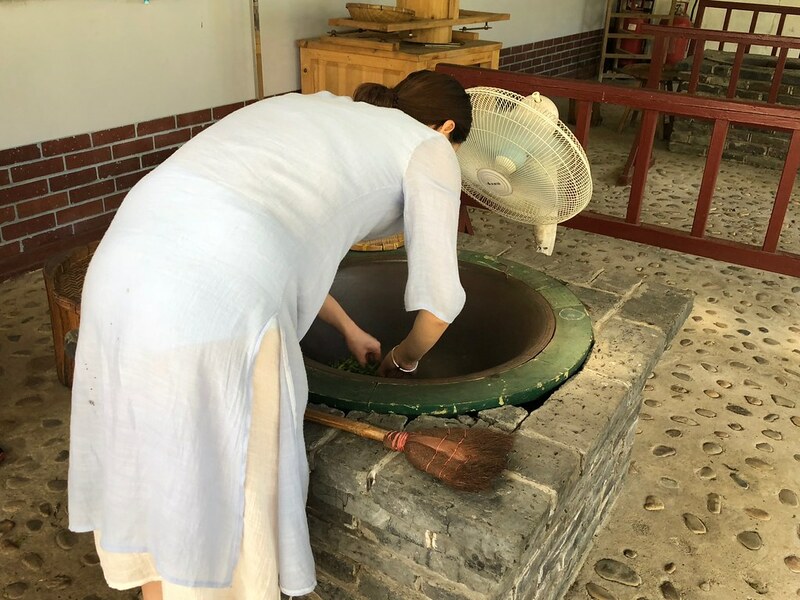 Essentially, they use something that looks like a giant wok over a fairly high heat and put the tea leave and buds in this. This dries them out very quickly. Green tea is ready after this and black tea is left to ferment. I was absolutely fascinated by the production process. We then moved on to my favourite part, the tasting. We got to try four different types of tea: Jasmine tea, Osmanthus tea, yellow mountain tea and compressed tea. Compressed tea is their version of Pu’er tea, which is Graham’s favourite tea. It is a fermented tea that is left to age. Like a good wine, the longer it is aged, the better is meant to be. 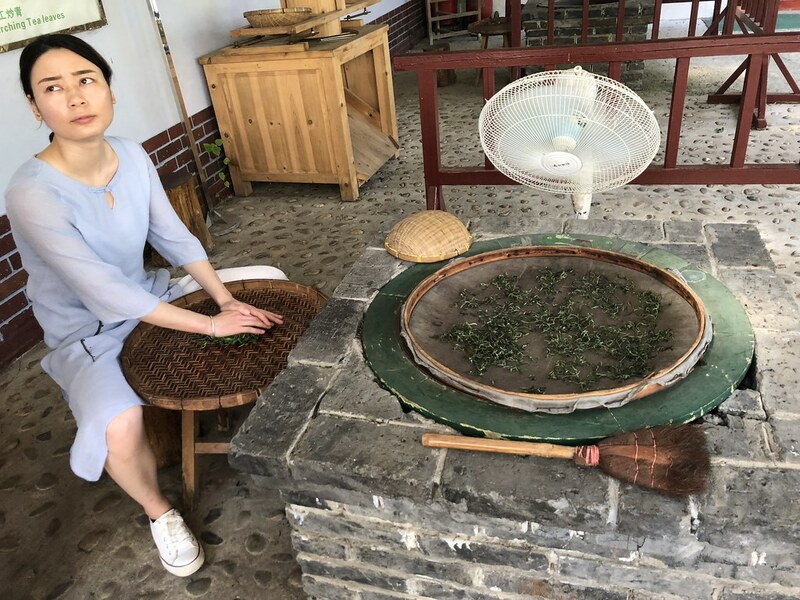 The compressed tea in Guilin is made into big tea bricks rather than the individual shapes of Pu’er tea. They have special tea knives to use with this. I would have loved to try some white tea, but I suppose this is just too expensive to be served at a free tasting. Our host introduced the teas we would taste and encouraged us to smell the tea leaves. He then explained the various thing that were on the table from tea scoops and tea knives to strainers, tea pots and cups. We were then introduced to the proper etiquette of making and drinking tea. Then it was time to actually drink the tea. My favourite was the Osmanthus tea. I was also pleasantly surprised by the compressed tea. I don’t like Pu’er tea, so I did not expect to like this, but this had a much more mellow taste to it. 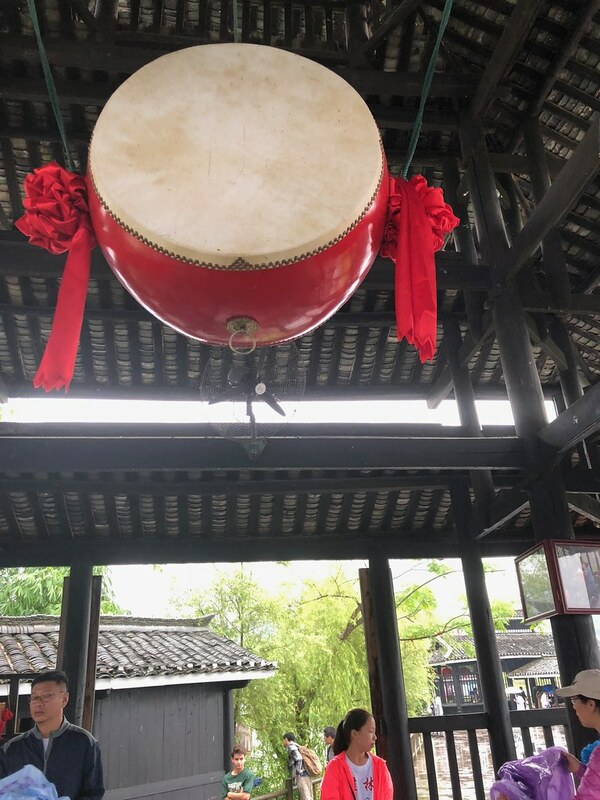 Once our little tea ceremony was over, we were shown to the obligatory shop. This time I did not mind as I was hoping to get some tea. I ended up getting two big boxes of Osmathus tea. This is the most expensive tea I ever purchased, but you only need a small amount. I have had this almost every week since we returned, but this has hardly made a dent into the first box. Graham got some high mountain yellow tea. With our purchases complete, we went back to the car. 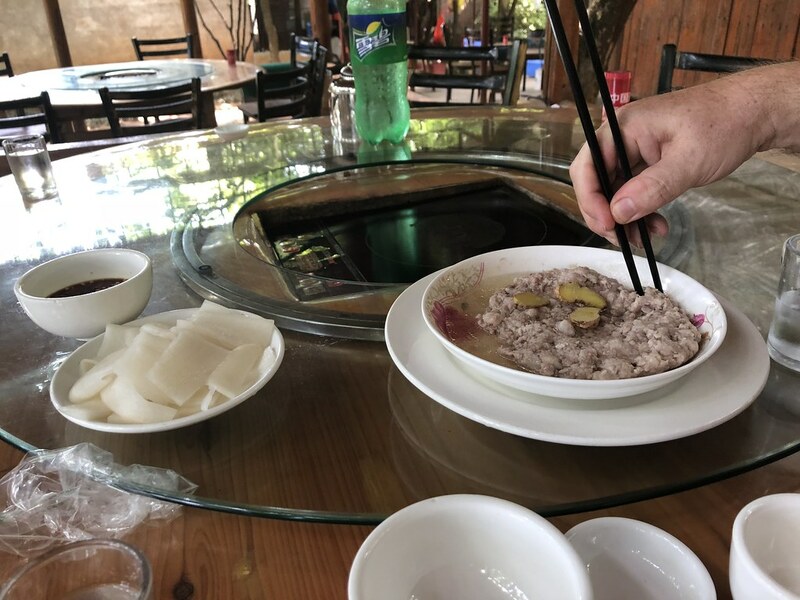 Our driver asked us via the translation app if we were ready for some lunch, which we were. We headed to a farmer’s restaurant. They are quite common in China and we have eaten in a farmer’s restaurant before. However, that had been a pretty standard restaurant. This one was decidedly quirky. Essentially the whole place was outdoors in a piece of woodland. There was a roof over the tables, but there were no walls. 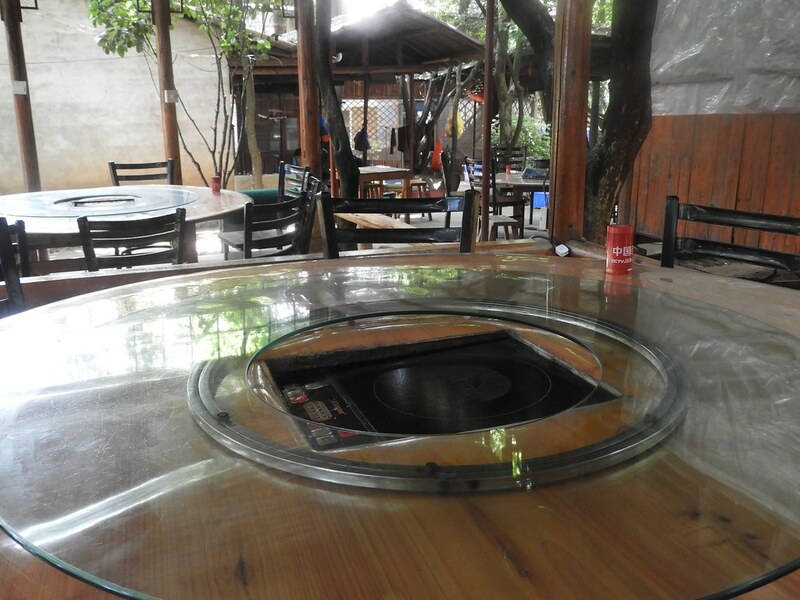 There were a number of wooden huts with larger tables. I assume they were private dining areas. They were not quite ready for us yet and we were encouraged to go exploring. 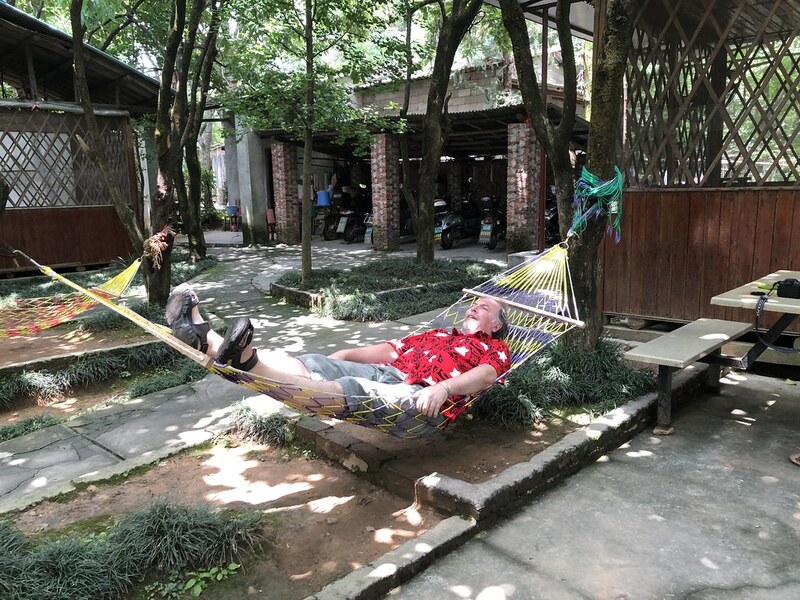 There were hammocks dotted around the place and Graham tried one out. I was not brave enough. After a while we headed back to the table. Food started to appear shortly afterwards. This was a very different kind of food, but most of it was delicious. 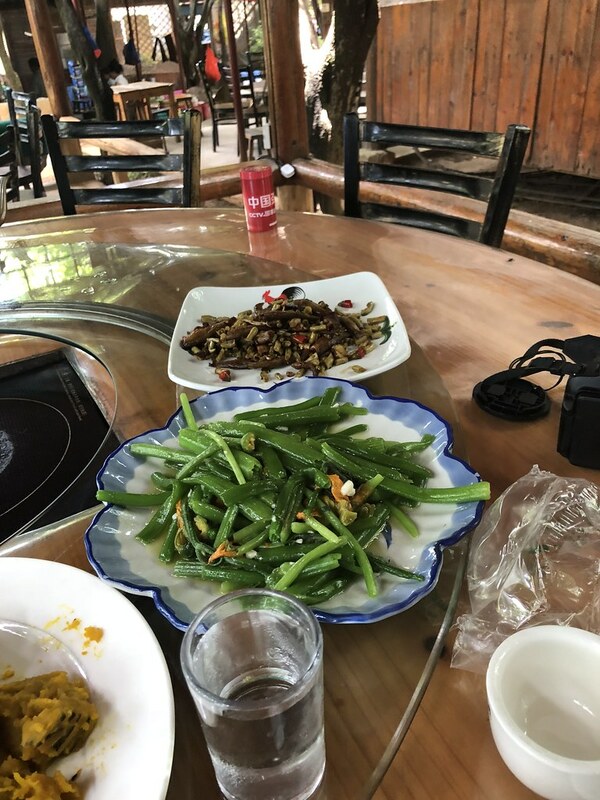 There was some pickled radish and some green beans with garlic and chilli, which were both too spicy for me. However, I loved the rest. There was a dish with minced pork braised in a broth with a touch of ginger. There was a pumpkin stew. 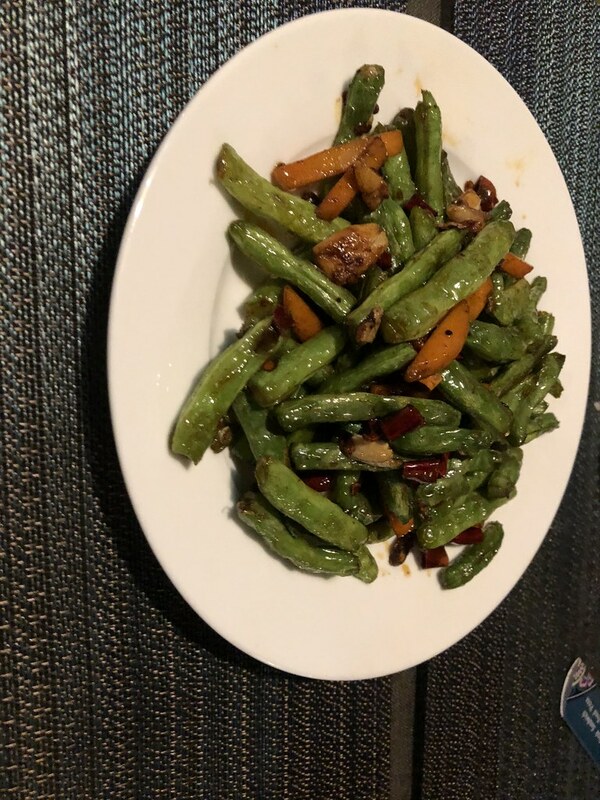 There were also stir-fried pumpkin vines. It had never occurred to me that they were edible. However, they had a subtle, slightly nutty flavour and a satisfying crunch. Soon we were stuffed again. Lunch came with water and tea. 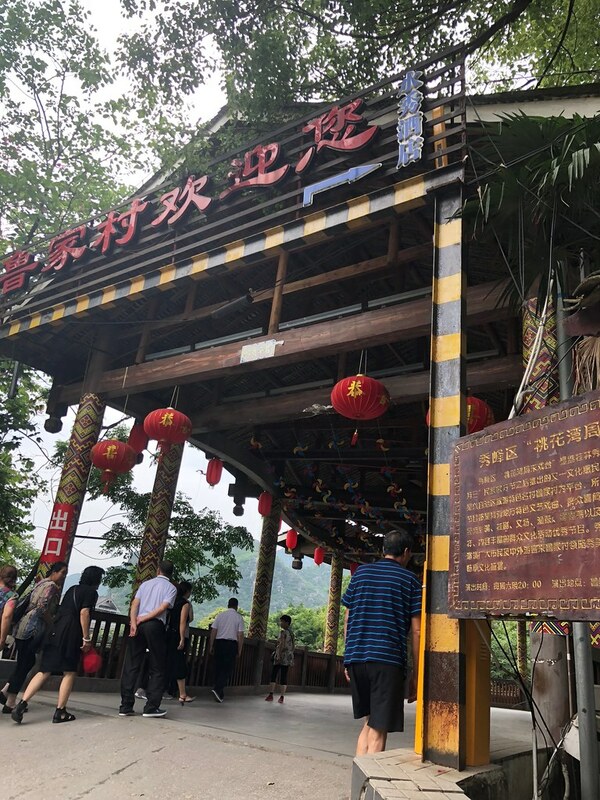 After lunch, we headed to our final destination, Yao Mountain. 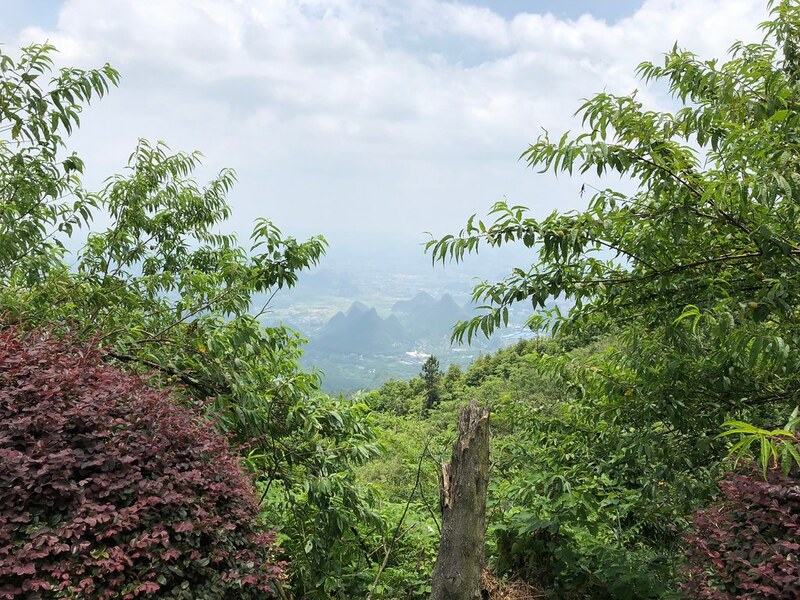 Yao Mountain is the highest mountain in this area at 909 meters. 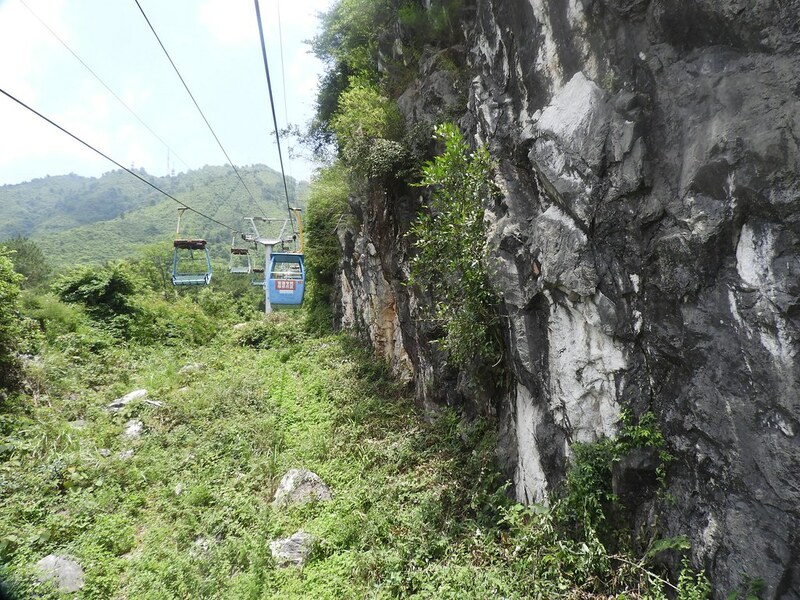 It features a cable chair lift, which was the first one in this region. Considering that this is a major tourist attraction, the road leading up to it is interesting. It was little more than a gravel path. 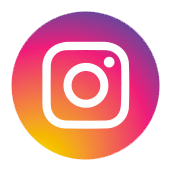 Apparently, it recently had a facelift, so I hate to think what it was like before. Once we reached the car park at the bottom of the mountain, our driver got our tickets for the chair lift and showed us where the entrance was. Then we were on our own. 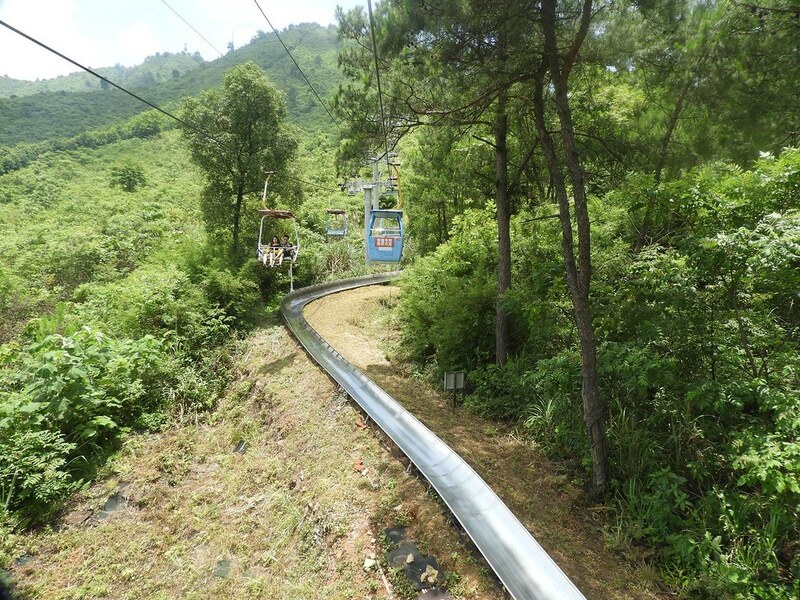 The chair lift covers a distance of just under a mile and goes through some very pretty countryside. It takes about 20 minutes. We saw some mountains, but a lot of the ride went through forest. 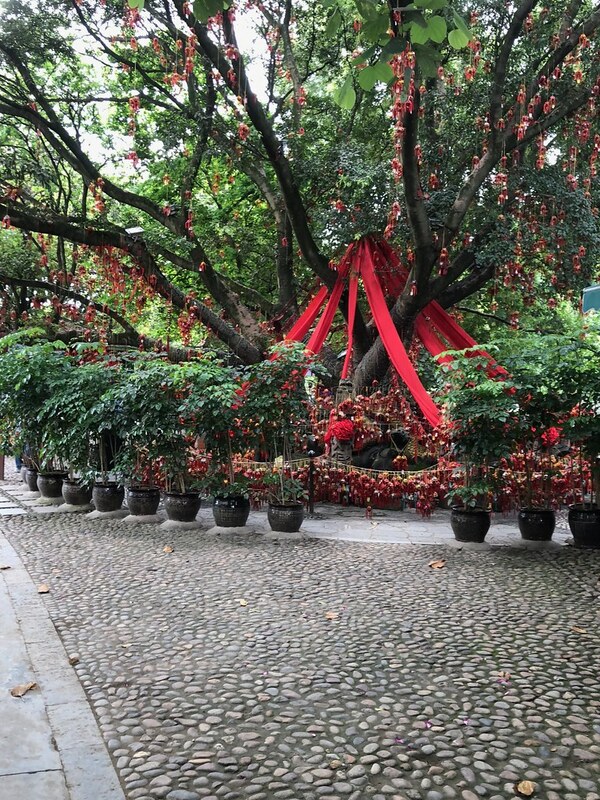 One thing that I was absolutely fascinated by was that a lot of the trees had ribbons tied to the branches and also had silk ornaments hanging from the branches. I have no idea how they got there as there was no path near the trees and the trees were also very tall. All the decorations were quite a sight to behold. 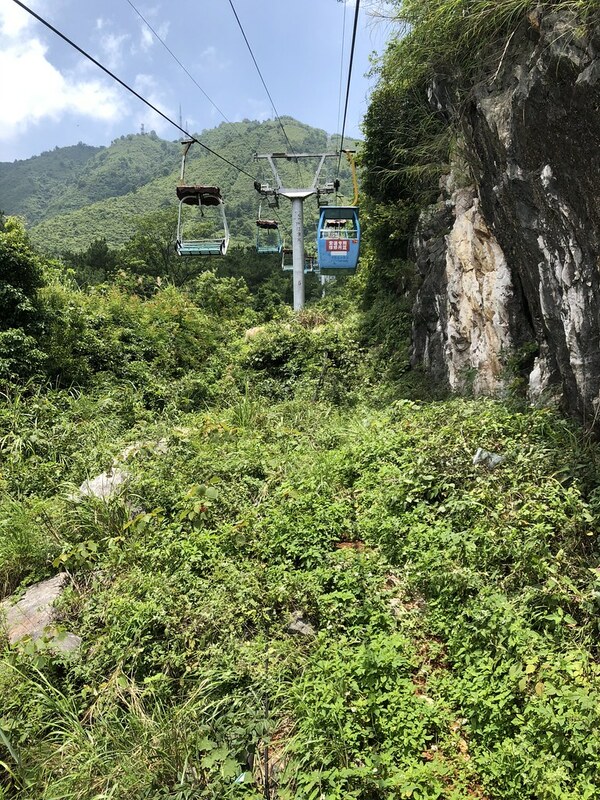 We also noticed that there were some gondolas mixed in with the chairlift. They were all empty and I did not see a pricing option for them. I wonder if they are just for VIPs. About halfway up the mountain there was a platform and a professional photographer took some photos. They were offered for sale as soon as you got off the chairlift. They were 20 Yuan, so we bought this. Unfortunately, the photo paper and/ or ink is not very good quality and by the time we got around to scanning this four months later, the colours had faded quite a bit. It is still a nice memory and at that price, nothing was lost. 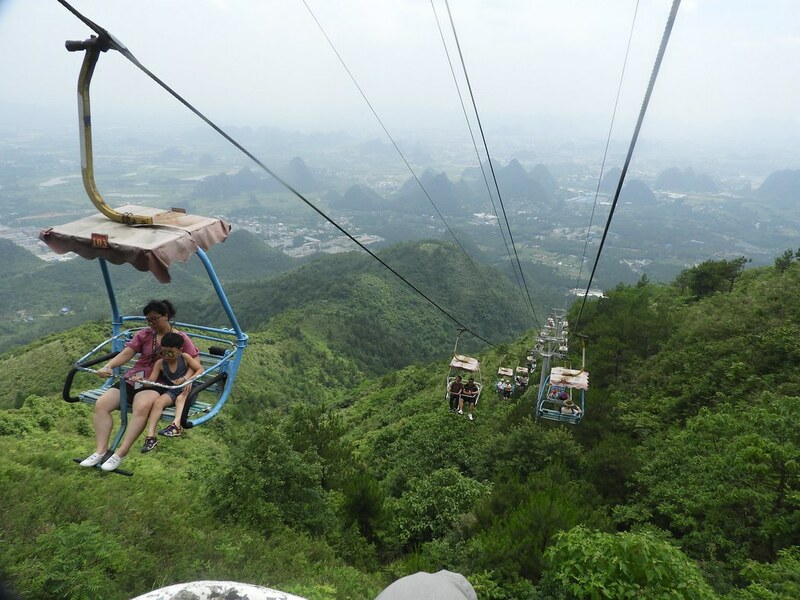 There are viewing areas at various levels with great views over the surrounding mountains. We enjoyed the views. 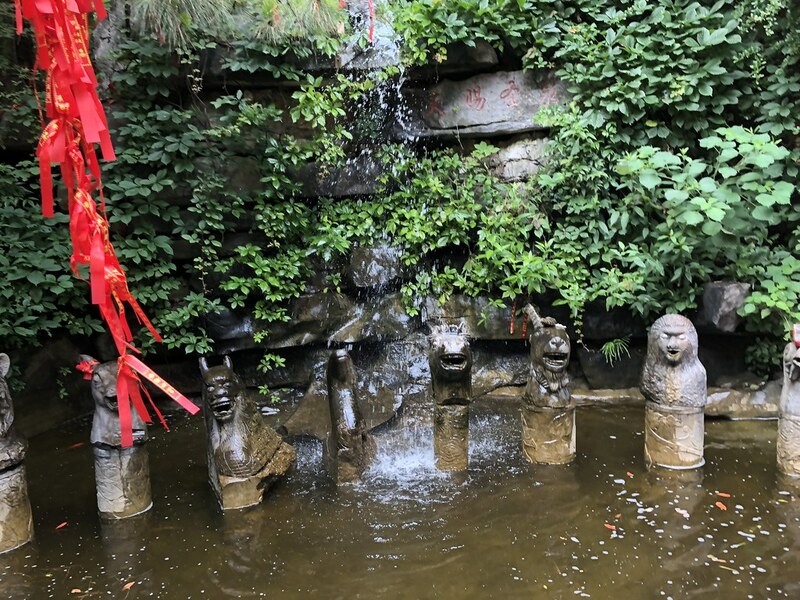 There are also some traditional buildings, a sundial, golden statues and an interesting fountain with the animals of the Chinese zodiac. There was also a path leading further up the mountain and the trees along this path were all decorated with red ribbons. We spent about 90 minutes up there taking it all in before we returned back to the cable car to return to the bottom. When we got off the cable car, we ended up inside the geological museum. The first thing we saw was a dinosaur skeleton and there were all kinds of fossils. 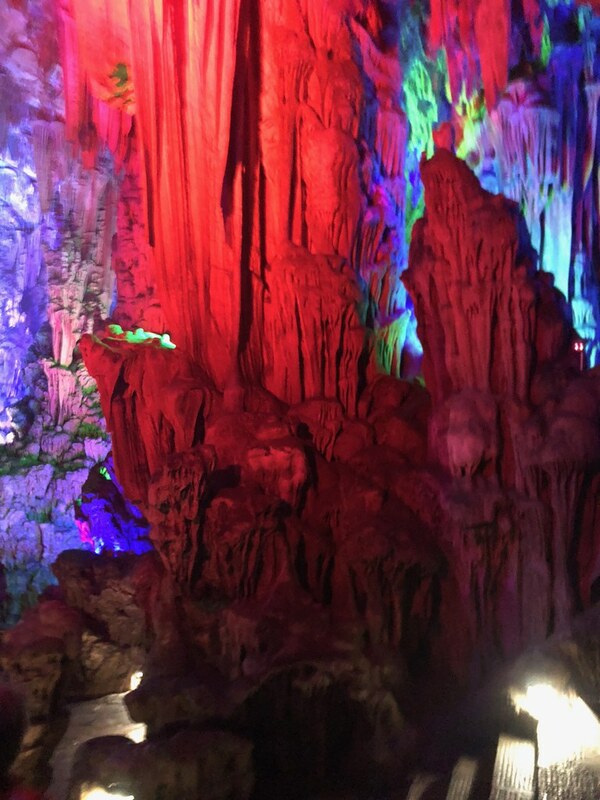 The area I wound the most interesting though was a large room with all kinds of colourful crystals and semiprecious stones. The sheer size of some of them was mind-blowing. On the other side of the museum was the obligatory shopping area. This was almost like an indoor market with souvenirs, jewellery, textiles, spices, food and drink and some scary looking things in big glass jars that I do not care to ask too many questions about. I think they are probably linked to traditional Chinese medicine. We were offered a sample of some drink. I took it, but Graham declined. I had no idea what I was having, but I really liked it and decided to buy some. We were handed a box with 6 bottles containing about half a pint each and this cost 30 Yuan for the six bottles. The label contained Chinese writing and Pinyin (essentially Mandarin transcribed into our alphabet) and with this I was able to figure out what I had actually bought. This was Osmanthus wine. This is not a very accurate description as this is much stronger than any wine I have ever had and would more accurately be described as a spirit. It is very yummy though. Once we found the exit, we went back to the car. Our driver asked if we were ready to go back to the hotel, which we were. We had a very full day. It did not take long until we were back at the hotel. We were welcomed back with some ice-cold water, which was very welcome. While we were still drinking our water, the driver walked in and motioned us over to the table in the lobby. They have everything set up there for making proper tea and he started making tea. We never figured out what his relationship was with the hotel, but he seemed to be a part of the operation. We had nowhere to be, so we happily accepted the tea. The simple act of having tea is actually one of the fondest memories I have. 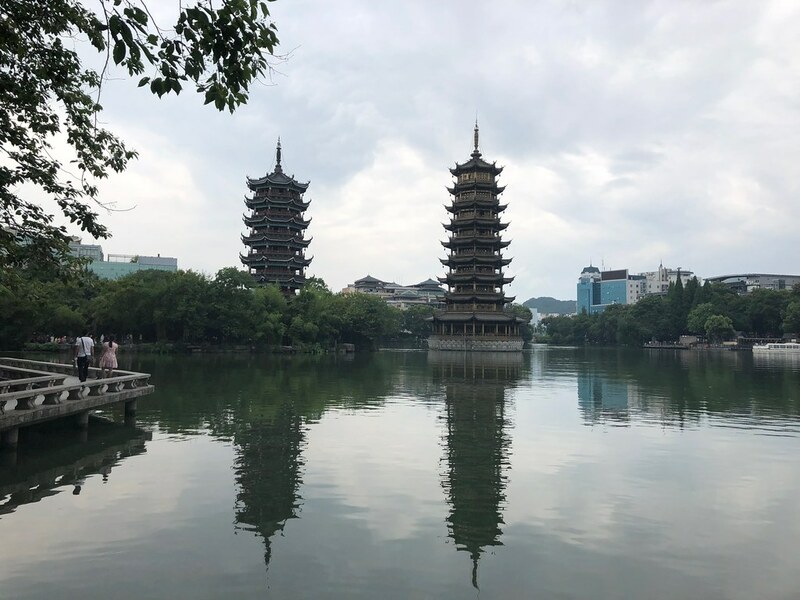 We were joined shortly afterwards by a young woman who had just graduated from the university in the provincial capital Nanning and who had worked as an intern in the hotel earlier in the year. She had come by to say goodbye as she was leaving the next day to try to get a work permit for Hong Kong. We were soon joined by Amy as well. There we were, a bunch of virtual strangers with not all of us speaking the same language and yet it just felt right. Amy and the young woman whose name I have sadly forgotten translated between English and Mandarin. 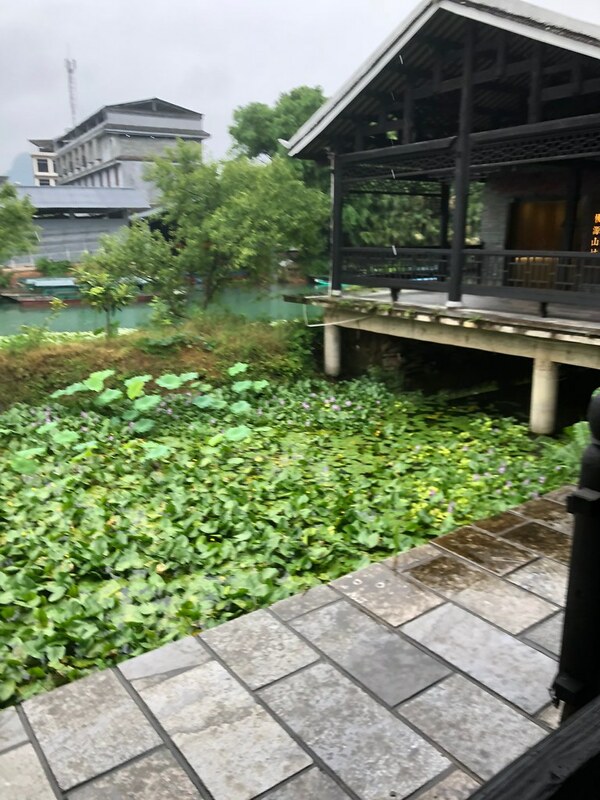 If I had not already fallen head over heels in love with this country anyway, the hour or so we spent drinking tea in the hotel lobby would have been enough to make me fall in love with China and its people. After dinner, we took another stroll around the village. Once we got back, we packed. We then had the rest of the lychees and a bottle of the Osmanthus wine. After reading for a bit, we settled down for the night. The food was as delicious as it looked, too. Thanks. 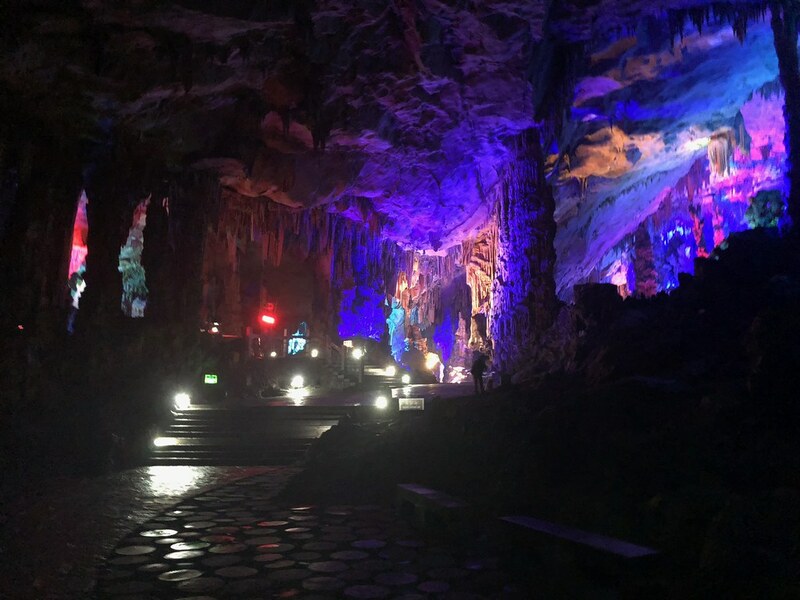 We definitely got to visit some amazing places on this trip and it is a huge privilege that we have the chance to visit places like this. We woke up to the realisation that the sad day of leaving had arrived. 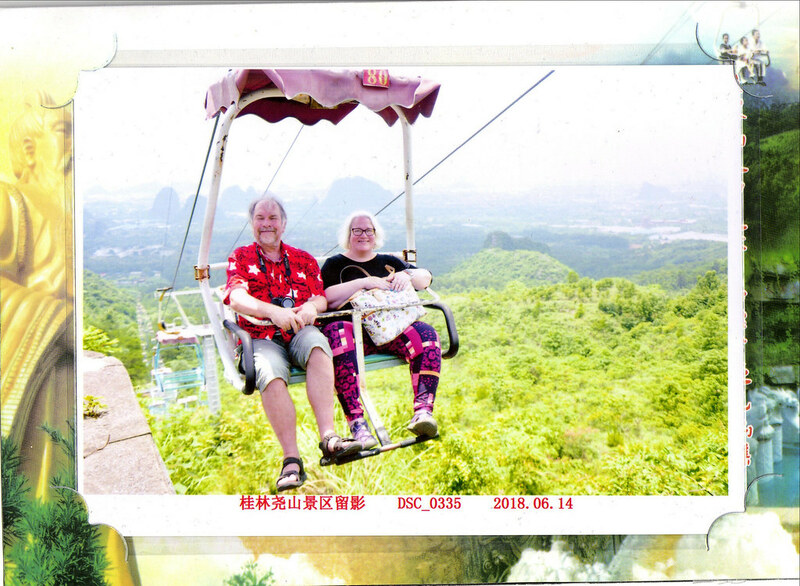 Our time in Guilin had flown by, but at the same time, we had made memories to last a lifetime. We got up and ready. Then we headed downstairs for breakfast. I had another bowl of soup noodles, bacon, egg, sausages and steamed buns. Graham had bacon, egg, cake and fruit. There was a strange atmosphere there this morning. Somebody rather official looking had arrived, and this had an effect on the staff. I assume that this was some kind of government inspector. After breakfast, we went back up to the room to finish packing. This did not take long. We then went downstairs to check out. I was given a piece of the local embroidery as a present. The staff at the hotel that had started to feel like family even though we had only been there for a few days asked for a photo with us. We were happy to oblige. The person who we thought was a government inspector offered to take the photos. Graham and I handed her our cameras, too. While we were taking photos, our driver arrived. This was the same driver we had the previous day. The sad time of having to say goodbye arrived. After we said our goodbyes, we left. We left from a different station than the one we arrived at. 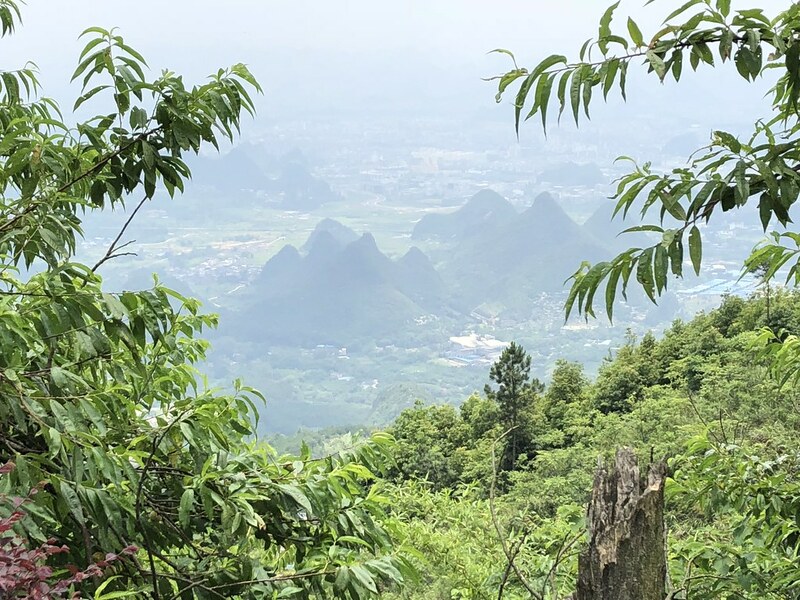 In the process, we saw a different part of Guilin. It did not take us long to get there and we said goodbye to our driver. We went through security and entered the station building. 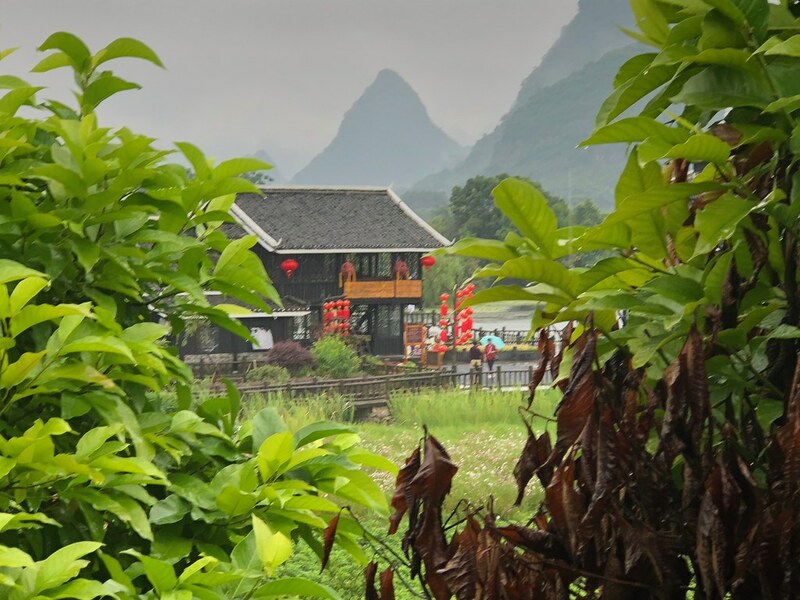 Guilin North station is one of the more traditional stations. Rather than being a big open plan space like the stations at Shenzhen and Guangzhou, this one had multiple waiting rooms for the different platforms. Each waiting room serves a couple of platforms. Because we had a clear run to the station, we got there a lot earlier than we had anticipated. Our train was not even listed yet. We went to the closest waiting room and sat down. Shortly after we sat down, we were joined by a female student. She said that she had a long wait for her train and wanted to practise her English. I did not mind chatting to her at first. She was very polite and spoke very good English. However, after a while, I started to feel very uncomfortable. I could not put my finger on what made me feel this way, but I was very relieved when Graham came back from the bathroom and told me that our train was now listed, and we needed to go upstairs. I said goodbye and left. When we got to the waiting room upstairs, it was absolutely packed. It did not take long until check in started and this was very efficient. Even so the line looked huge and we were near the end, it only took about 5 minutes until we were checked in. There was a covered bridge leading to the platform and there were different entrances that were clearly labelled with the closest coaches for each entrance. We found the right entrance and headed down to the platform. Our coach was the second closest from the entrance. We stored our luggage and found our seat. We had a very smooth journey again. 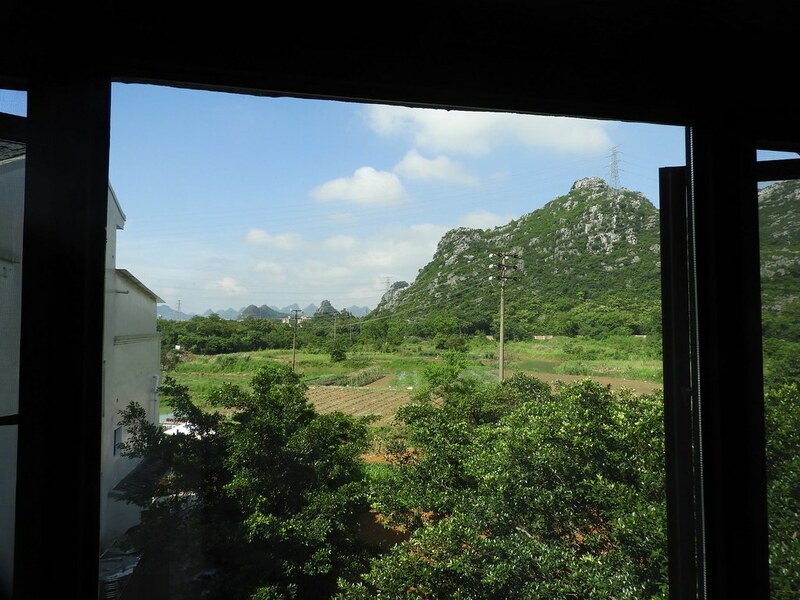 I passed the time with a mix of admiring the scenery, reading and playing my game. 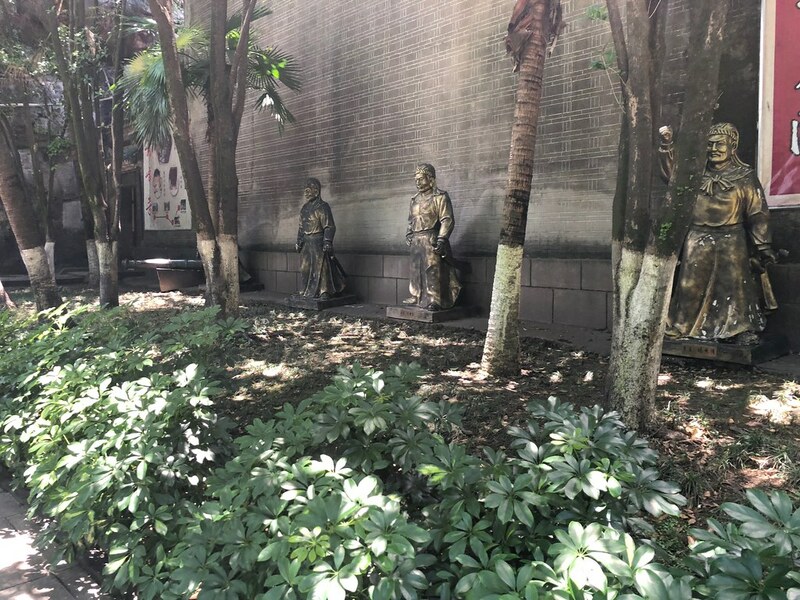 We had hoped to get some lunch at the station in Shenzhen, but somehow, we completely bypassed the station building. We decided to push on to the border crossing and get something to eat in Hong Kong. We went to the metro station and got our ticket back to Futian crossing. A train pulled in just as we got to the platform, but this was already pretty full and there were a lot of people waiting. We decided to wait for the next train and walked towards the front of the platform. This definitely paid off and we even got seats. When we got off the metro, we headed straight upstairs to the border crossing. For some reason it took us longer to leave the country than it had to enter it, but we were soon on our way. We walked back over the bridge and the formalities to enter Hong Kong did not take very long. As we headed towards the MTR station, we found a convenience store. Graham had a ham and cheese sandwich and I had a sausage baked into a bread roll. We still had some water, which we shared. 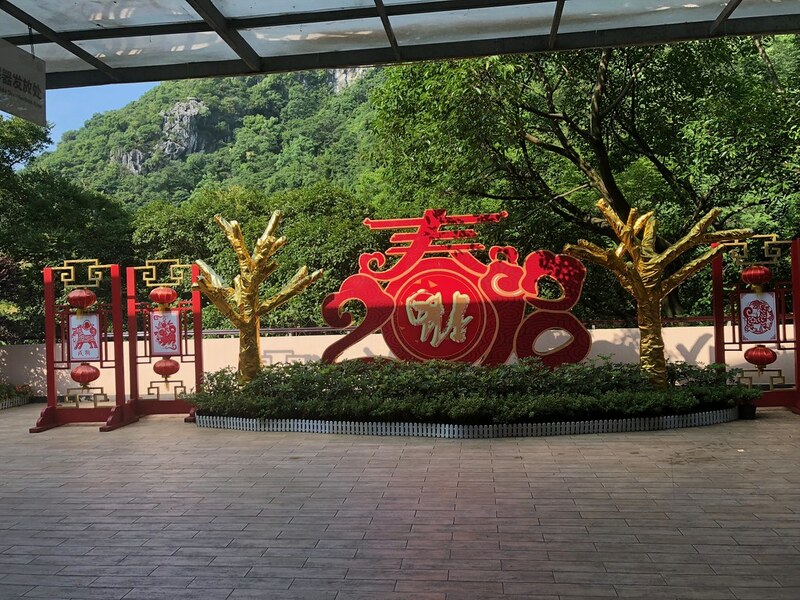 There is a nature reserve right next to the MTR station and there is a waiting area right next to the shops with picture windows overlooking the nature reserve and also screens showing footage from further away. We enjoyed the views while we were having our food and water. 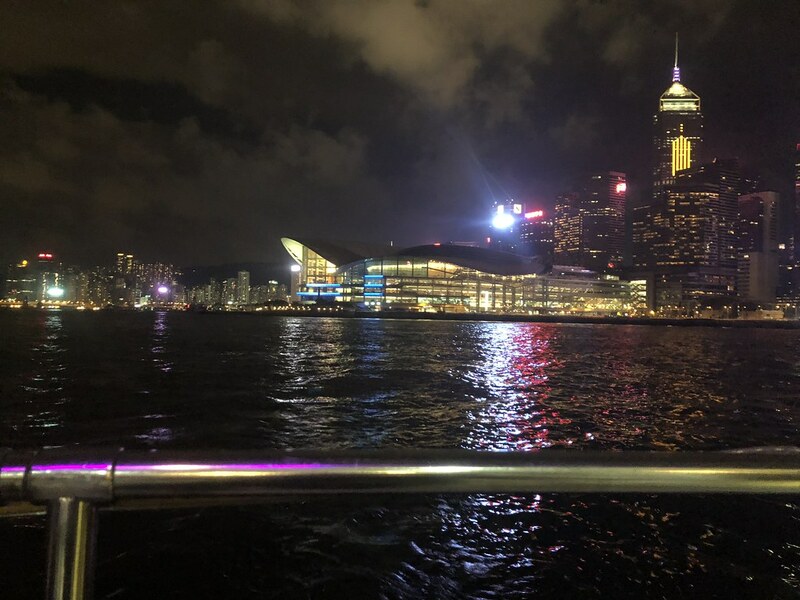 As we were heading downstairs to the platform, it dawned on me that we would hit Kowloon and Hong Kong Island during the rush hour. That did not exactly fill me with joy. I knew we would be OK at this end as this was somewhat off the beaten track and also at the terminus station. We made arrangements where we would meet up again if we got split up, but fortunately this was not needed. 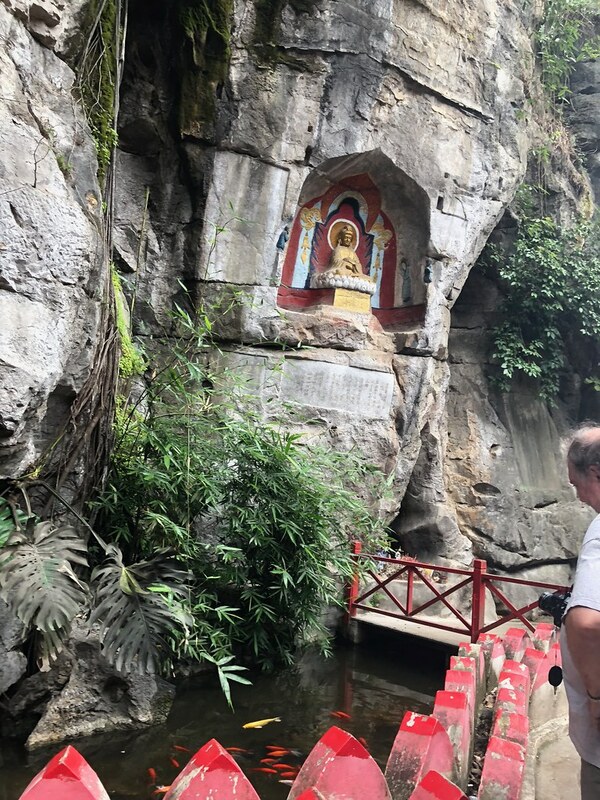 We made good progress and even with multiple changes of MTR lines, it did not take us too long to get to our destination. 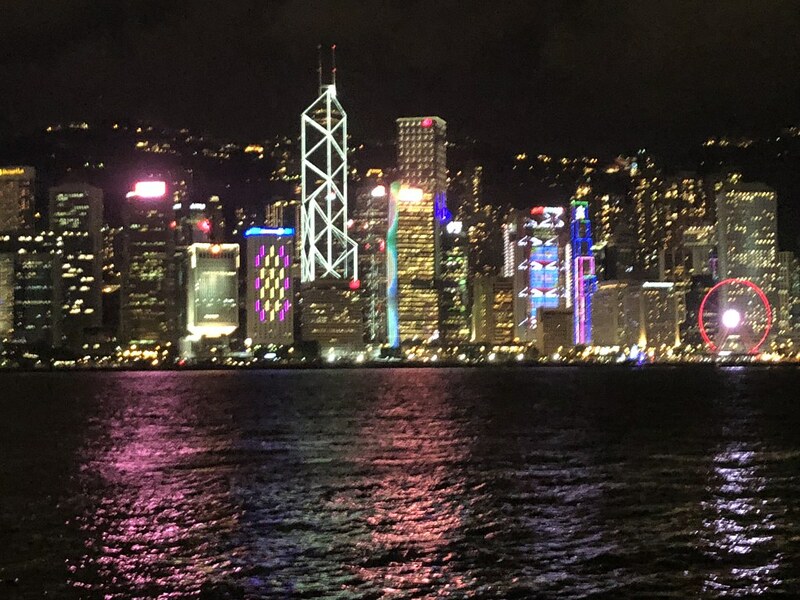 We had one last night in Hong Kong and for this we were booked in the Ibis North Point. 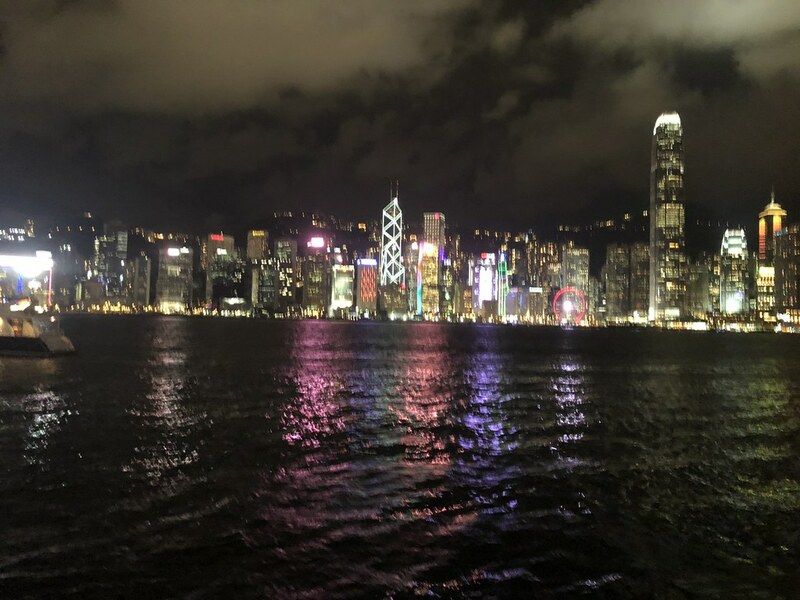 It was only a short walk from the North Point MTR station. The hotel is a little unusual in that there is actually nothing on the ground floor apart from some lifts and the staircase. The reception is on the first floor. We took the lift up and got checked in. This was an efficient process and we were soon on our way to our room. We had a short period of downtime and then we headed out again. 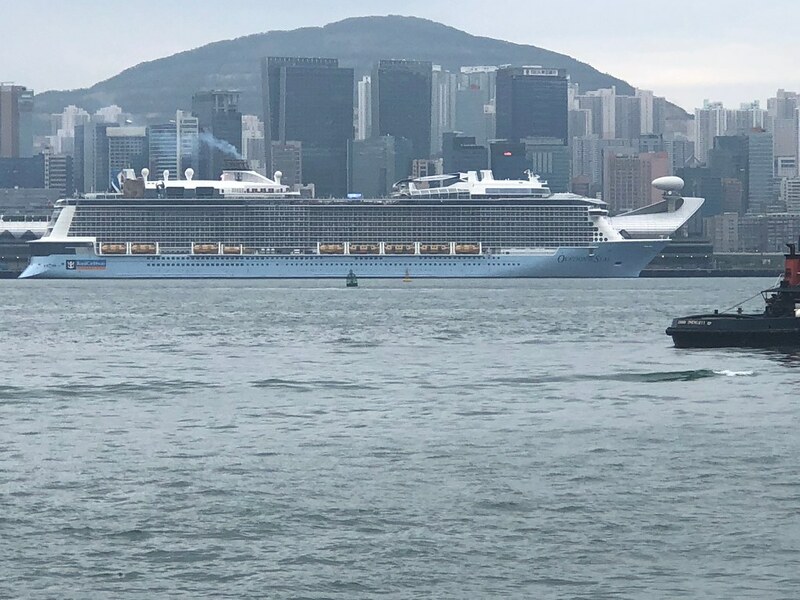 Ovation of the Seas was in port again that day and I wanted to check out if I could see her. We went exploring. It did not take long until I got a glimpse of her. 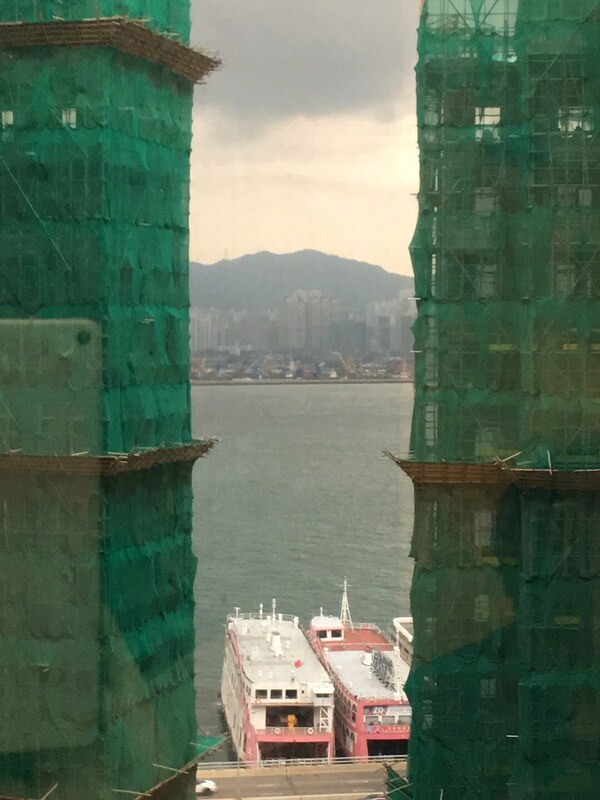 Unfortunately, there is a lot of building work going on along the waterfront and construction fences blocked my view. We did figure out that we would get a good view from the ferry pier building and decided to check out if we could get inside without a ticket. This was no problem and I got a good view of Ovation. We then headed back to the MTR station. 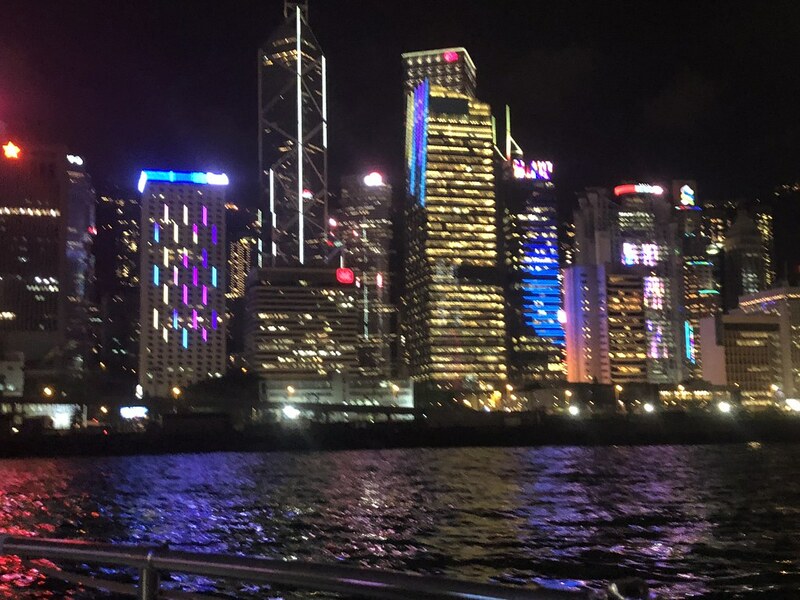 We had a Symphony of Lights harbour cruise booked for that evening. This is where we really hit the rush hour. I quickly researched if there was an alternative way for getting to the pier where the harbour cruise was leaving from. 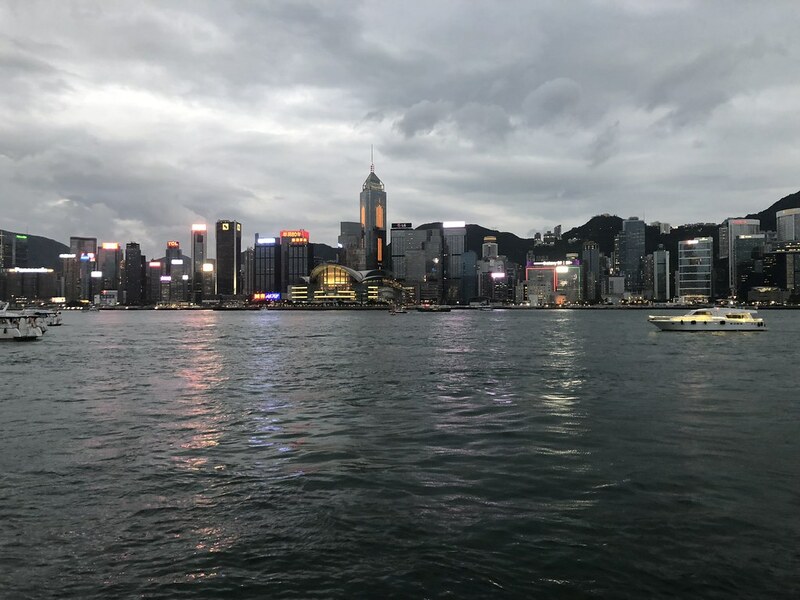 This research told me that we could get a ferry from Wan Chai, which meant that we could avoid Central station, which I am sure would have been heaving at that stage. The plan was generally sound, but again, there was a lot of building work going on in this area meaning that we ended up having to take a detour to the ferry pier. We were lucky, and a ferry had just pulled in when we got there, and we soon were on hour way. This also meant we had now used every mode of public transport available in Hong Kong - cable car, bus, MTR, tram, funicular and ferry. At the other end, the ferry pier is just across the street from where the pleasure boats go from. 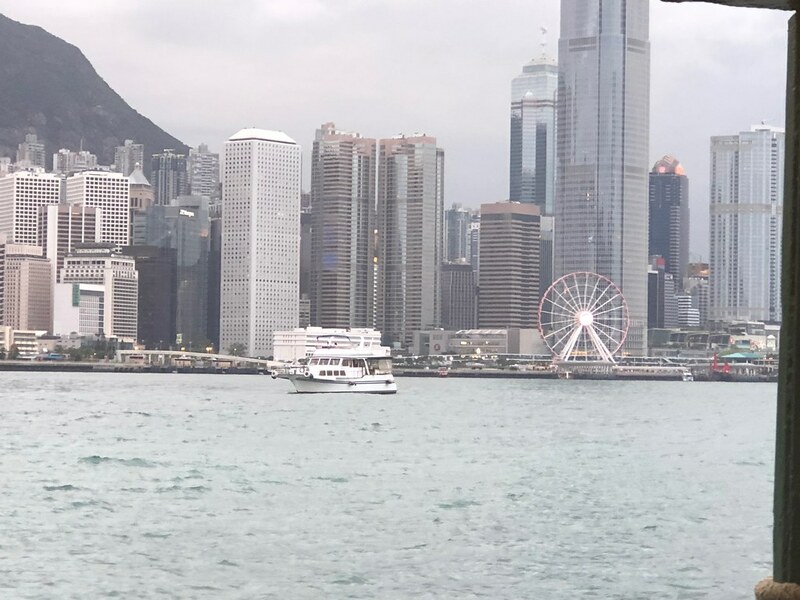 We arrived quite early, but we had a fantastic view over Victoria Harbour. Waiting was no hardship. Around the check in time on our voucher, a boat that looked like the one I had seen on the website docked at the pier we were supposed to leave from. We went over there, got in line and got on. It turned out that this was not our boat, but a private charter. Shortly afterwards, representatives from our tour company arrived. 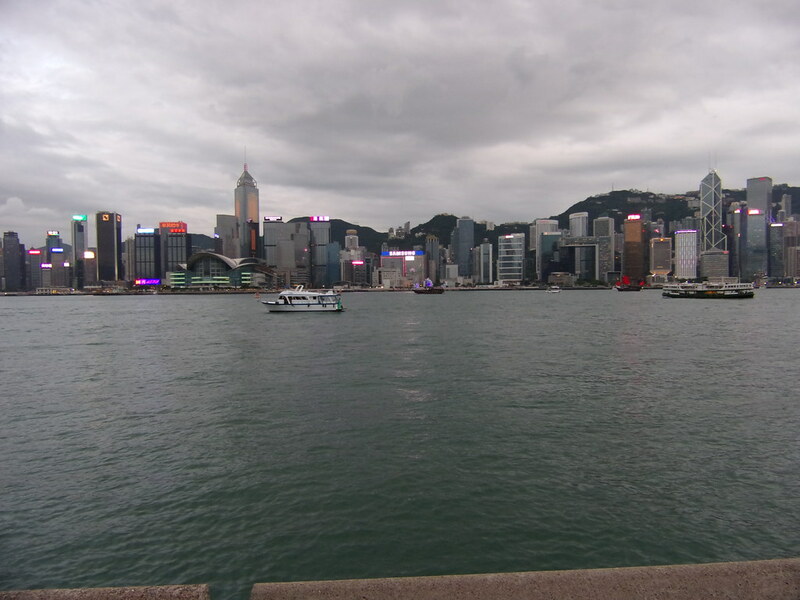 The people of Hong Kong are not quite as punctual as the people on the mainland. We got checked in and the boat arrived shortly afterwards. We got on. Downstairs was the bar and an indoor sitting area. There was also a little outside sitting area. Most of the open deck was upstairs and this was accessed by a ladder. I did not like the look of this at all. Graham was not bothered either way, so we went to sit down on the outside sitting area downstairs. We were soon joined by two couples from Canada and a family of 4 from India. We set sail soon after we got on the boat. They definitely did not hang around. 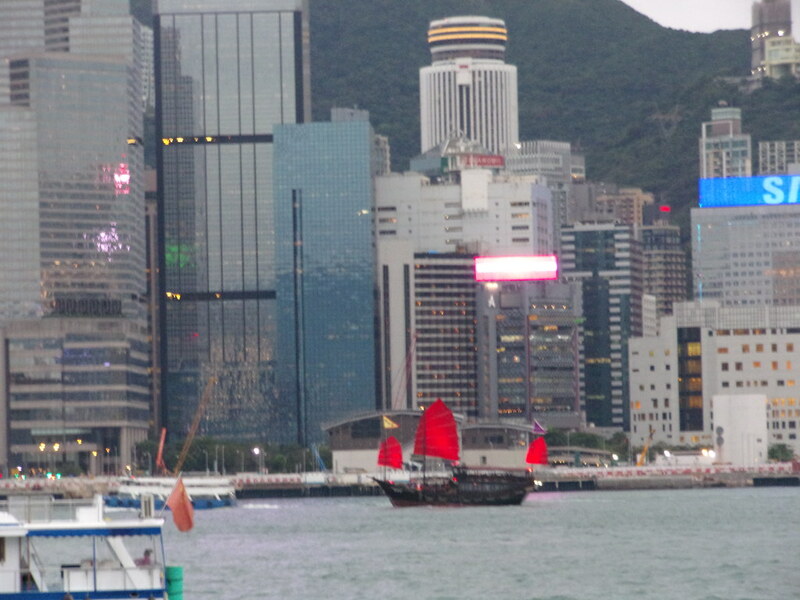 There were a lot of boats sailing around Victoria Harbour. 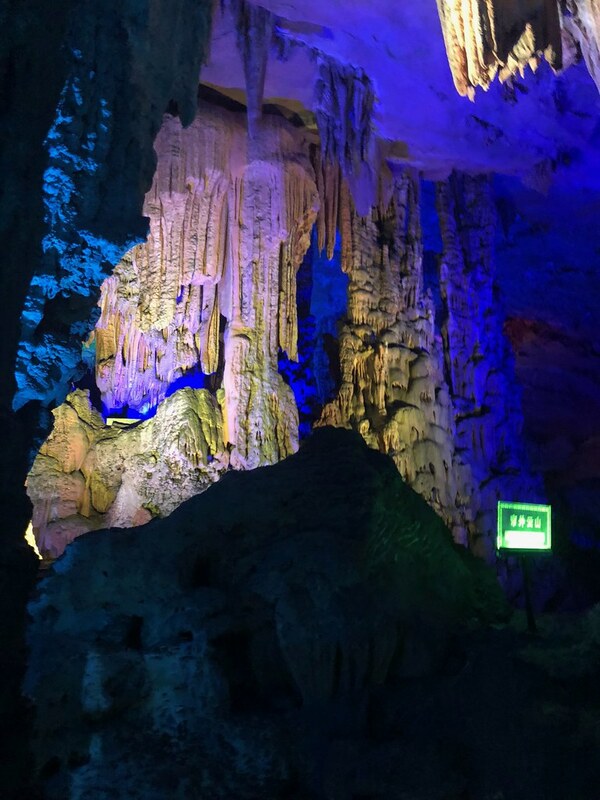 We took a circular route and the area looked very pretty all lit up. We were offered drinks and they put out snacks. Graham had a beer and I had a Coke. The snacks were Doritos and a mix of nuts and beans. About halfway through, we were offered another drink. Graham had another beer and I had a Fanta. 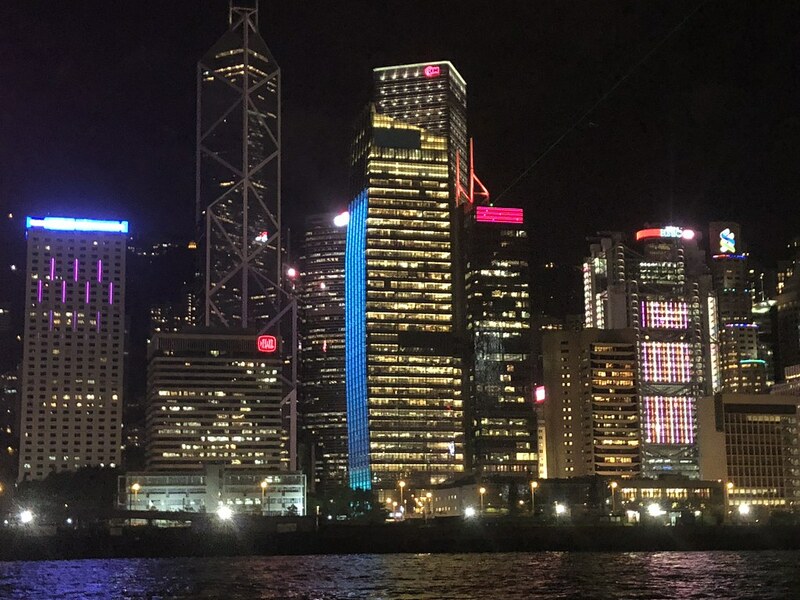 Shortly afterwards, Symphony of Lights started. To say that I was decidedly underwhelmed would be the understatement of the year. I had read before this trip that this was an absolute must see. I kind of had visions that this would be the same kind of thing like A Galactic Celebration or Illuminations at Disneyland Paris: projection mapping, lasers and all kinds of special effects. It consisted of a couple of illuminated screens showing text, a few lasers and some music. I could not help thinking how different it would have been if Dubai had something similar. 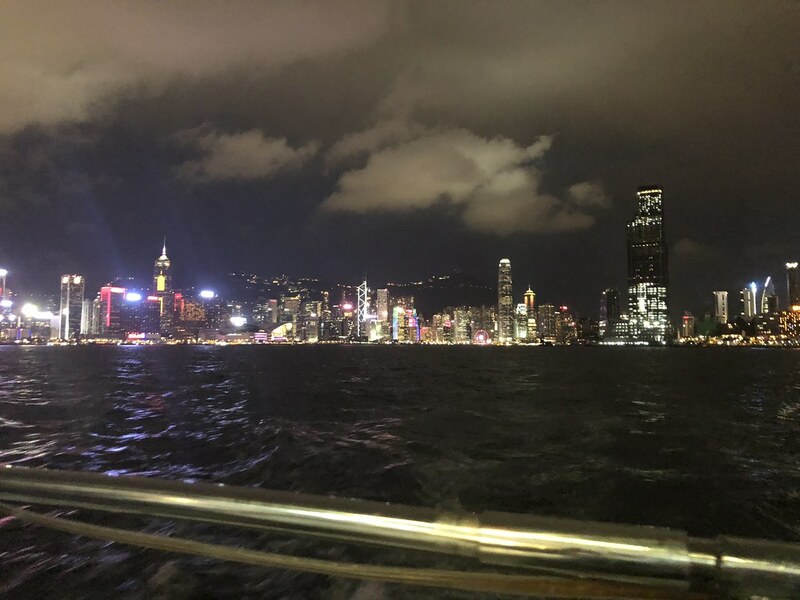 We did enjoy the harbour cruise part, so it was not a complete waste, but I would not do this again. 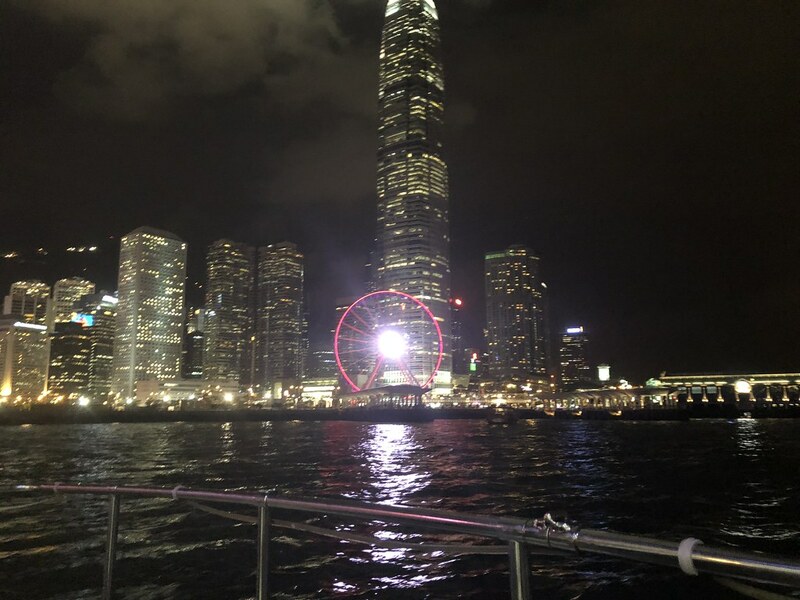 Pretty much as soon as Symphony of Lights was over, we went back to the dock. We decided to take to the ferries again. 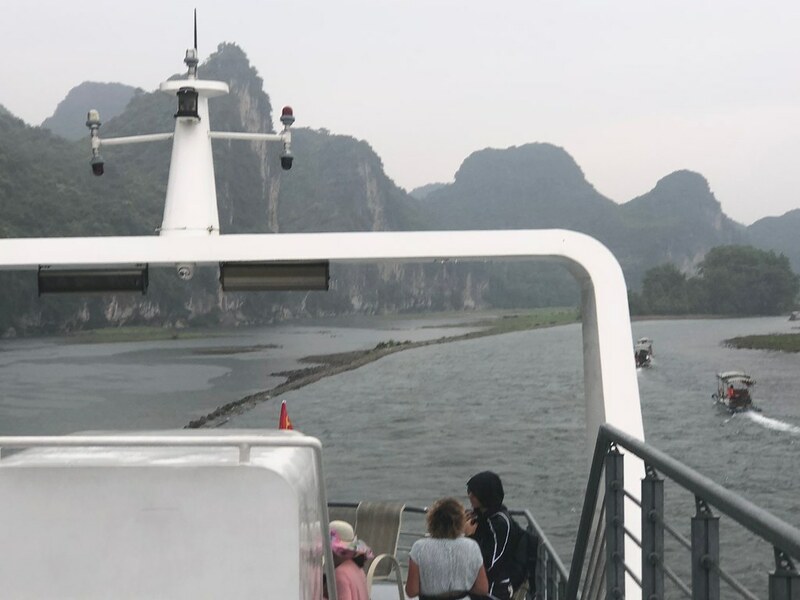 We ended up taking the ferry to Central this time. We managed to get seats on the upper deck. 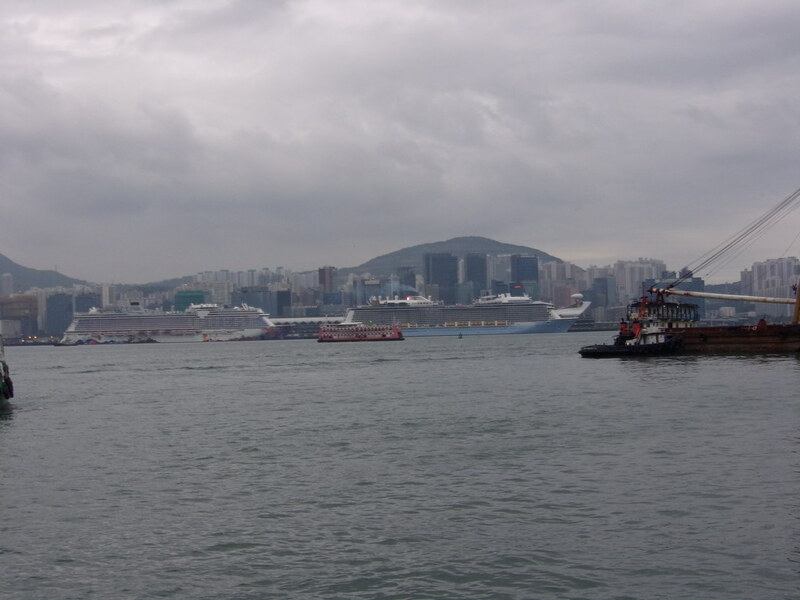 The crossing did not take long, but the ferry dock was a fair walk from the MTR station. We took to the trams again. Even though one of the terminus stations of the trams is called North Point, this is actually quite a way off. 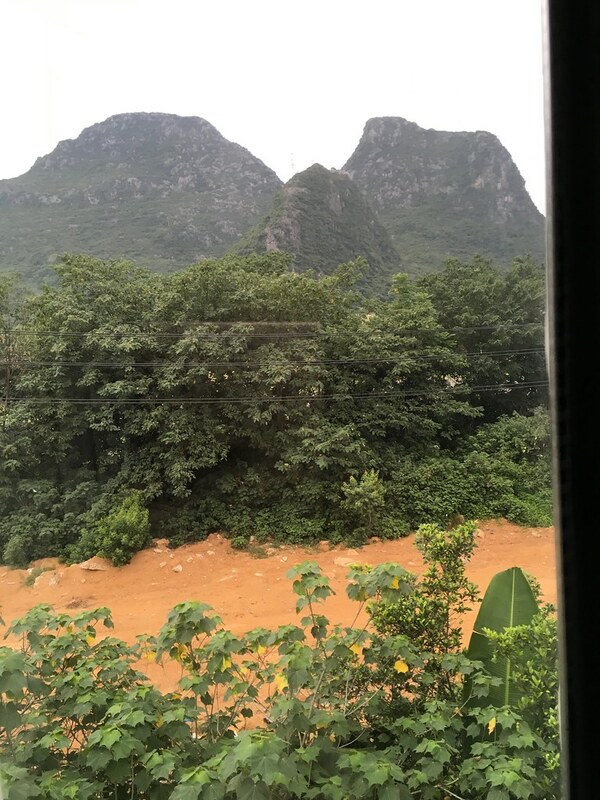 We found a crossroad that took us in the right direction and soon we were on the street where our hotel was, and I could see the local MTR station. Graham crossed the road and headed deeper into the neighbourhood. 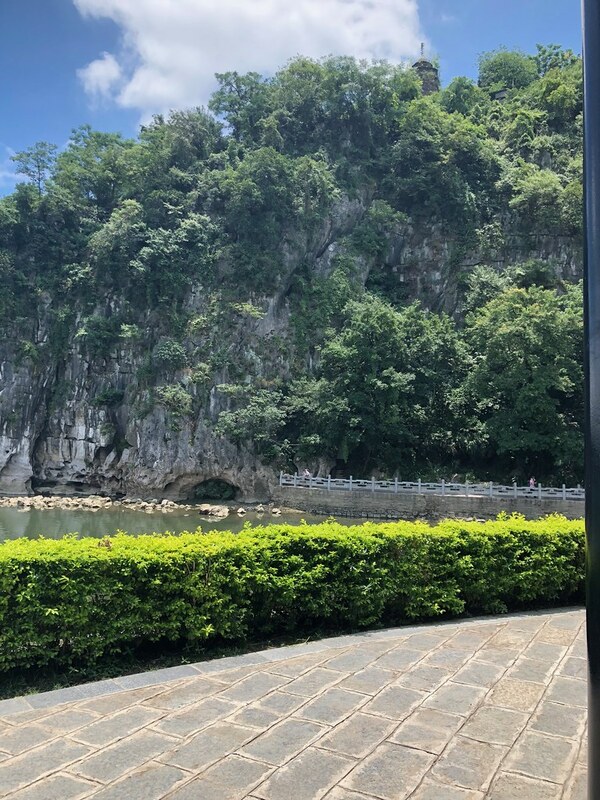 We had discussed that we would get something to eat near the hotel after the boat trip and as I knew that he had explored the area around North Point while I was at Hong Kong Disneyland, I assumed that we were heading to get something to eat. It turned out that Graham had not realized that we were close to the hotel and we were thoroughly lost. I had lost all sense of direction as we had been weaving in and out of side streets and alleys. In the end, we came out near Tin Hau MRT station and took the MTR back to the hotel. By that time, it was quite late, we were tired and neither of us felt like eating. We headed back to the hotel and got ready for bed. 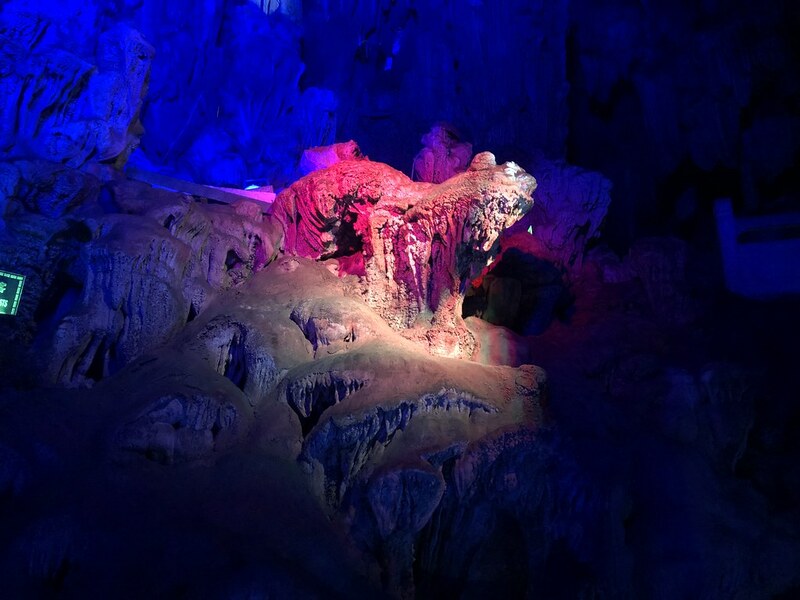 That was an amazing day with the caves and mountain! Wow! I got behind in October and then got sick so I caught up on about a week of your TR in one day! 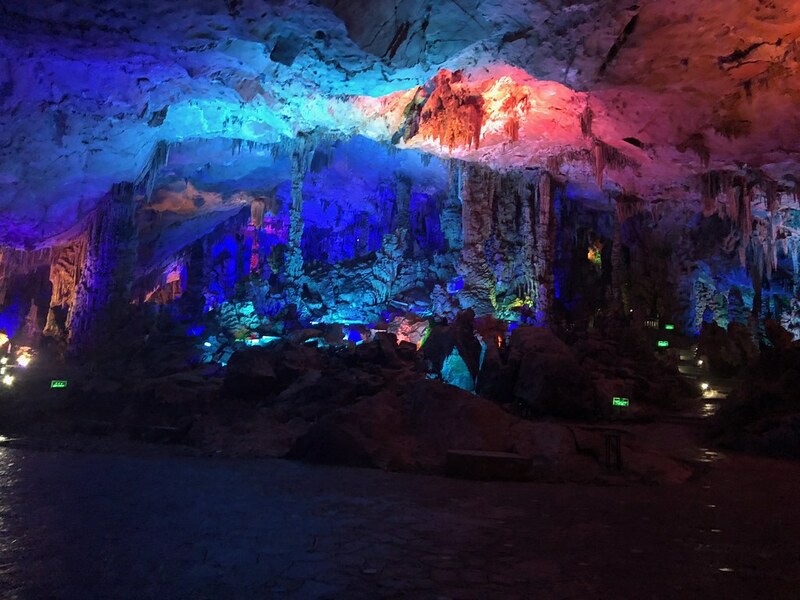 It sounds like you had a lovely cruise and a great time in Guillan, the caves were really neat. 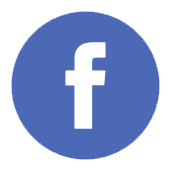 You did a lot of other fun things and I see from FB that you are back doing other fun things as well. 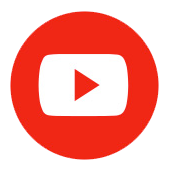 Catch up with you when you get back! Where are you , Corinna ? Have I missed something ... a new TR somewhere that I have not come across ? Hope you and Graham are well and that you are just too busy to entertain us right now.